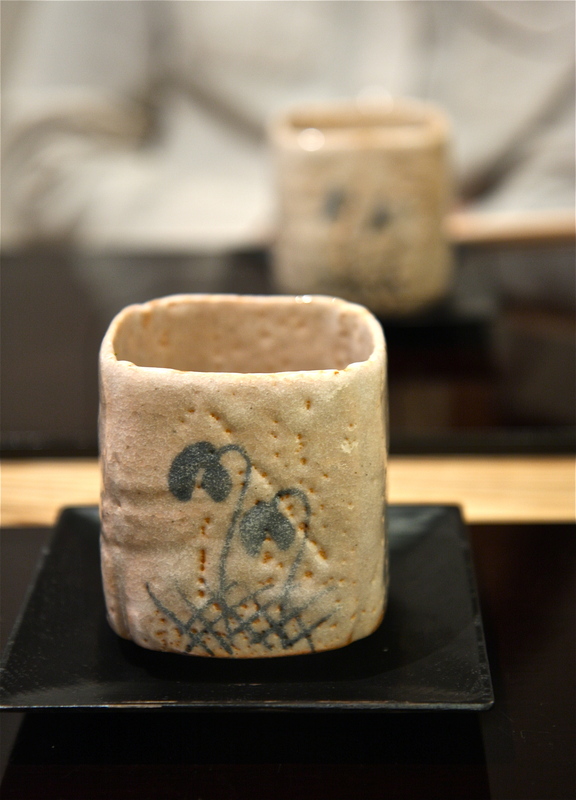 Tea master Sen no Rikyu (1522-1591) expressed the four principles of chanoyu, the Japanese ‘Way of Tea’, with four characters: Wa Kei Sei Jaku (harmony, respect, purity, tranquility). 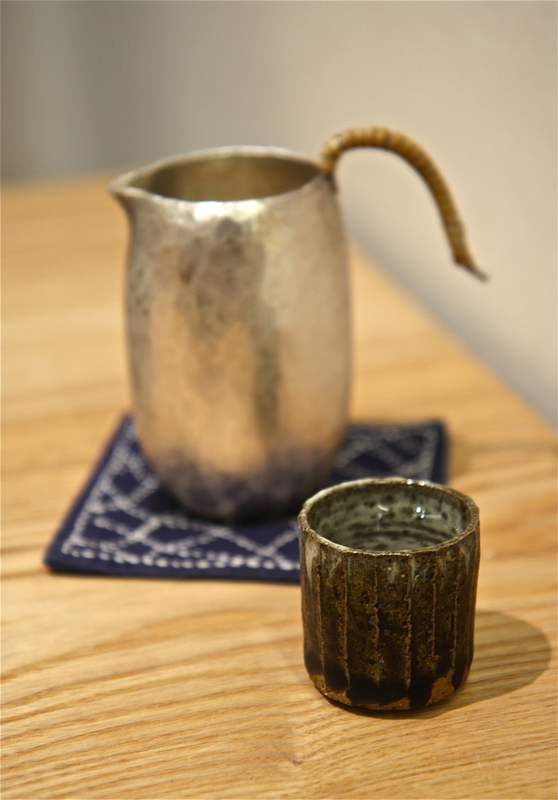 They are the principles that practitioners of tea integrate into their craft and their daily lives, and what has now become synonymous with Japanese hospitality. 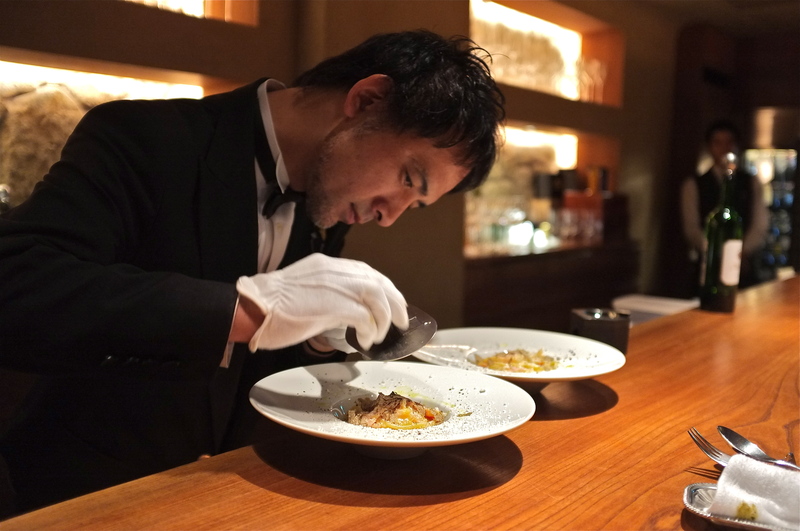 Peace, humility and selflessness are how the Japanese try to live (albeit with a hefty dose of shyness), and the service industry is also built on these teachings. 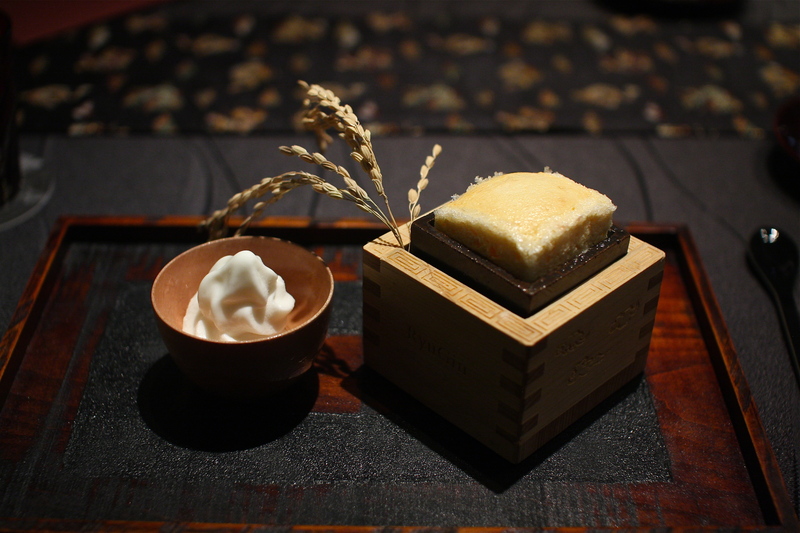 Such Japanese hospitality is taken to an entirely different level in a traditional ryotei where a diner can experience ultimate bliss through a kaiseki meal. 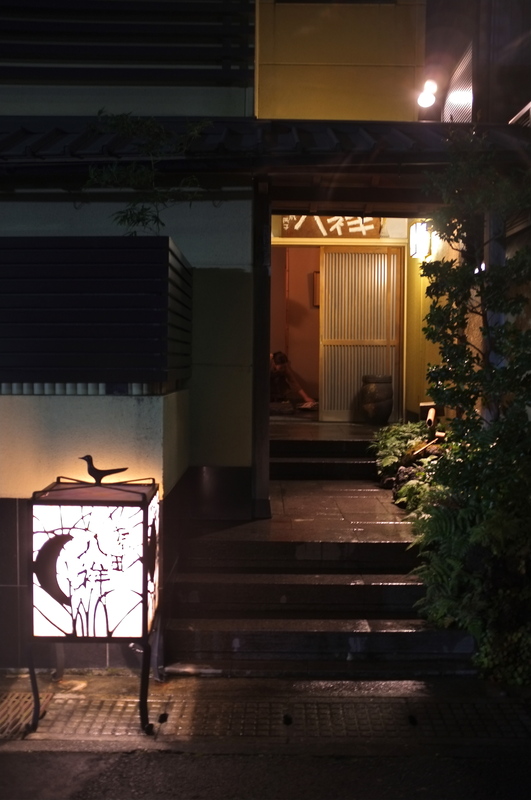 Japanese hospitality begins the moment one calls to make a reservation at a place like Kohaku, a quaint ryotei that opened last fall in Kagurazaka, a beautiful neighborhood in Tokyo where real geisha can still be seen walking along the cobblestone streets. 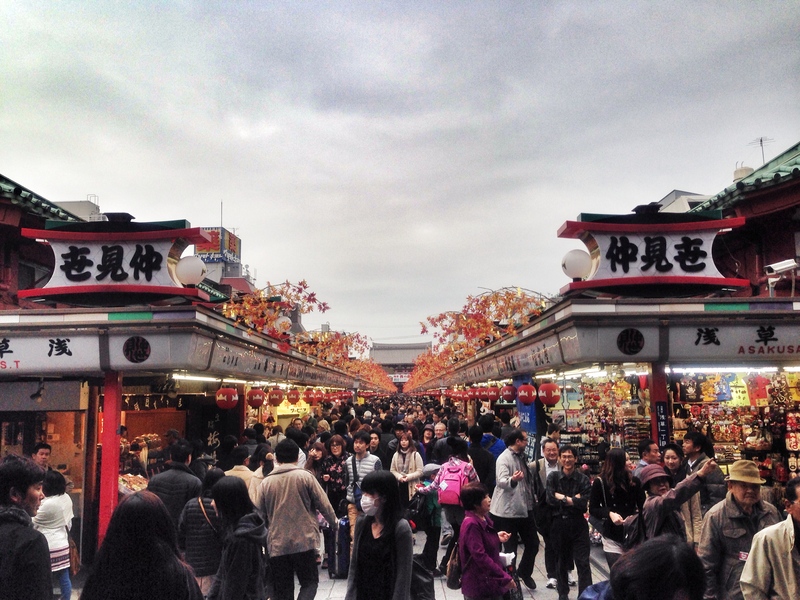 Through winding roads, narrow alleyways and mysterious staircases lit with lanterns, Kagurazaka seems like a maze, but it is one of the most charming areas of the city where one can time travel back to old Tokyo. 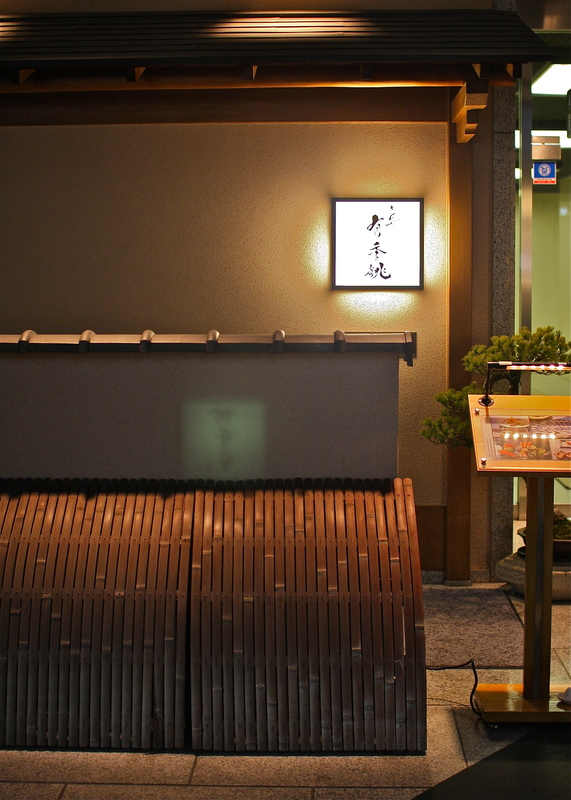 While many ryotei in Kagurazaka maintain a strict policy of ‘Ichigen sama okotowari’ (‘We respectfully decline first time customers. 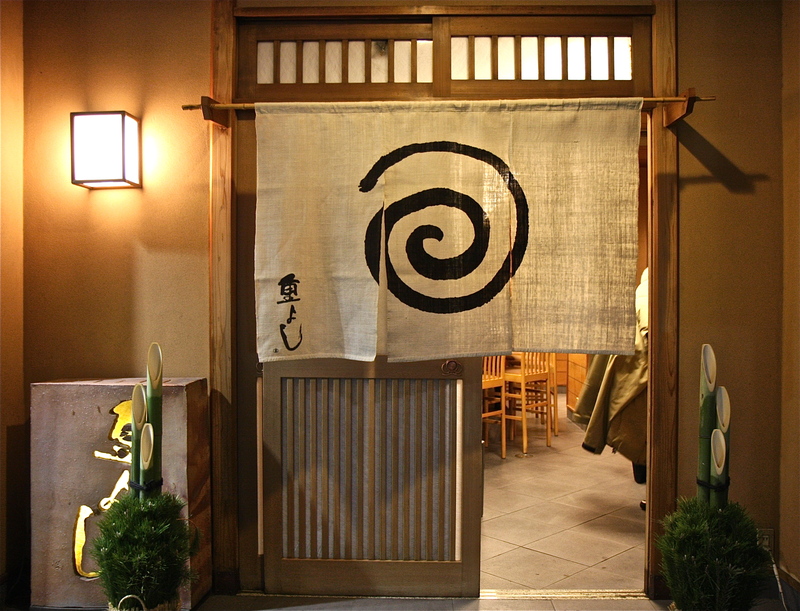 Reservations are only made with the introduction from a regular customer’) as a way to honor and respect their regular patrons, most, like Kohaku, have an open door policy. ‘Thank you very much for calling Kohaku. We will be awaiting your arrival on your reservation day,’ they said, promptly following the call with a fax of a map and directions to the restaurant. 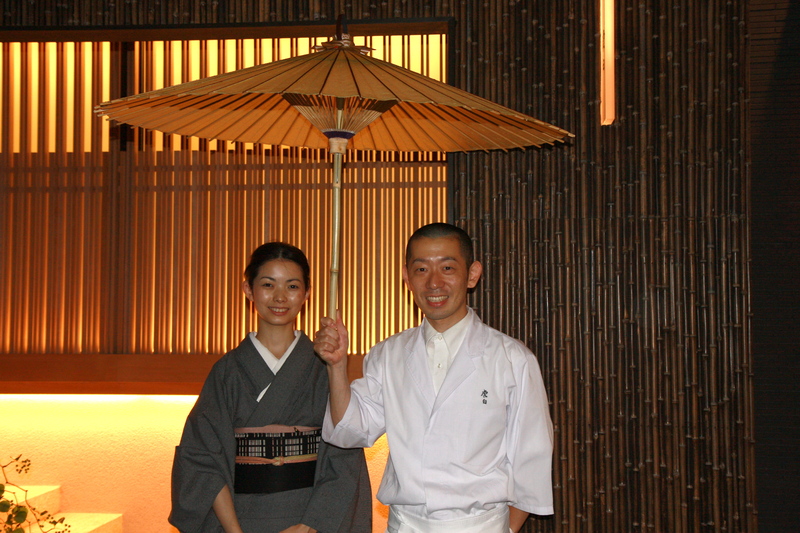 On the evening of my dinner, they indeed were waiting for my arrival out in front of the restaurant entrance with beautiful Japanese umbrellas ready to protect me from the light drizzle of rain that the dark grey clouds were about to deliver. Welcome, they said with warm smiles, addressing me by my name as if they knew me, and I instantly felt like I was coming home to a familiar place. 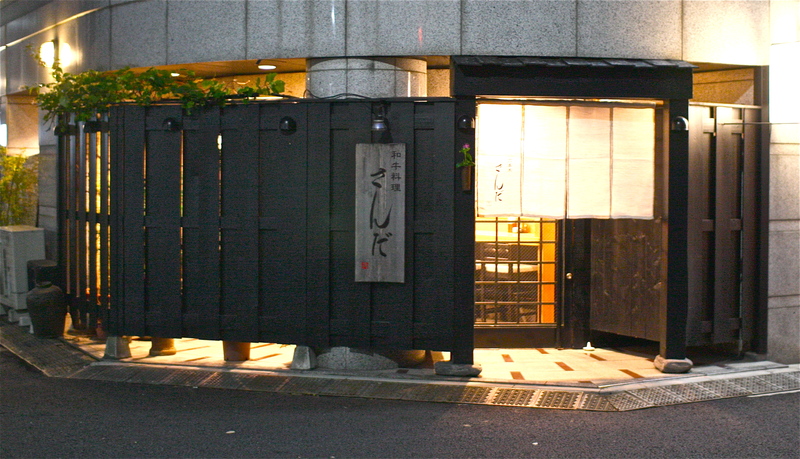 Kohaku is the more casual sister restaurant to famed 3 Michelin star Ishikawa, a traditional ryotei in Kagurazaka run by Chef Hideki Ishikawa. 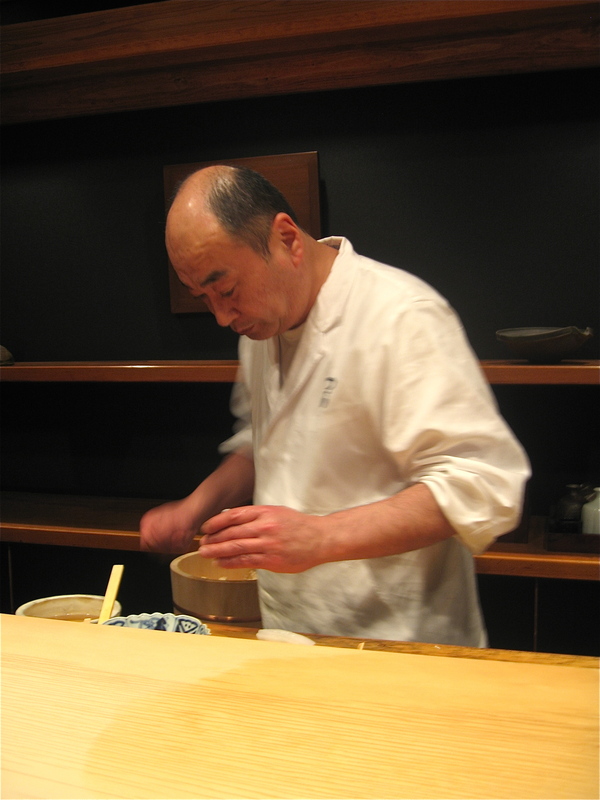 Kohaku’s chef and owner, Koji Koizumi, was at Ishikawa from the very beginning, serving as Ishikawa’s right hand man for years. 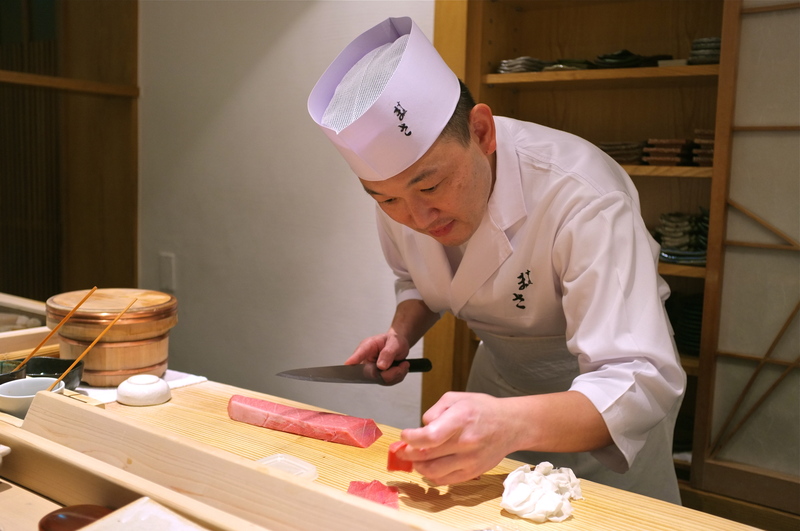 When Ishikawa moved his Michelin feted establishment to a new location in 2008, it was an easy decision to trust Koizumi to make something special out of that space. 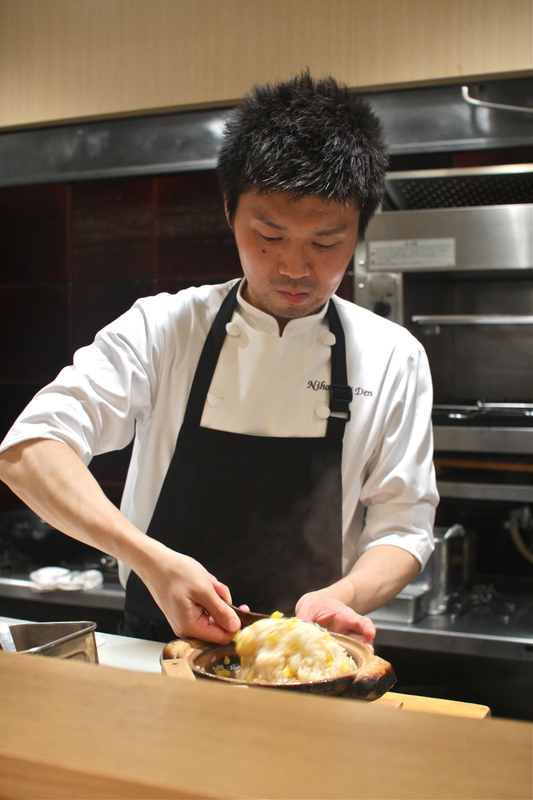 While Ishikawa stays true to traditional Japanese kaiseki flavors and concepts, Kohaku ventures into the modern, incorporating ingredients not usually associated with Japanese cuisine and giving kaiseki an avant garde twist. 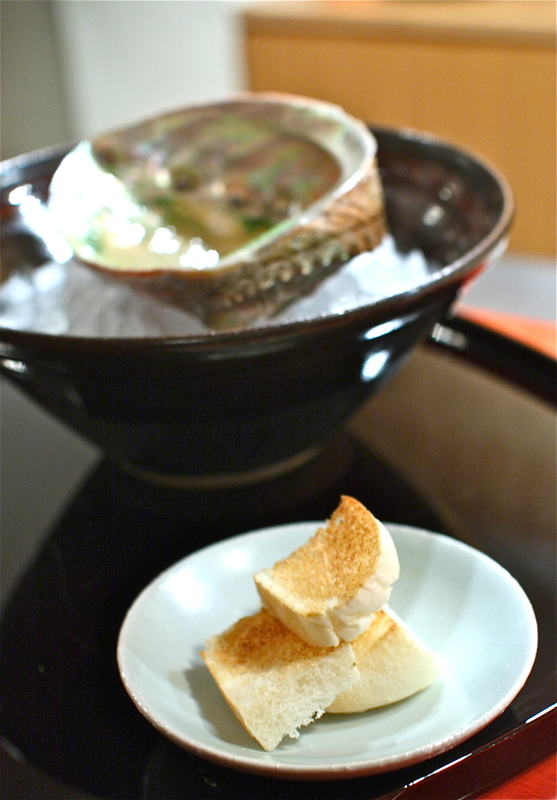 The kaiseki begins with a delectable dish of uni in its own spiny receptacle, filled with layers of light refreshing flavors and crisp textures. 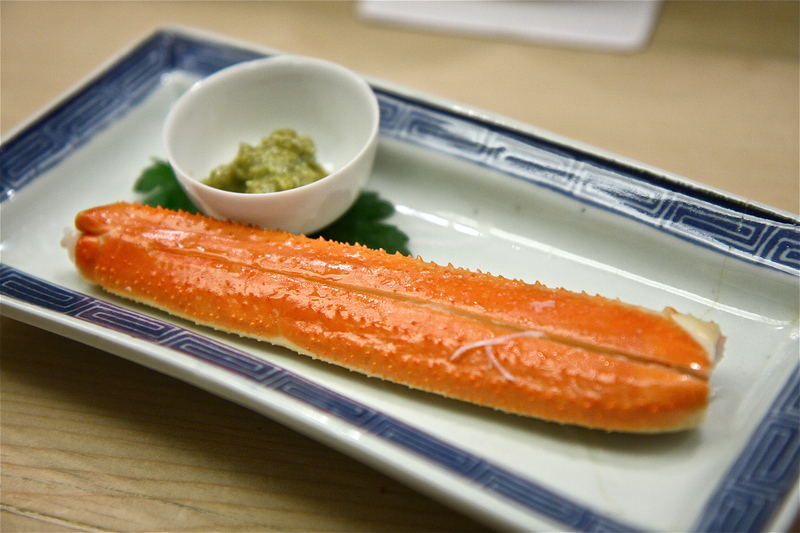 Diced cucumbers, crunchy and fresh, are followed by slippery junsai that slide across my tongue like water-striders on a pond. 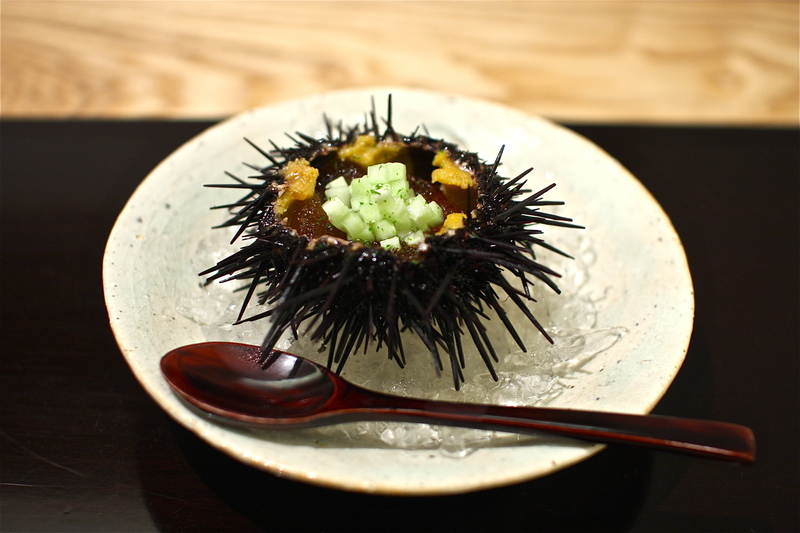 Chilled yuzu gelée, perfectly sweet and tart, add bright summer notes to the buttery sea urchin for a memorable dish that starts the kaiseki off on a high note. 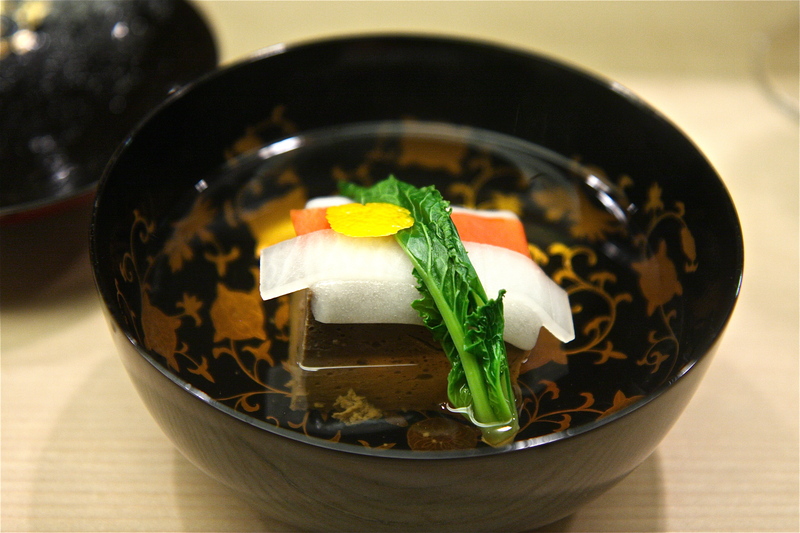 Chef Koizumi’s food at Kohaku can perhaps be classified as nouveau kaiseki, introducing a different way to enjoy this elegant style of Japanese cuisine. 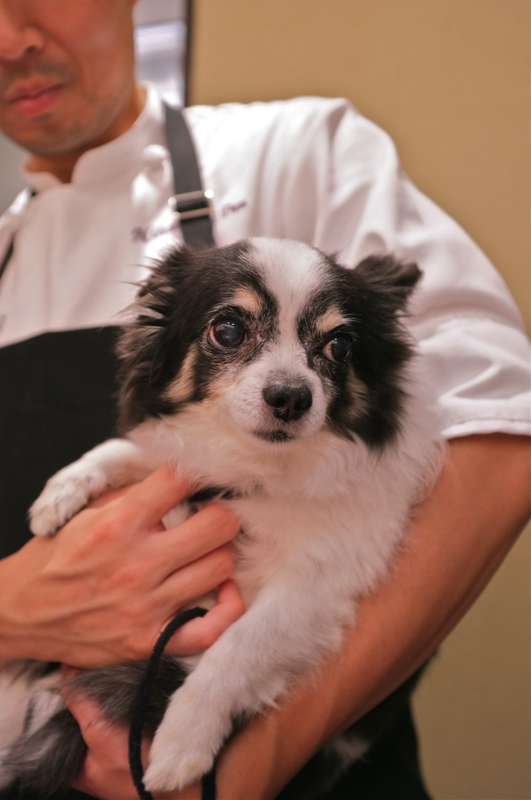 His playfulness can be seen throughout his courses, enough to intrigue the diner’s curiosity but fortunately without compromising classic flavors and preparation. 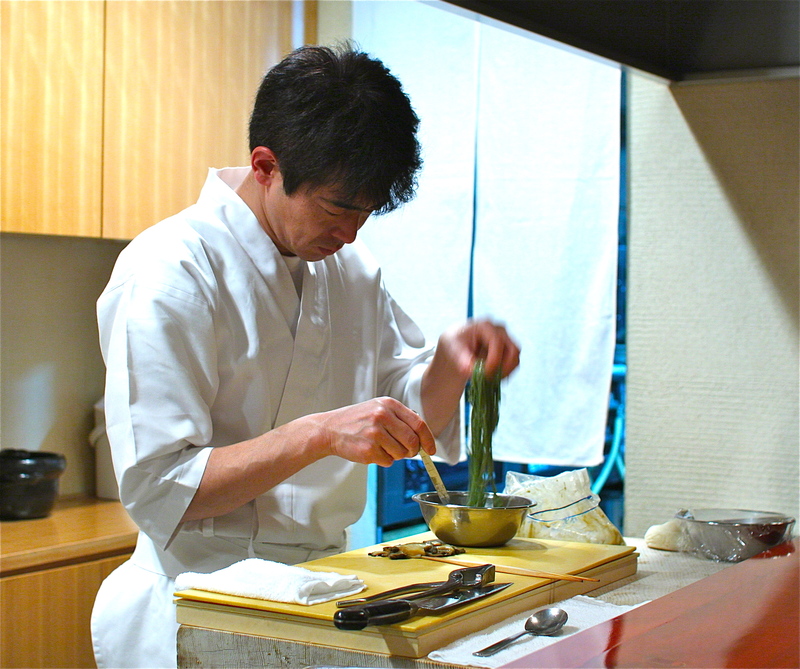 There is nothing more important in Japanese cuisine than tradition, and he stays faithful to that concept while presenting his tasteful creativity. 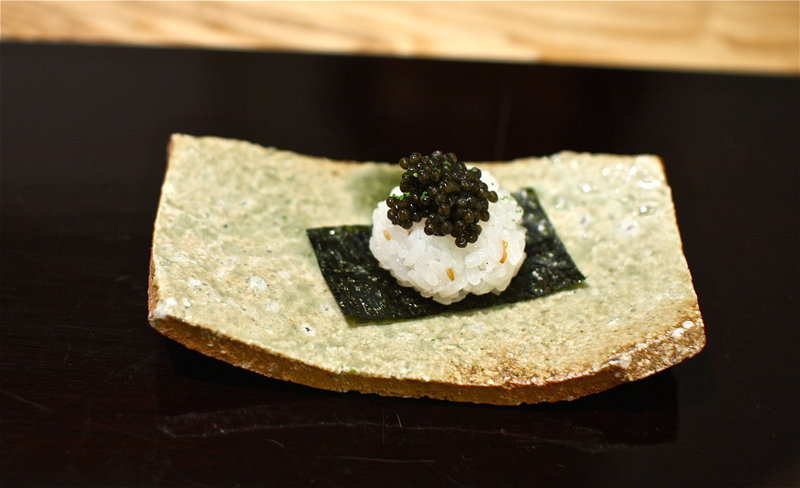 The temari sushi course, for one, delightfully perfumed with the enticing aromas of roasted sesame seeds and green yuzu rinds, showcases that prized brininess unique to caviar while bringing a level of familiarity and comfort to this non-native roe. 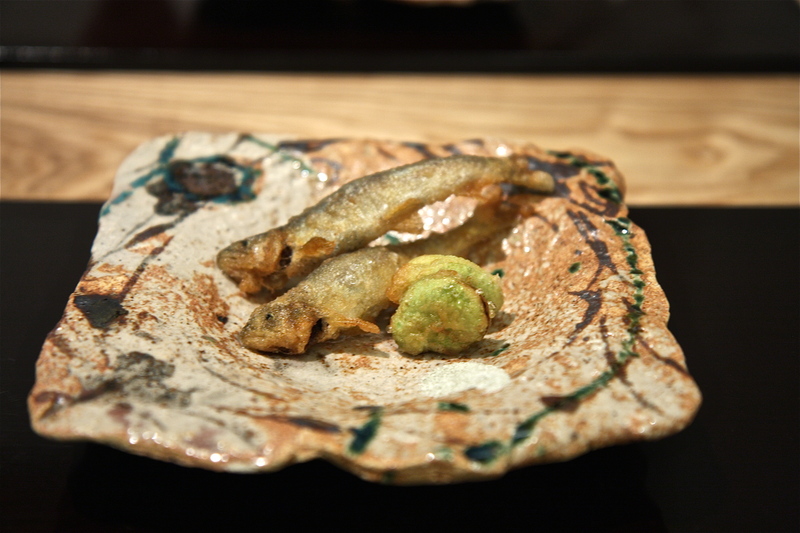 Yet at the same time, he excels and ultimately impresses with simple seasonal dishes like deep fried ayu, sweet finger-sized river fish eaten whole from head to tail, the slight bitterness of its intestines and a smidgen of seaweed salt the perfect complements to the watermelon-like flavors of its succulent flesh. 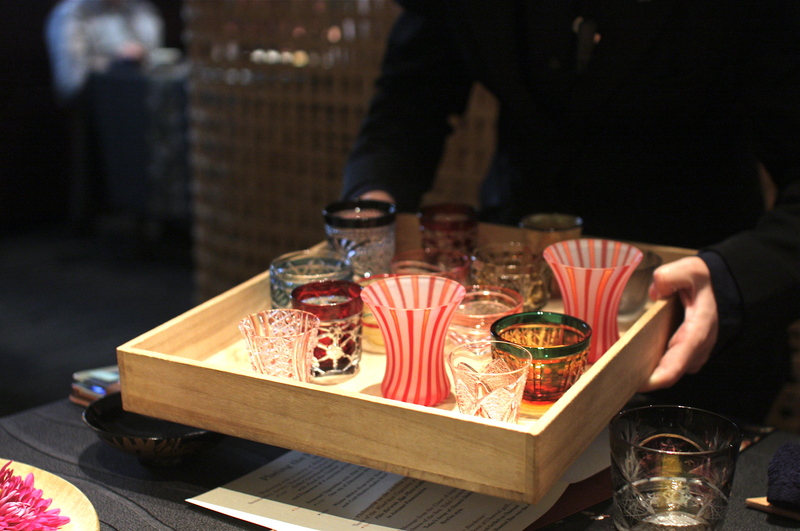 As with any traditional kaiseki meal, great care is taken in choosing the correct vessels for food and beverage, for it forms the framework within which to showcase the art. 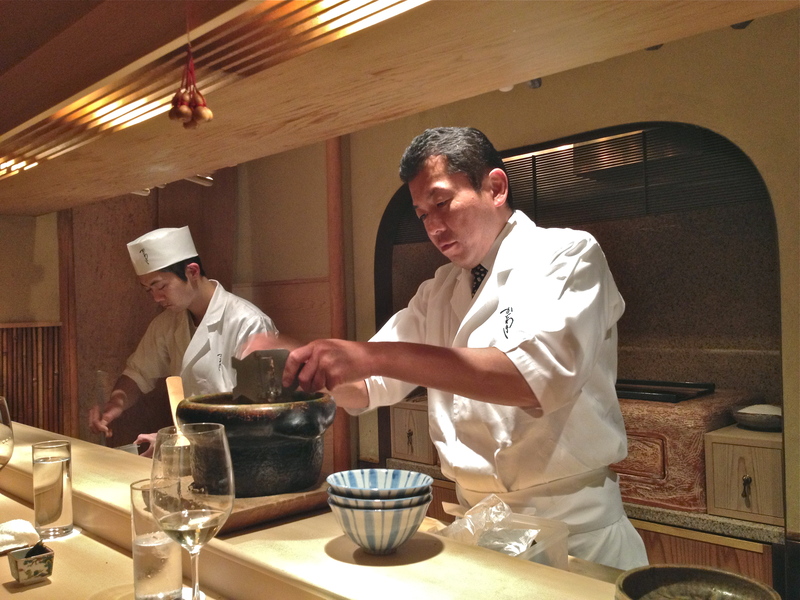 One can feel the sensibility of a chef through the ceramics and glasses that are used, and my moment of adoration for Chef Koizumi came when our sake arrived, perfectly chilled in a gorgeous hand hammered pewter cup, ready to pour into the most perfect little brown-glazed ochokos that made our sake taste unforgettable. 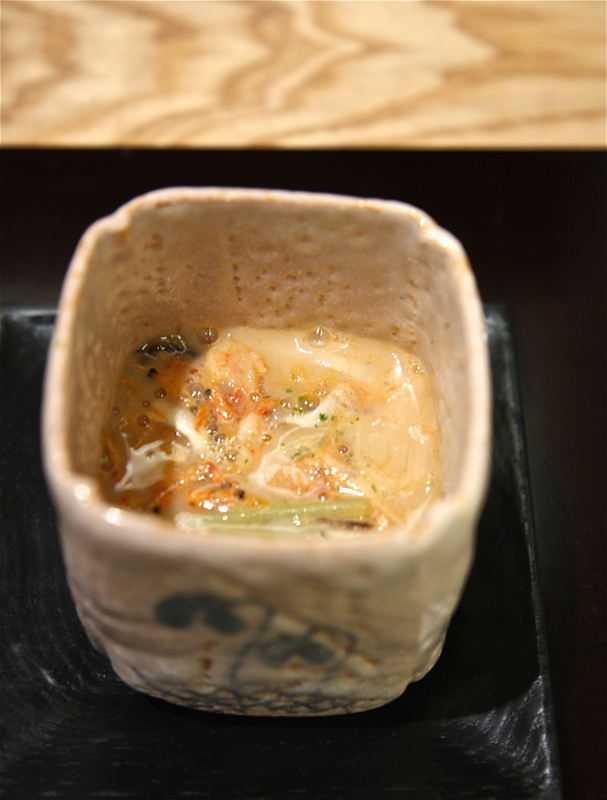 Tiny pinky crustaceans called sakura ebi, or cherry shrimp from Suruga Bay in Shizuoka prefecture, colorfully dot the surface of the warm somen noodle dish served in a white miso broth with shiitake mushrooms, mitsuba herbs and shaved white negi. 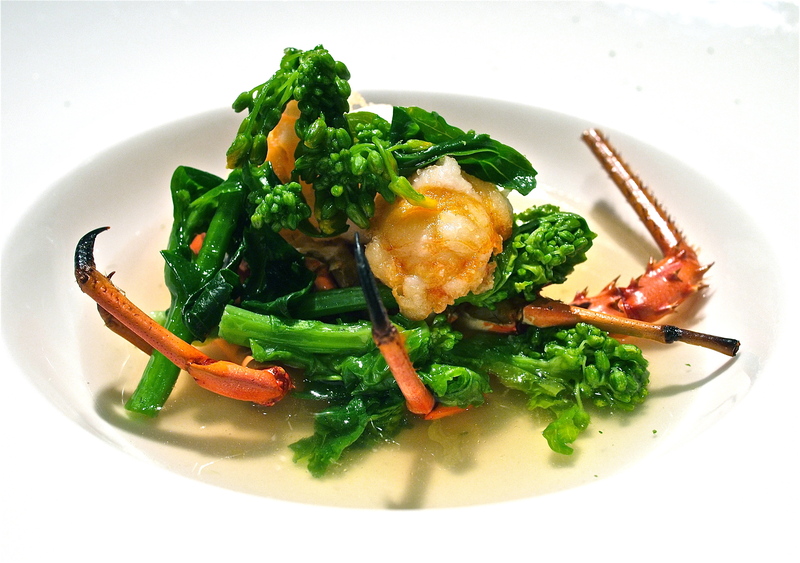 It’s a comforting dish, one that satisfies any craving, transporting its recipient to a full course of blissful slurping and a habit-forming shrimp high. 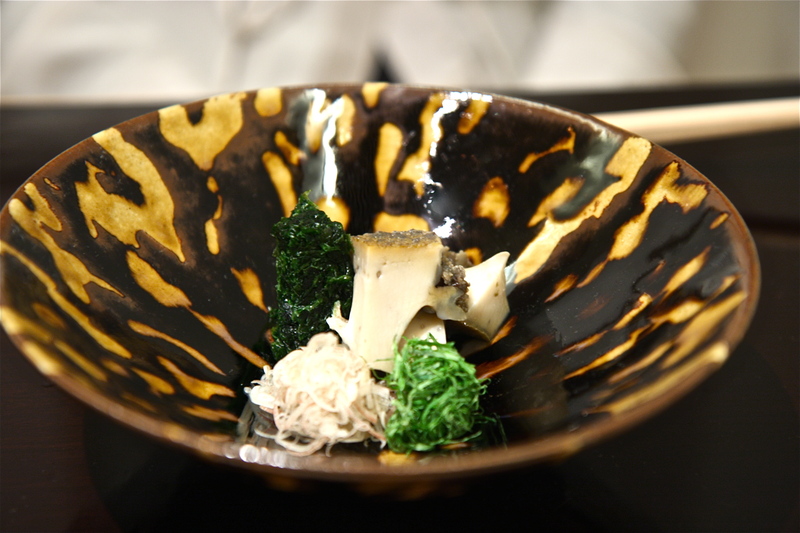 Sake steamed abalone, juicy and tender, excites with garnishes of shiso, myoga and seaweed ribbons for a simple yet satisfying tsukuri plate. 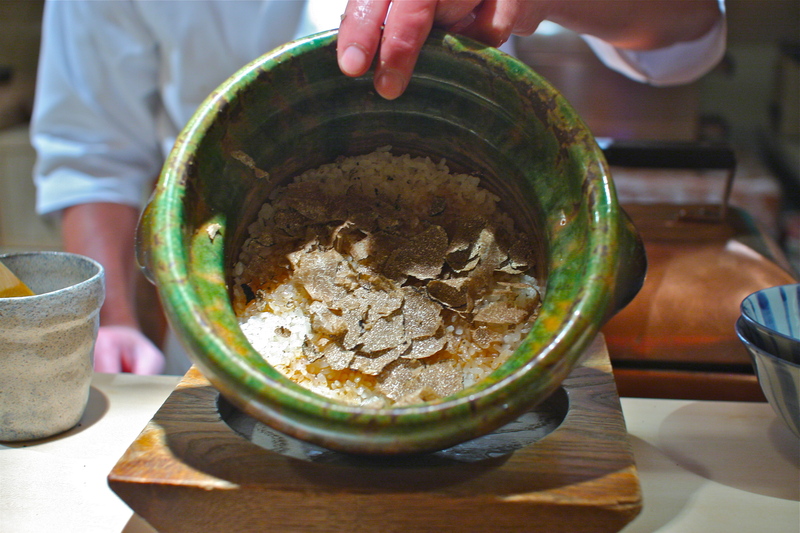 Early summer bounties unite in joyous celebration in a luscious creamy black truffle sauce brimming with beautiful earthy notes. 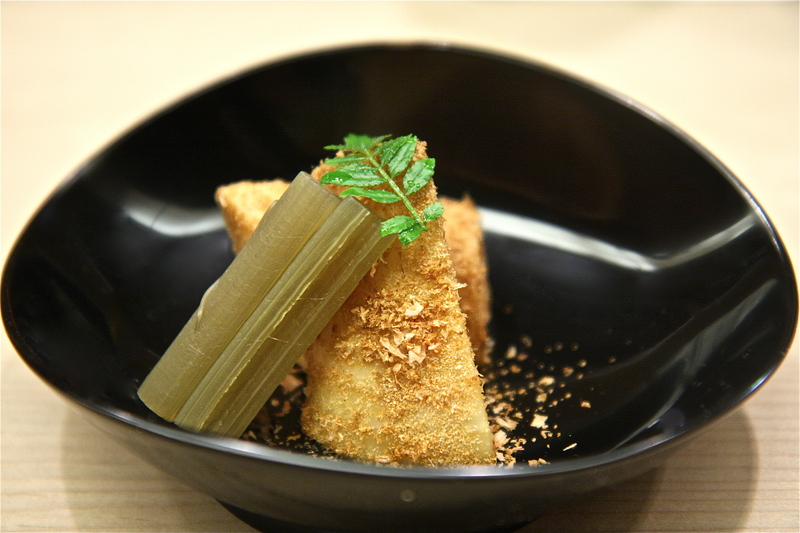 I bite into the thin stalk of himetake bamboo shoot and it reciprocates with a vigorous crunch and a delicate milky flavor. 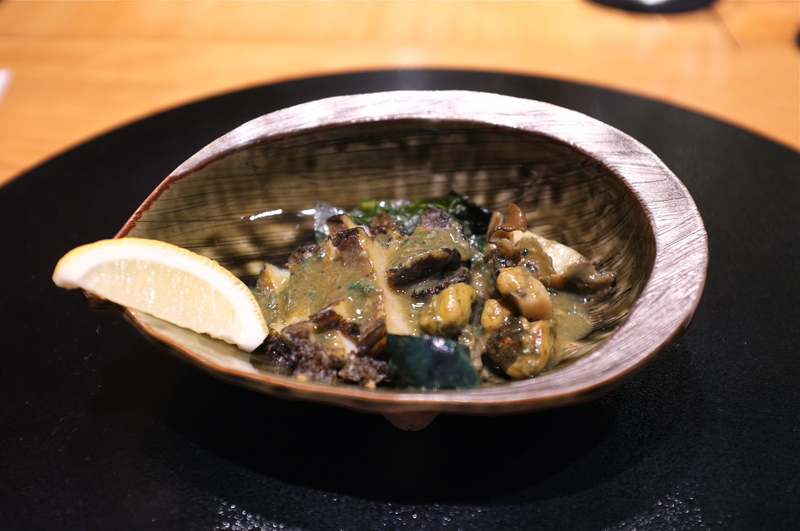 Juicy mizu nasu eggplants from Senshu are as sweet as apples and the ainame fillet, a rock fish only found in Japan around this time of year, tastes as happy as it looks to be bathing in truffle sauce. 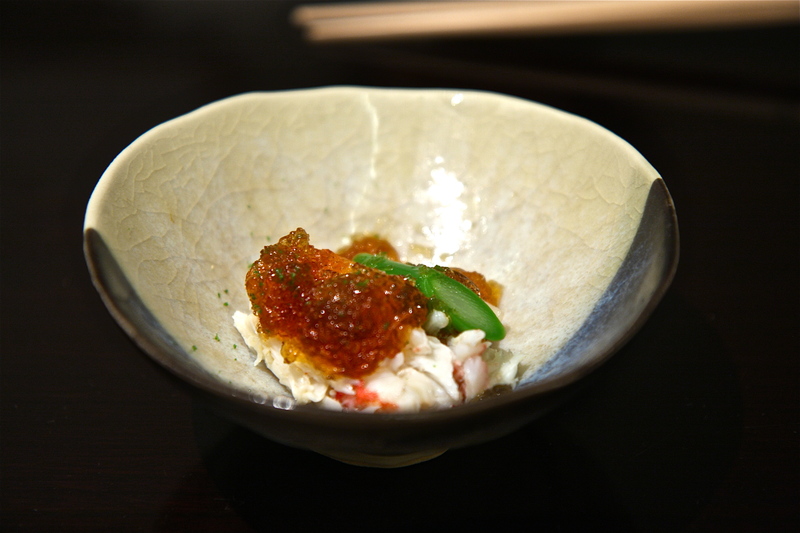 Chef Koizumi keeps the kegani hairy crab dish simple with a cut of asparagus and yuzu gelée, for the sweetness of the Hokkaido crab does not require much more than those little accents, and simplicity, after all, is one of the hallmarks of Japanese cuisine. 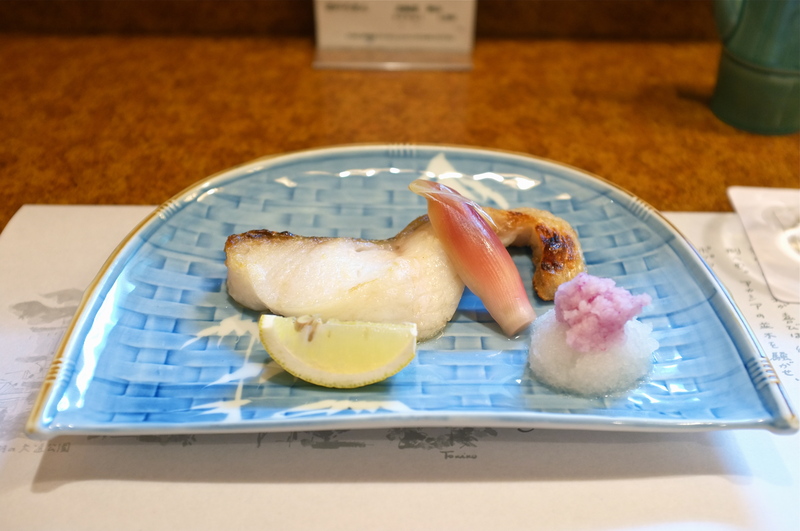 There is no summer ingredient that symbolizes the mastery of a Japanese chef better than hamo, or pike conger, a long powerful fish whose razor sharp teeth and vicious face are no indication of its delicate sweet white flesh. 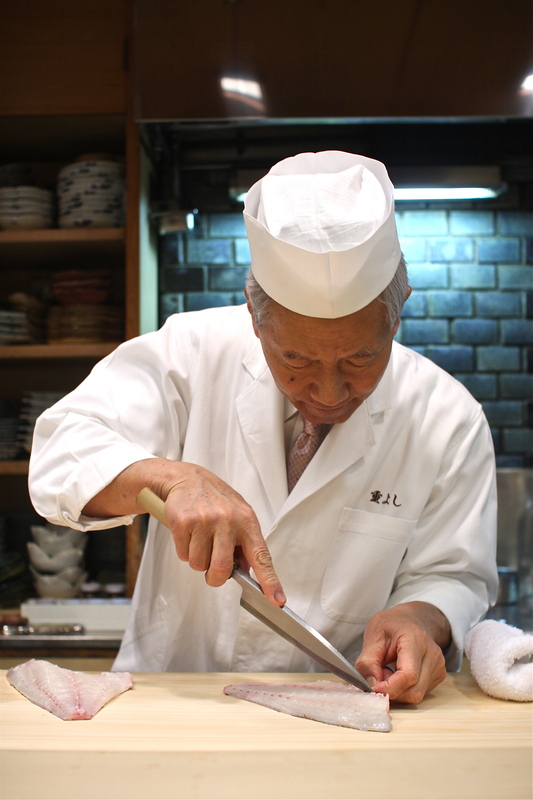 Hamo are laden with rows of tiny coarse bones that are impossible to remove, and only a skillful chef with superior knife skills can perform honegiri, making precise incisions into the bones without cutting through the skin. 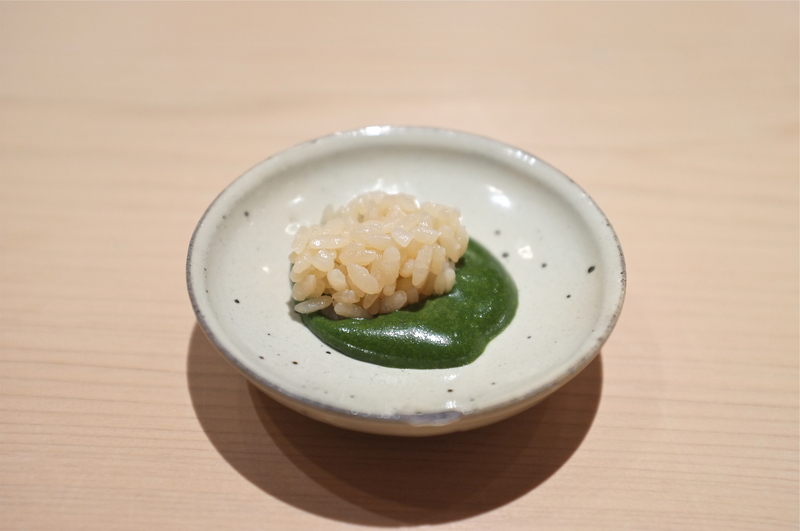 The result of Chef Koizumi’s workmanship is tender hamo, flesh and bones, tossed with myoga, shiso and hamo skin that has been blanched in hot water, proudly served on a bed of chilled pickled plum gelée that has been sieved to a fine texture. 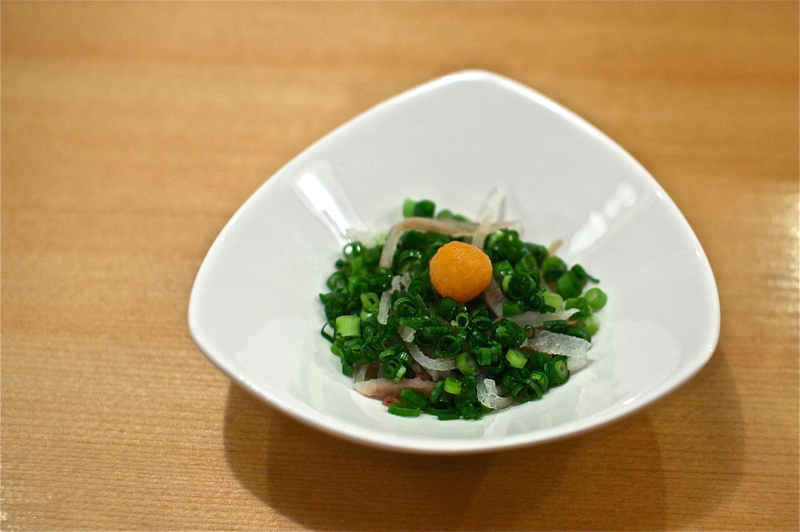 Little dollops of grated ginger, wasabi and spicy daikon radish allow the diner to enjoy different flavors to augment the tartness of the ume sauce. 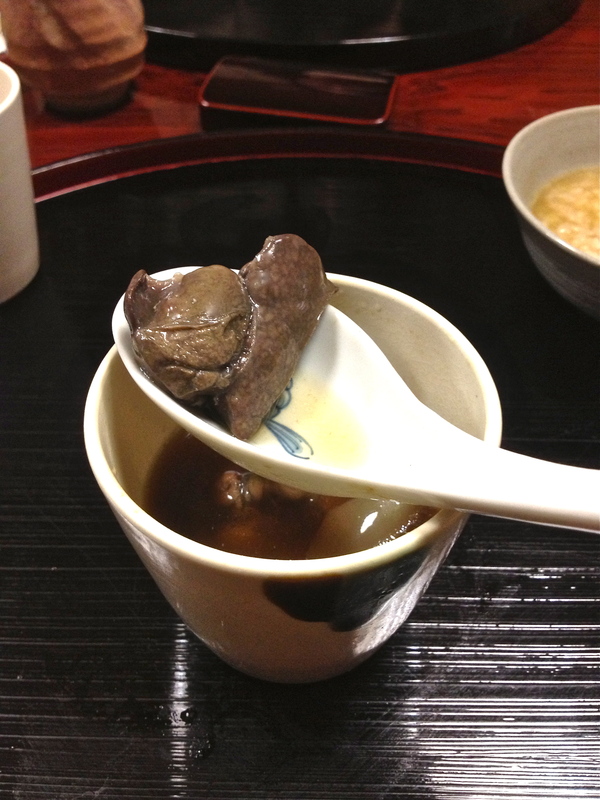 The high collagen content of suppon, or snapping turtle, naturally renders its hearty broth gelatinous and silky, and viscous enough for the little bits of sweet corn, winter melon, snap peas, scallops and tiger prawns to appear suspended in time and place. The turtle soup is comforting, and like nutrient rich liquid gold it glides down my palate and invigorates me with its Midas touch. 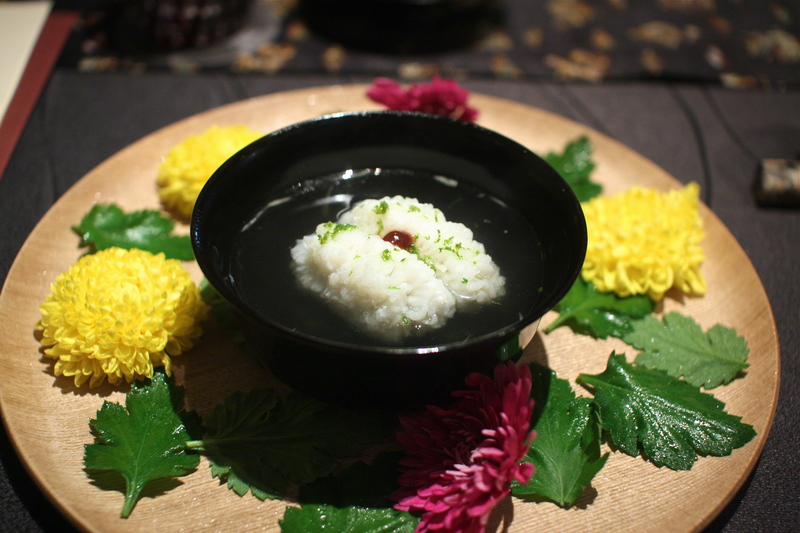 The wanmono course (rice dish) of a kaiseki meal signifies the impending end to the culinary experience, and we are given 2 choices, of which we take both. 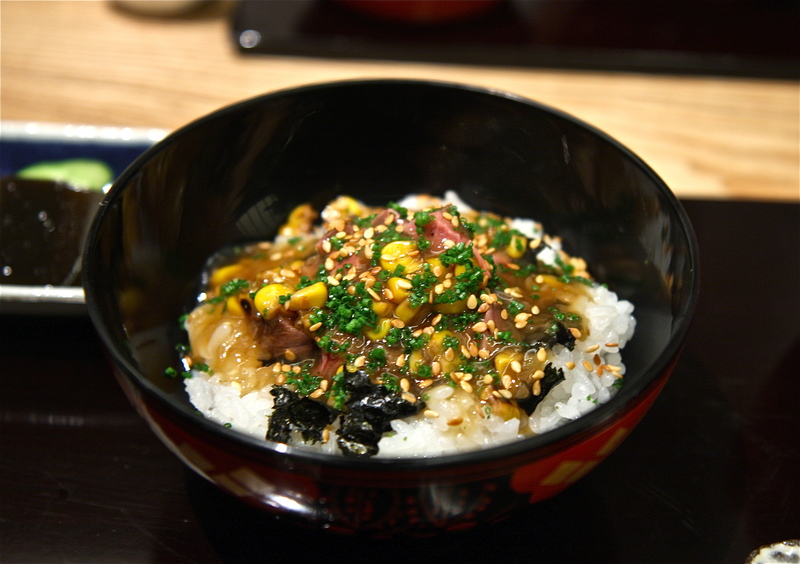 Wagyu beef, slow braised to exquisite tenderness and quickly pan seared with sweet corn and young onions, is served on a bed of warm white rice and nori. 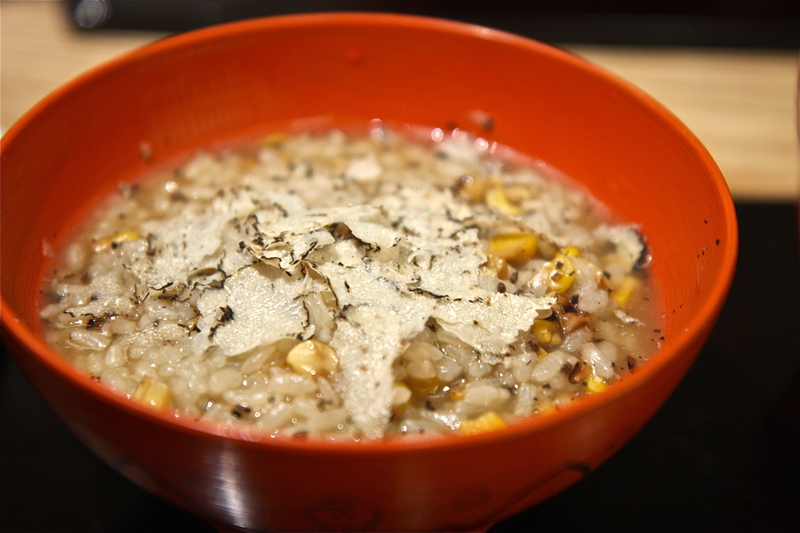 The triumphant winner however, is a truffle zousui, a soft rice soup simmered in katsuo kombu dashi and garnished with corn and plentiful shavings of summer black truffle. Ocean and land gently embrace in a delicious collaboration of delicate aromas and flavors for an ultimate experience of pure goodness. 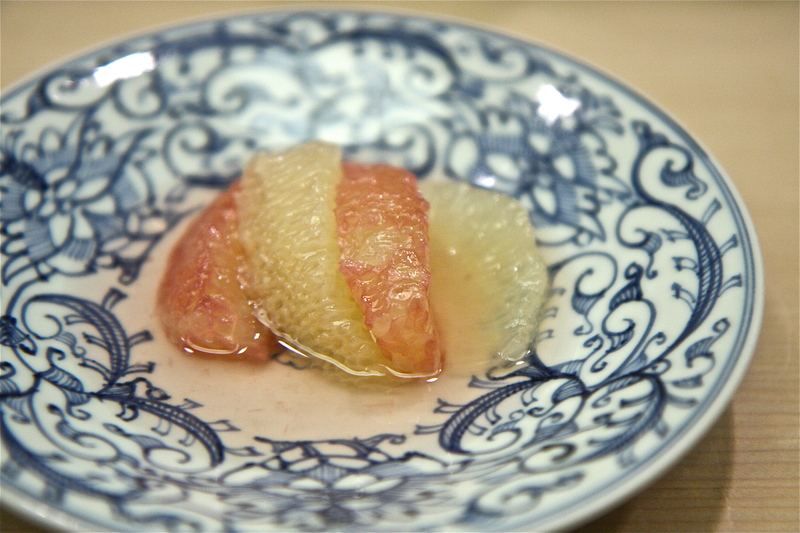 Sweet Yubari melons at its juiciest summer peak are highlighted in the dessert course as a bright orange melon soup with rum bavarois, sherry sorbet and a drizzle of kuromitsu (brown sugar syrup), all neatly presented in beautiful red lacquerware. 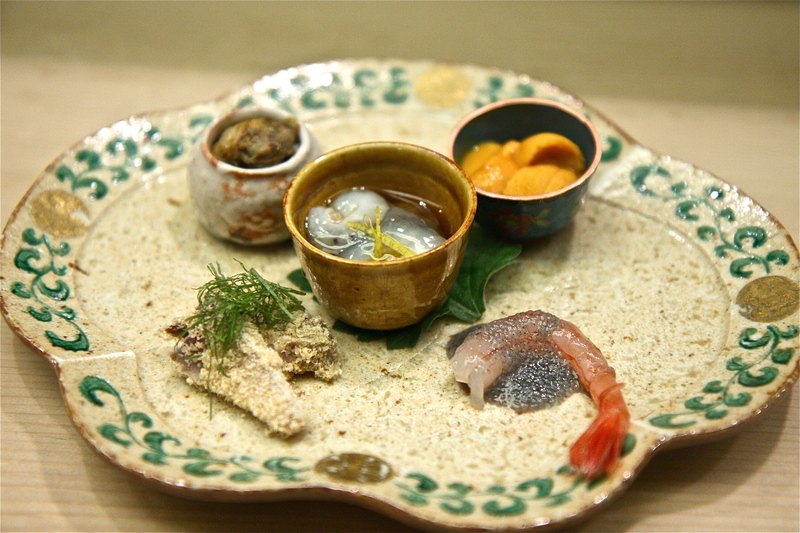 This beautiful kaiseki meal at Kohaku, course after delicious course, shows an honest and straight look into how Chef Koizumi sees the world. 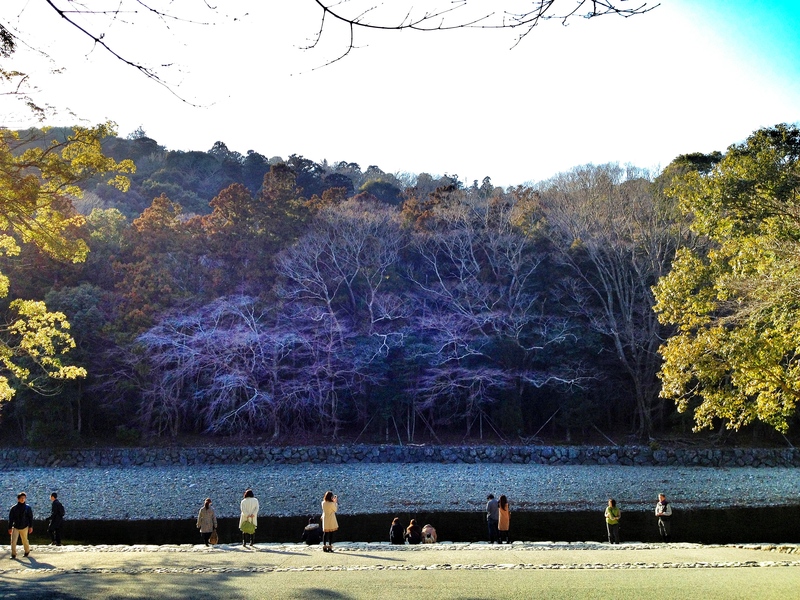 It’s a world that joyously celebrates the seasons, that gracefully moves within the subtleties of Japanese art forms, that lovingly honours the harmony between man and nature, that cultivates mutual open-mindedness between traditional and modern, and flowing through it all like a gentle stream is a sense of comfort and peace, unperturbed. 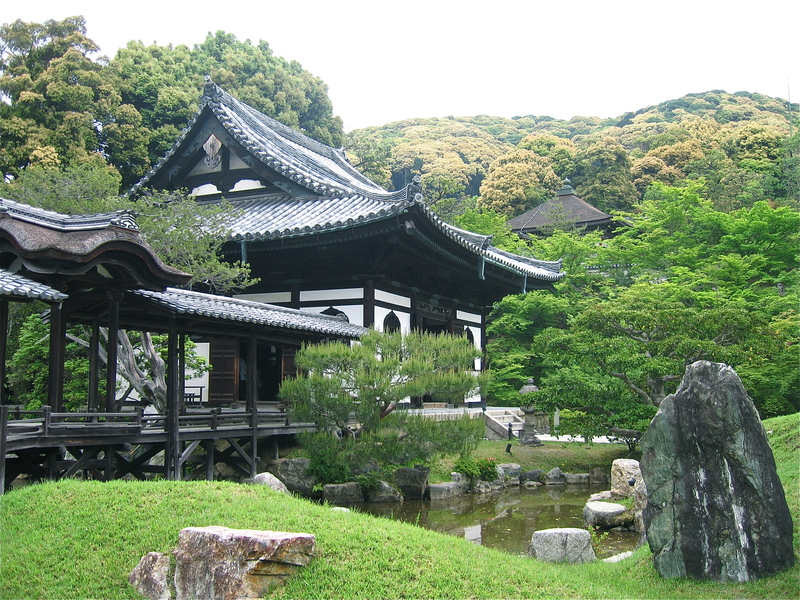 It’s a world created on the principles of Wa Kei Sei Jaku (harmony, respect, purity, tranquility)– a world that I would love to visit again, perhaps on another drizzly summer evening where they will be waiting for me outside, welcoming me back under those majestic Japanese umbrellas. 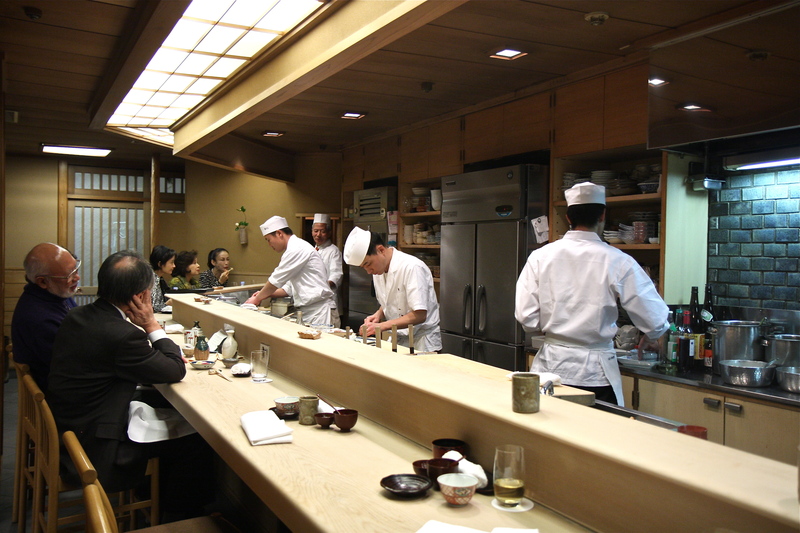 Update: Kohaku was awarded 2 Michelin stars for the 2012 Tokyo Michelin Guide- well deserved! 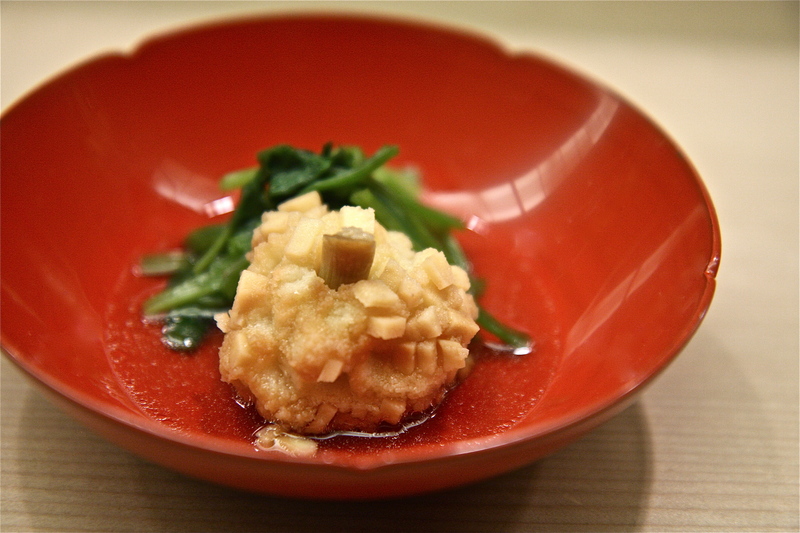 Random trivia: Did you know that Yubari melons are the most expensive melons in the world? 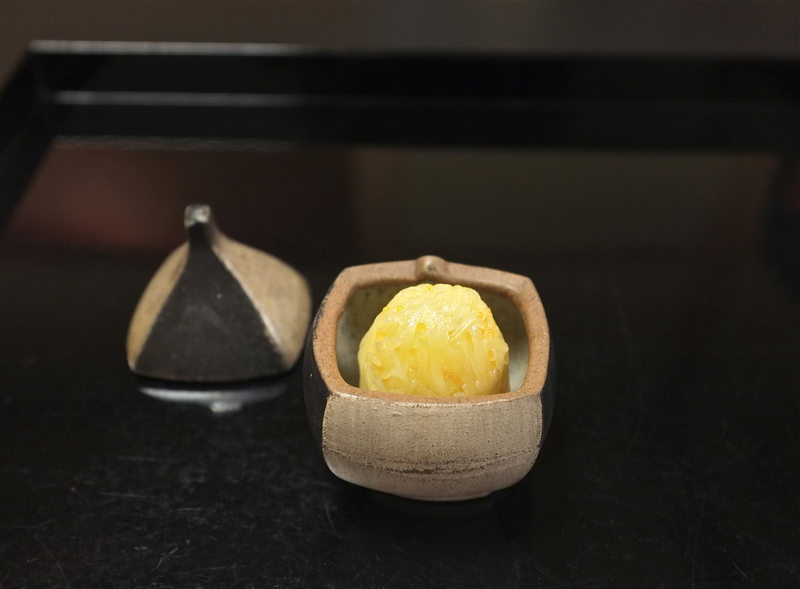 A pair of Yubaris sold for 2.5 million yen (~USD 23,800) in 2008’s first harvest auction in Sapporo, Hokkaido. 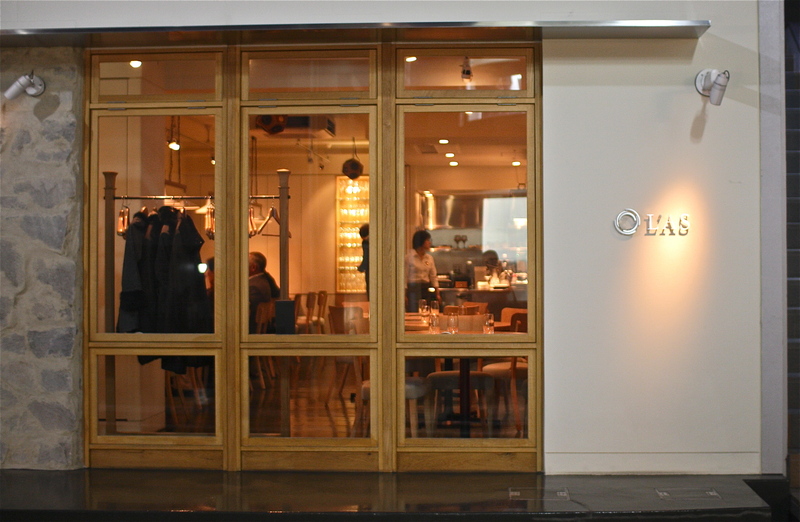 They usually sell for USD 50-100 in the market. 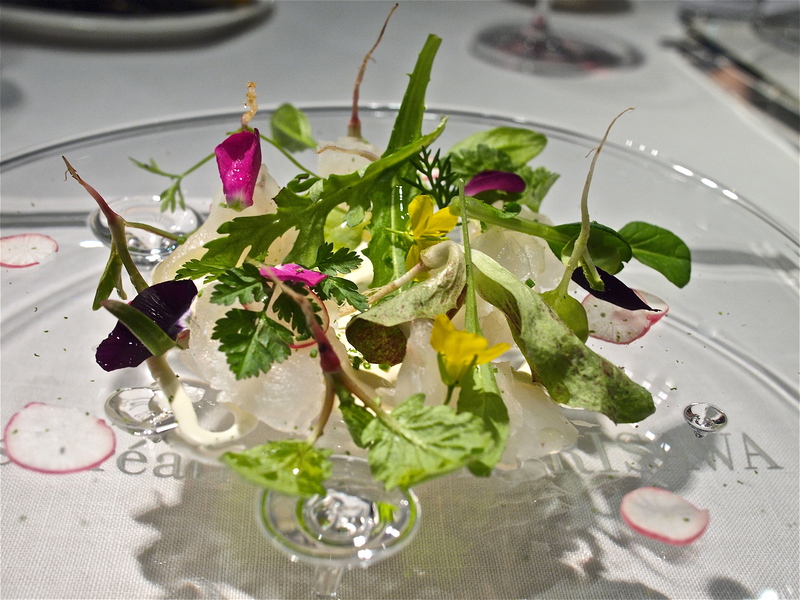 His 2 Michelin star cuisine at Les Créations de Narisawa in Tokyo that was recently ranked 12th best restaurant in the world in the S. Pellegrino World’s 50 Best Restaurants List has a message, and it is an important one of balance, harmony and beauty. 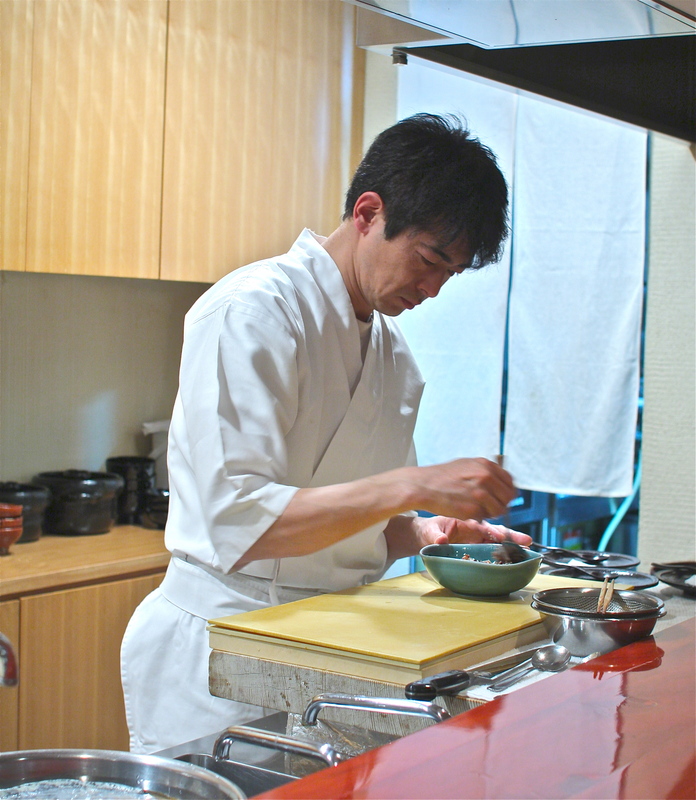 Through flavors that are European (having trained in Switzerland at Girardet’s, France at Robuchon and Italy at Antica Osteria del Ponte), aesthetics that are distinctly Japanese, techniques that are modern and concepts that are uniquely his own, he takes inspiration from our surroundings to create a culinary experience that awakens our senses. 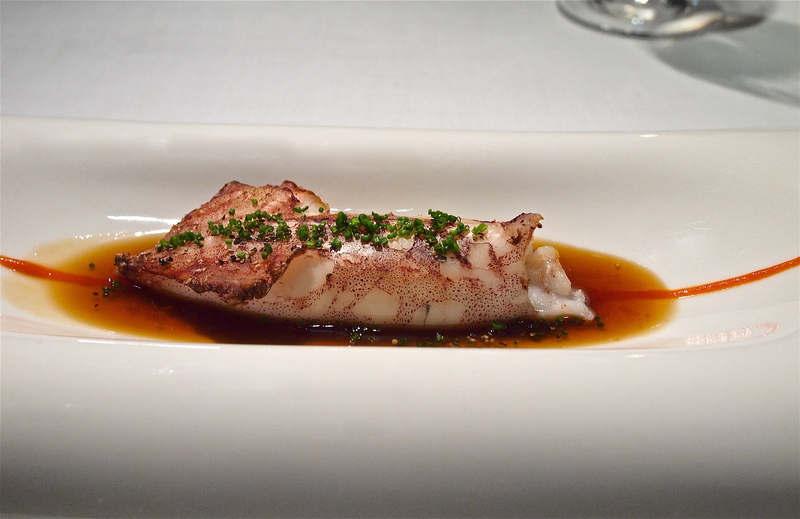 In his Winter Collection 2011 menu, he guides me on a journey through ocean and land for a delicious celebration of life. 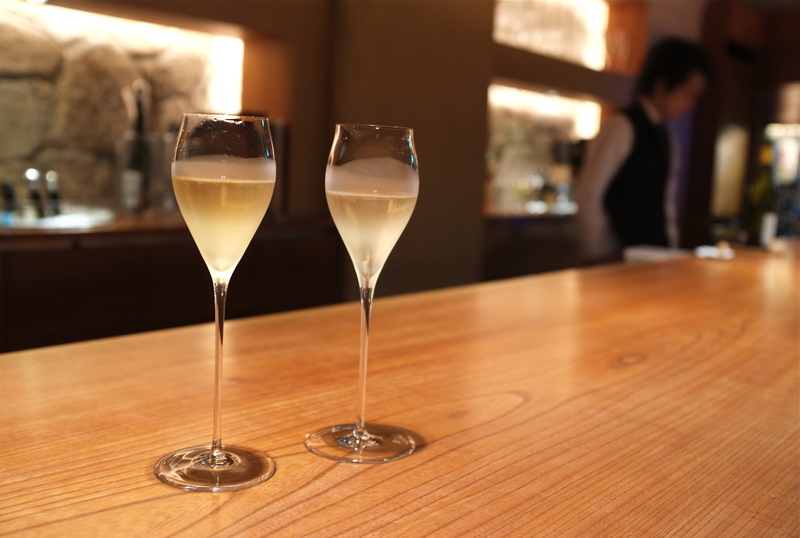 The experience begins with ‘Evolve with the Forest’, Narisawa’s edible tribute to how humans should symbiotically coexist in a forest ecosystem. 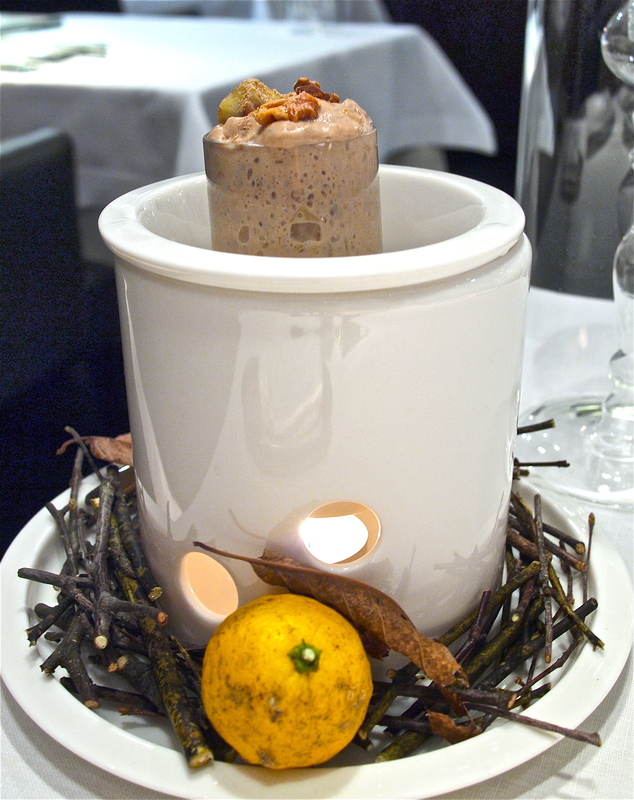 A bubbling tabletop concoction of fermenting bread, slowly rising from the gentle heat of candlelight, releases a waft of yeast aroma as our vegetable course arrives. 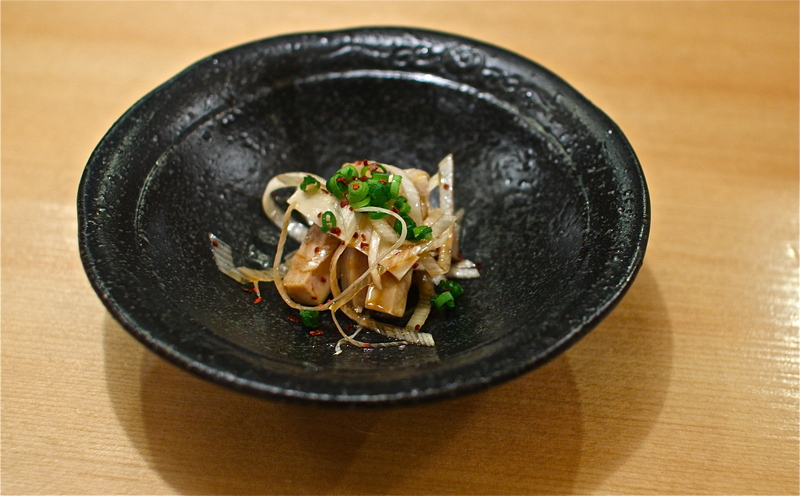 A fresh crimson colored radish, sprinkled with edible dirt made from deep fried mustard seeds, appears as if it was freshly pulled out of the earth. 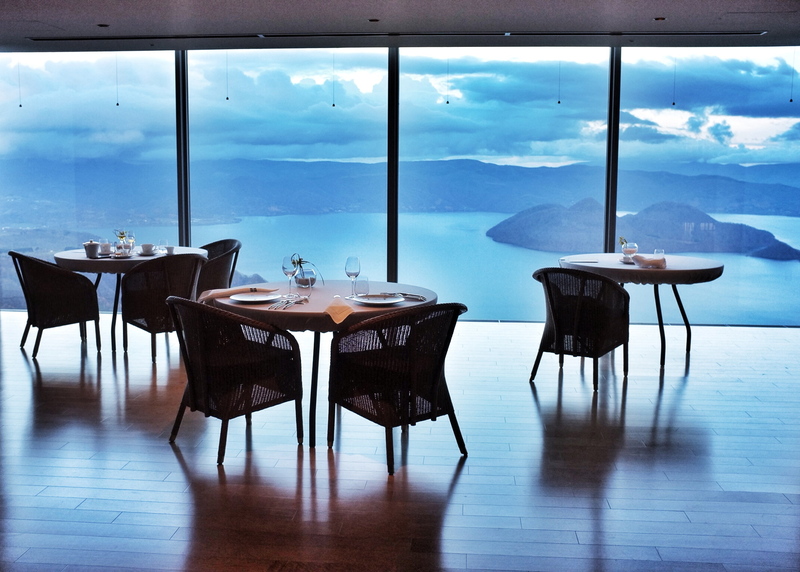 Narisawa’s tasting menu is minimalist, listing only the main ingredient of each course and whether it is a ‘gift from the sea’ or a ‘gift from the forest’. 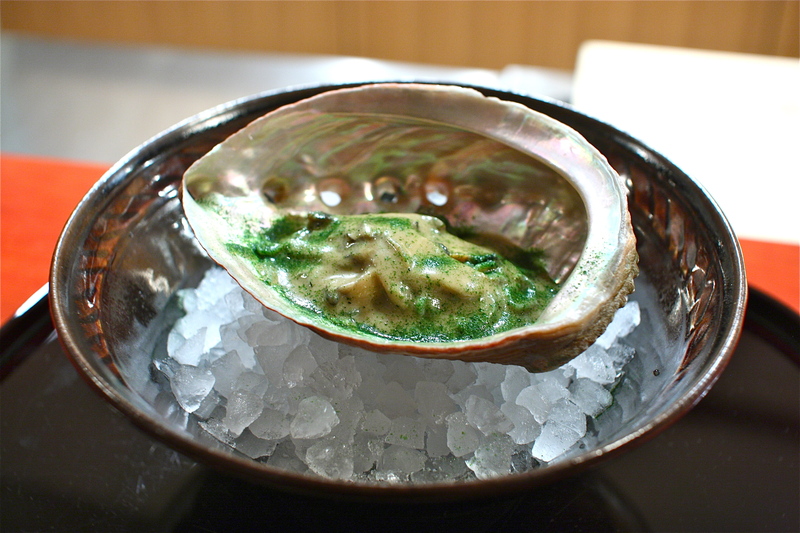 The first ocean treasure washes up on a plate of sea shells, Toba oysters from Mie prefecture prepared as thick fluffy fritters in a powdered charred leek batter. 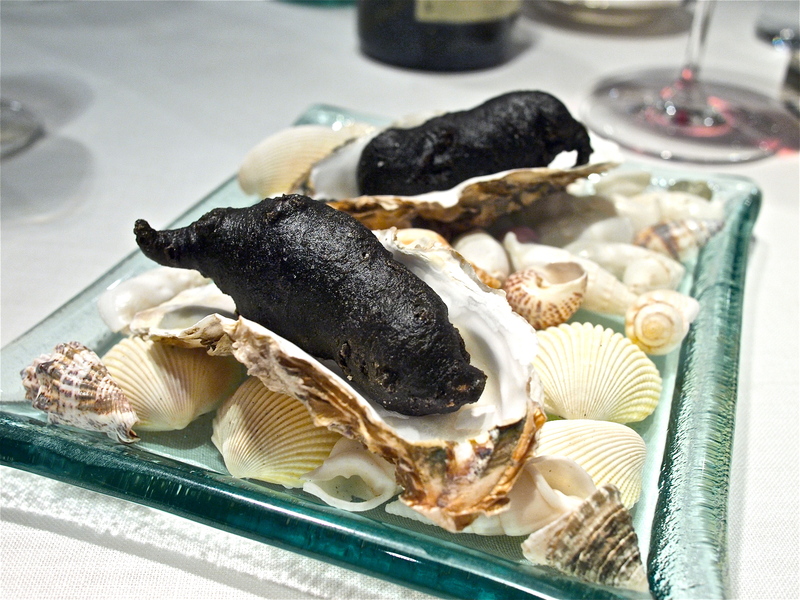 While the fritters are not the most handsome looking players on the block, the intense smokiness of the charcoal black batter lends an intensity and depth of flavor that fares well with the bivalves. 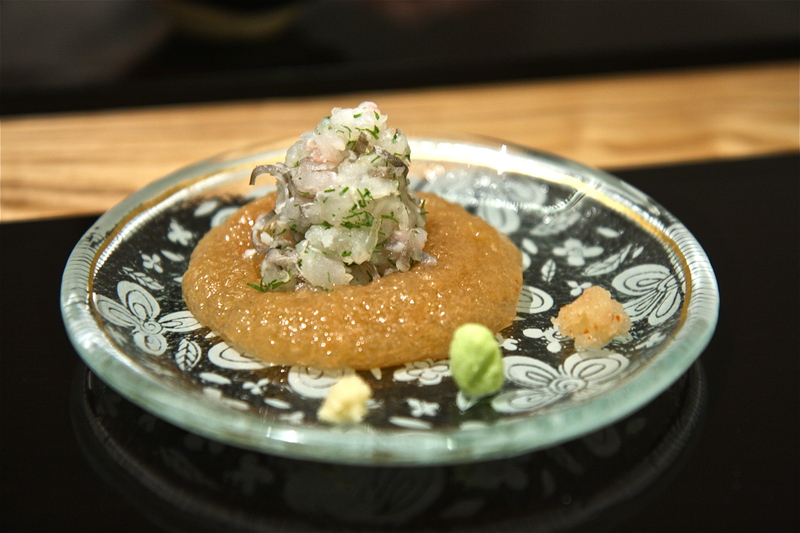 Land and sea come together in beautiful union in the hirame carpaccio dish made with thinly sliced hirame from Awaji-shima, scallop cream sauce and domestic olive oil from Kagawa prefecture. 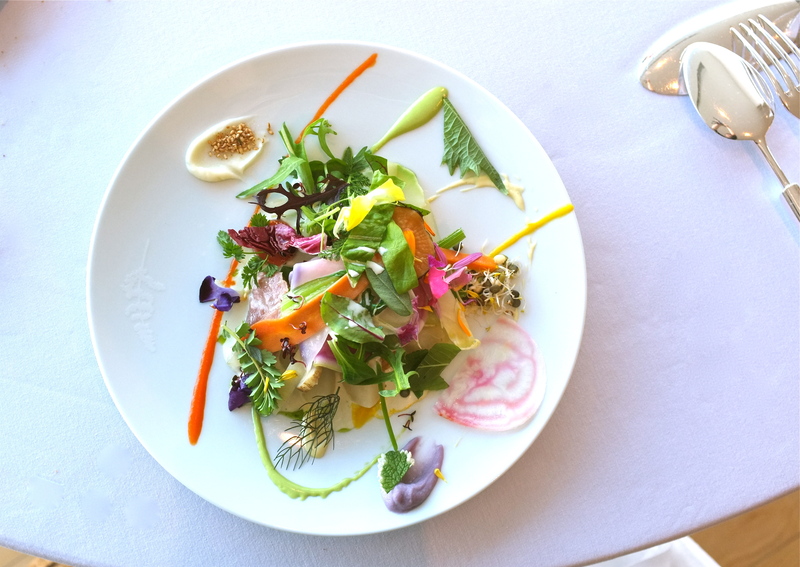 The clear plate creates an optical illusion of a vibrant garden sprouting from the ground with edible flowers, garden greens and herbs reaching tall and high up into the sky. 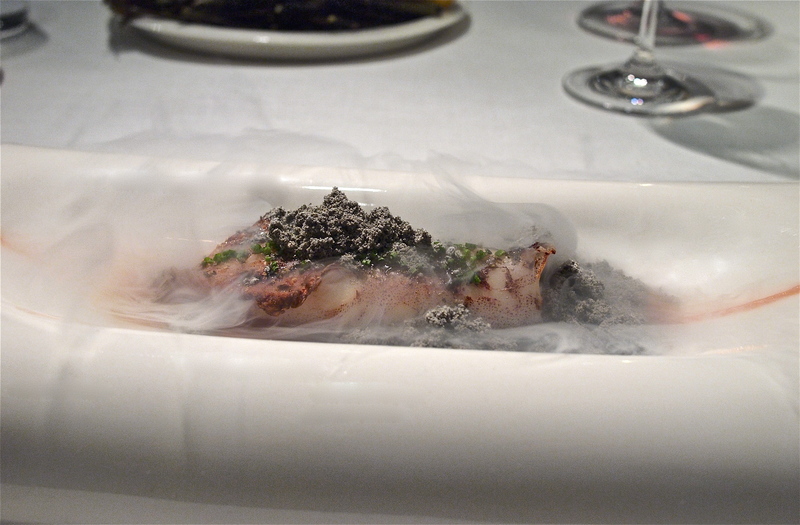 The spear squid dish, named ‘Wind of Basque’, undergoes a dramatic transformation in the blink of an eye, from a naked virgin to a seductress concealed in a veil of black mist. Like a matador that whirls his red flag in one graceful arc, our server sweeps in with a spoonful of charcoal black liquid nitrogen ash made with burnt red peppers for a dramatic presentation. 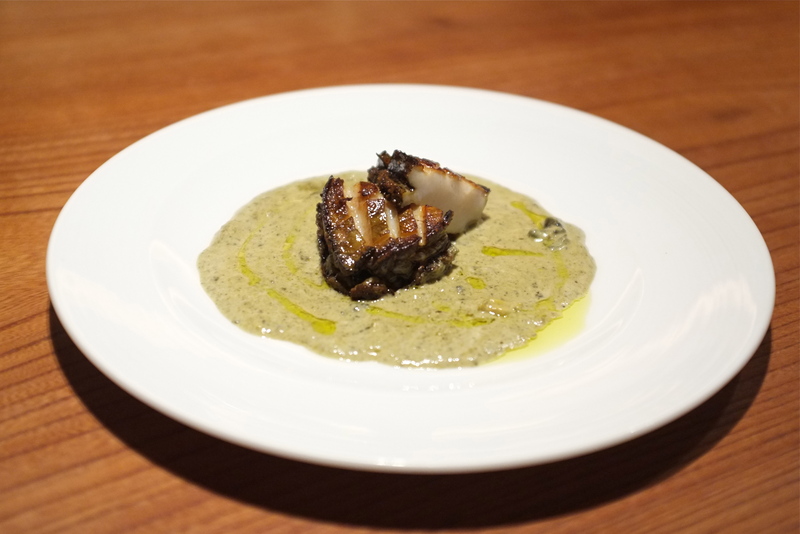 Burnt red pepper soup, Basque pimenton sauce and now a blanket of pepper ash create three layers of smoky pepper flavors to augment the tender squid. 2007 Domaine André Vatan Sancerre finishes all 3 of these seafood courses on a good note. 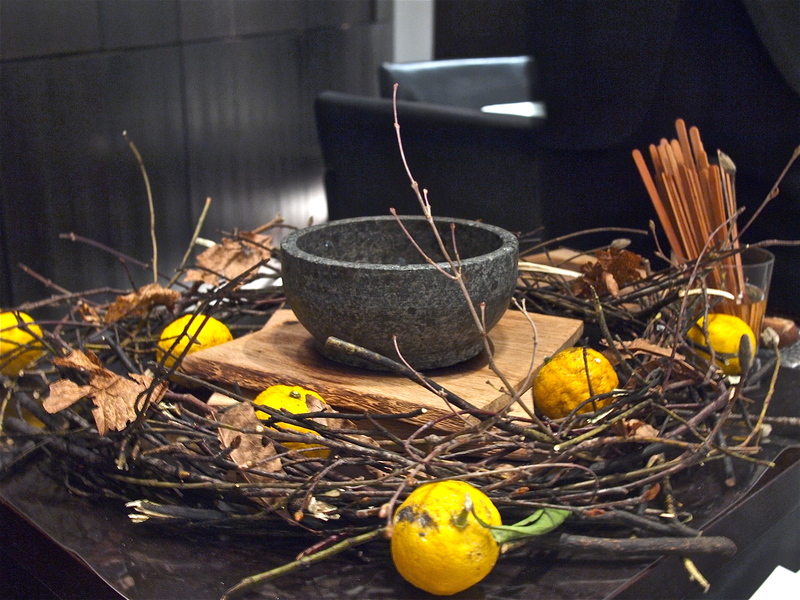 The fully risen bread, now ready for baking, is placed in a heated stone pot on a table adorned with twigs and dried citrus. A smidgen of chestnut powder is lightly dusted onto the bread before it is covered with an oak tree lid to bake for 12 minutes. 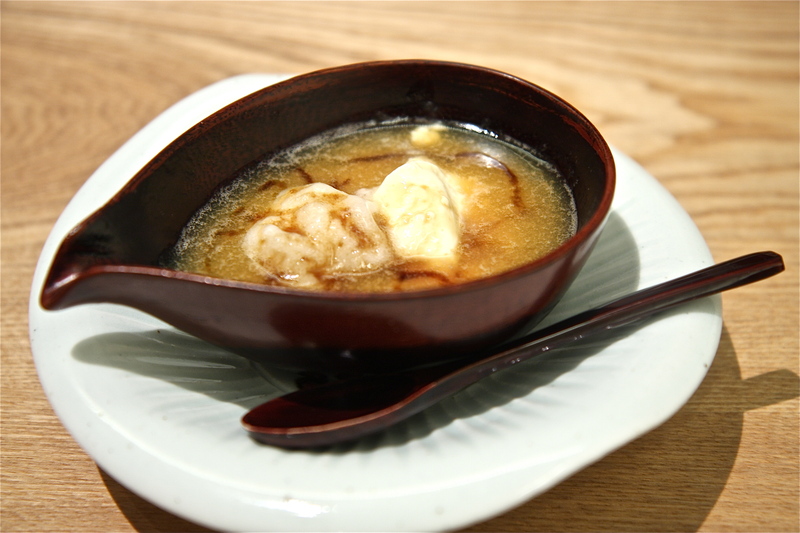 A faint aroma of yuzu seeps through from under the lid to tantalize our appetites as we wait for what seems an eternity until our hot bread is ready to be served. 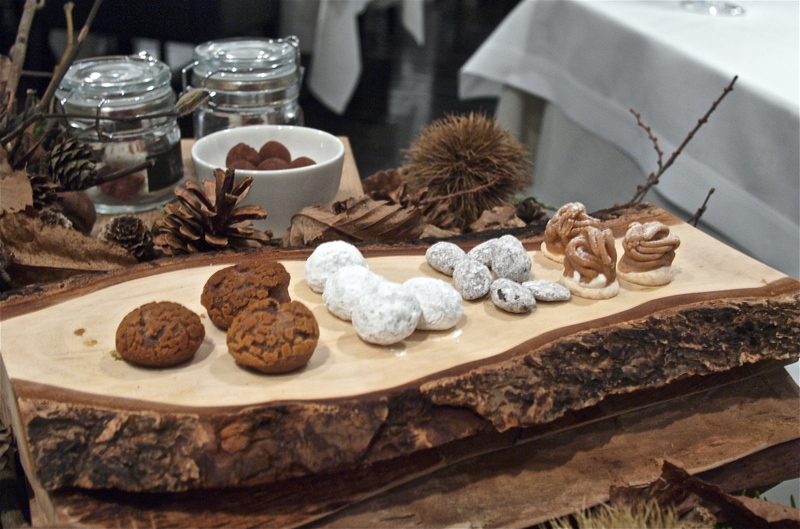 Chestnuts and roasted walnuts add a wonderful earthiness to the warm bread introduced on the menu as ‘Bread of the Forest’. 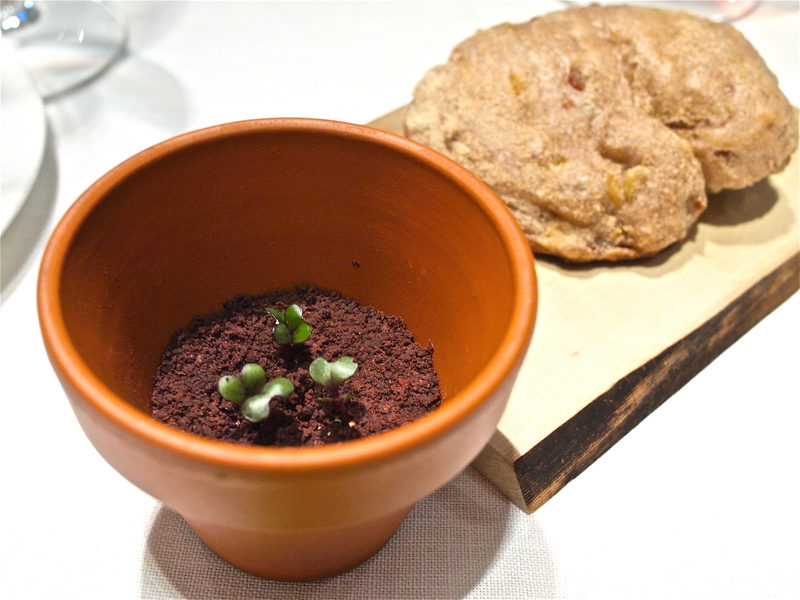 Tender young buds sprouting from the pot of soil that signify the return of spring are in fact red cabbage sprouts in a layer of dehydrated Taggiasca black olive tapenade and whipped butter. 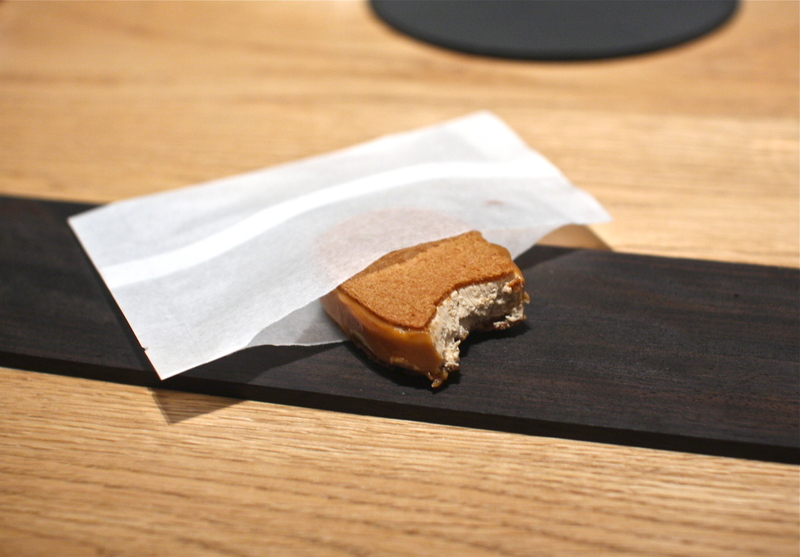 To be able to experience the full evolution of this bread course is a unique Narisawa concept that certainly brings man and nature closer to eye level. 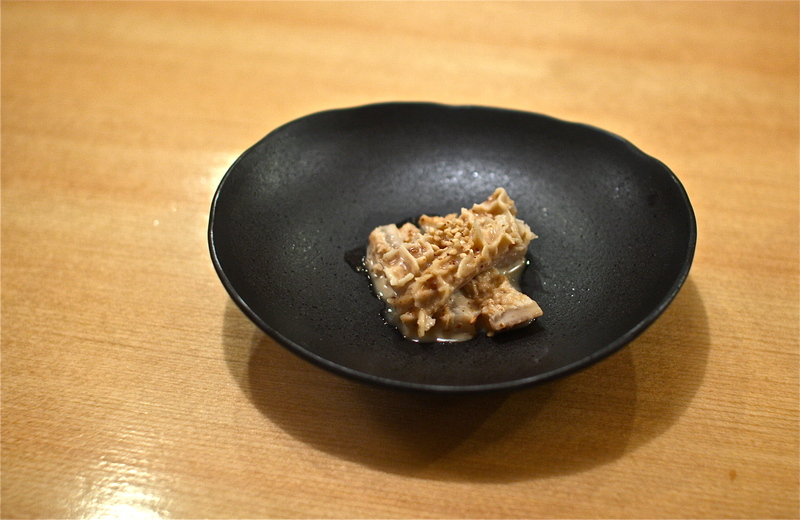 The Saint-Sever foie gras dish, scoring high on the pleasure factor, is my favorite dish of the evening. 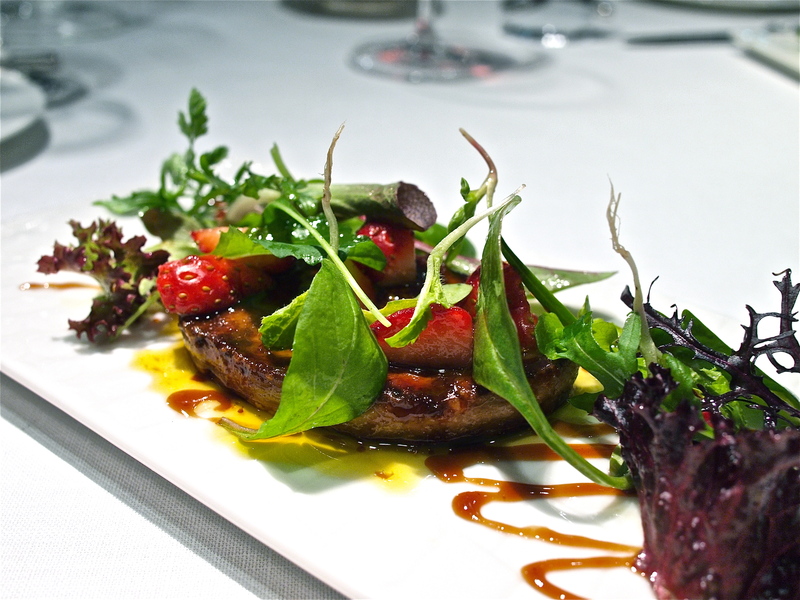 The rich buttery foie with a perfectly seared exterior that is first poêléed in red wine vinegar and fond de veau, then finished with balsamic vinegar and strawberries, has the perfect balance of acidity, sweetness and savoriness that leaves me scraping the plate for every last remnant of sauce. 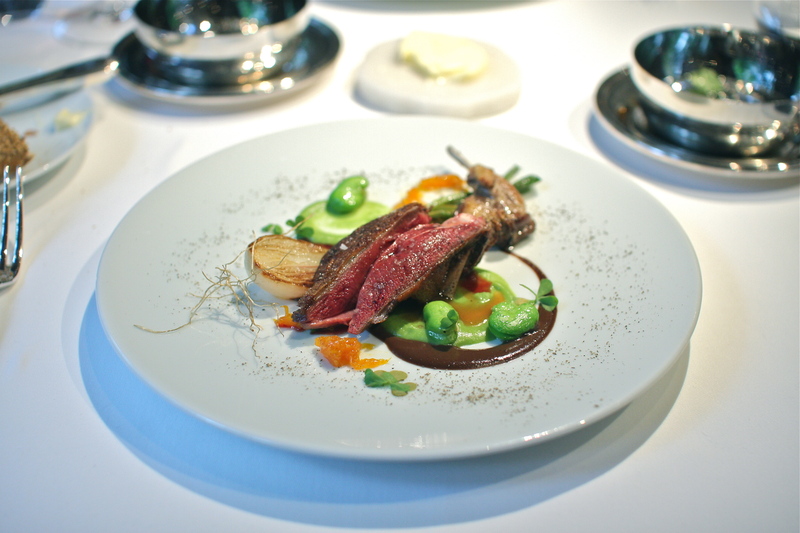 Our bottle of 2008 Domaine Prieuré Roch Nuits St Georges pairs especially well with this memorable course. 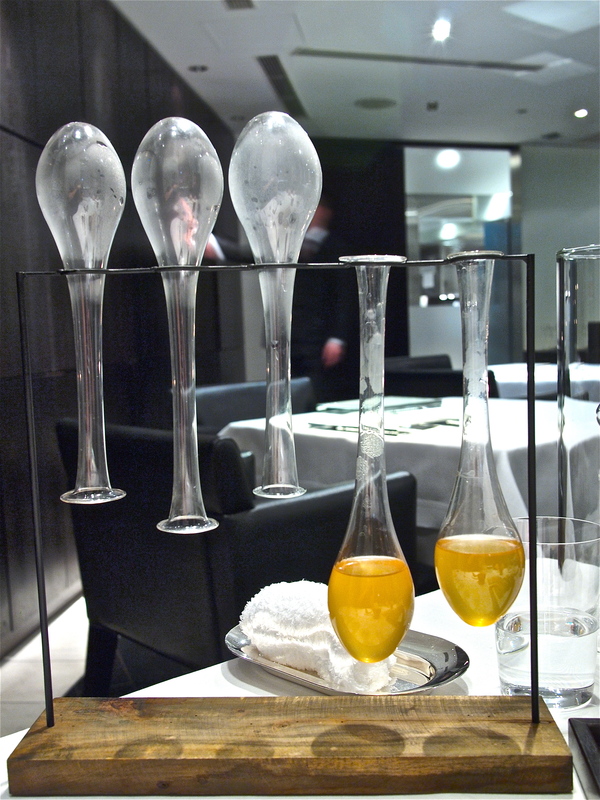 My expectations are heightened when they present this beautiful chemistry set-like display of soup-filled glass tubes for the next ‘gift from the sea’. Chinese Jinhua ham soup releases an intoxicating perfume into my nares as it is poured onto our spiny lobster dish, but the end result is a disappointingly uninteresting plate of incongruous flavors. 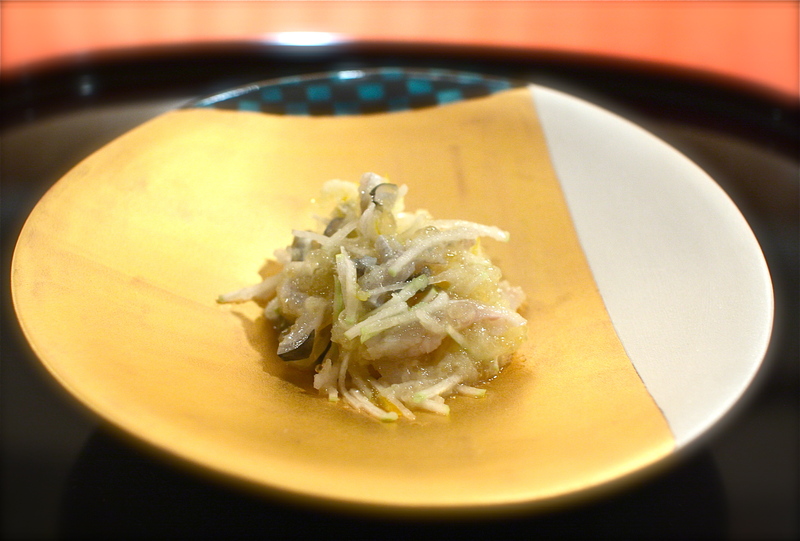 Bitter nanohana brassica takes away from the finesse of lightly dusted spiny lobster fritto while the prominent acidity of sudachi shavings seem to compete with the savor of the prized ham broth. 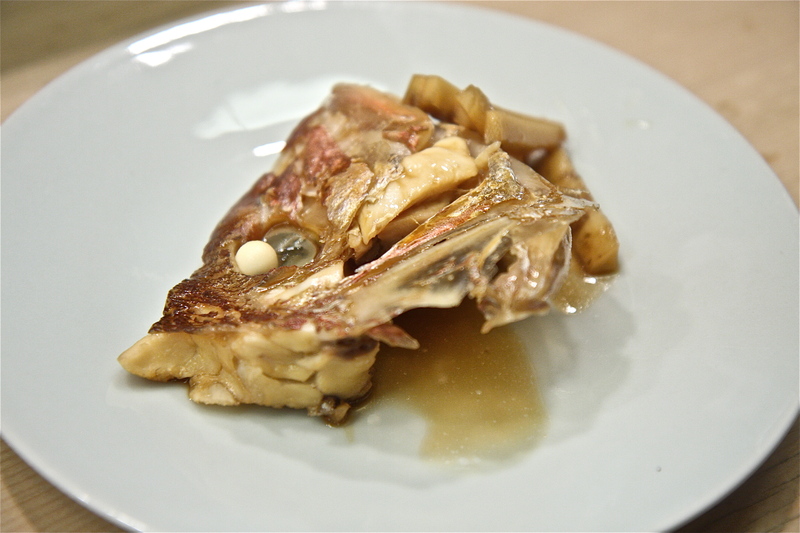 The final ‘gift from the sea’ is a madai red seabream from Awaji-shima, a well prepared slice of fish with crispy skin that I also find difficulty enjoying with its diffuse and somewhat disjointed plating of components. 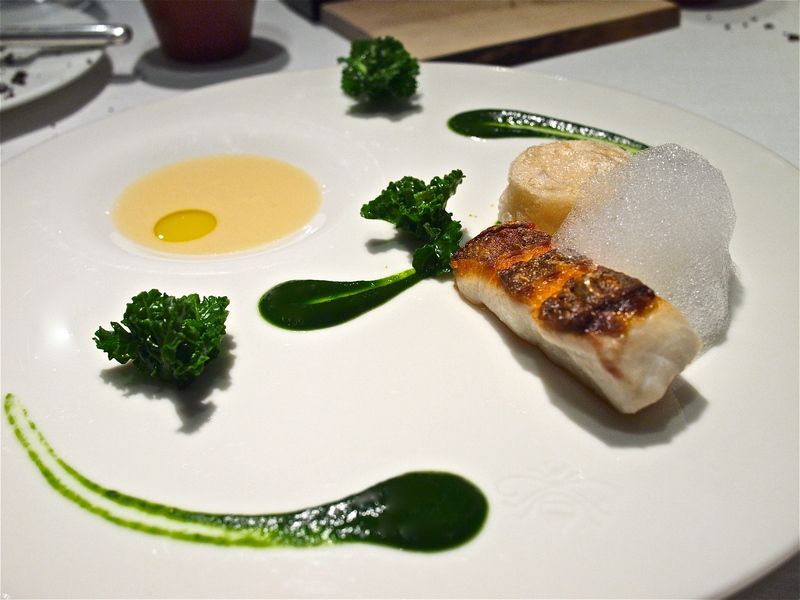 A scallop-esque cylinder of sesame tofu fritto, bright green wakegi onion sauce, Japanese putit vert greens, sudachi lecithin foam, and Kyoto white miso and scallop ribbon sauce are all individually delicious, but I struggle to grasp Narisawa’s philosophy of appreciating our natural landscapes through simple forms of beauty when I am too busy assembling each bite. 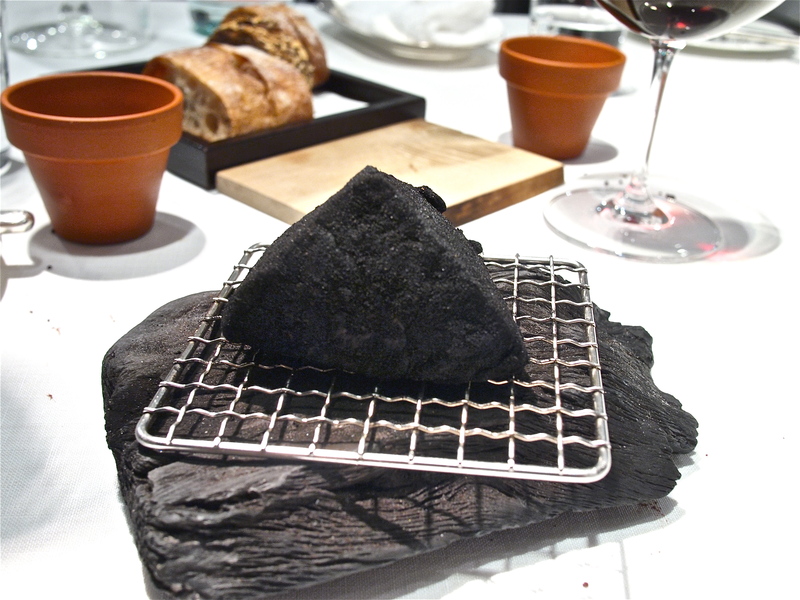 Chef Narisawa does, however, make up for it in his ‘gift from the forest’ dish of expertly prepared Hida wagyu rump roast where he manipulates the element of fire to express ‘rebirth’ and ‘transformation’ through another charcoal black presentation of carbonization, a recurrent theme throughout his tasting menu. 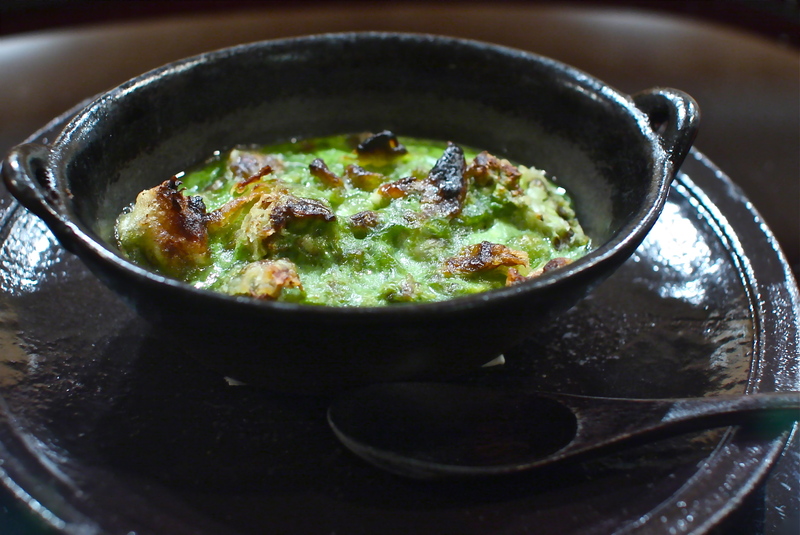 Leeks are charred, allowed to mature and cure for 3 days to remove its bitterness, then coated onto the beef. The meat is arroséed with olive oil on low heat in a frying pan, requiring 1 chef to continuously baste the meat by hand for 30 minutes on the stovetop. 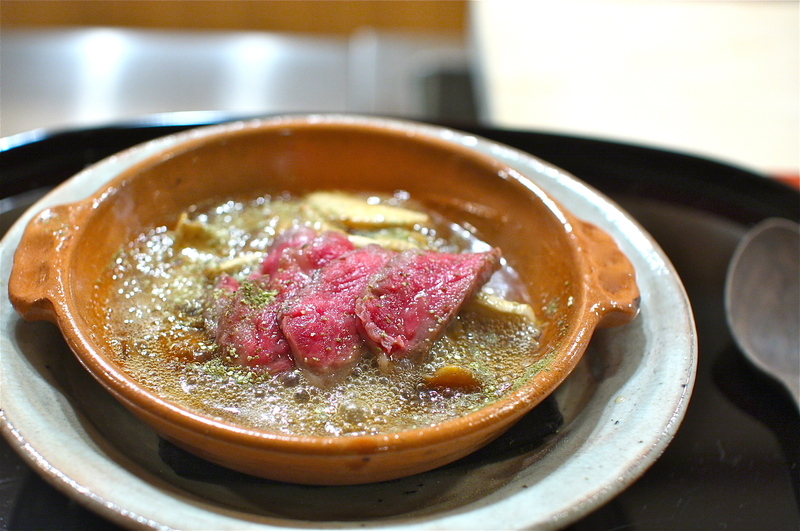 The result is a tender moist cut of meat, evenly pink throughout as if temperature controlled sous vide, full of juiciness and the very flavor and essence of what beef is meant to taste like. 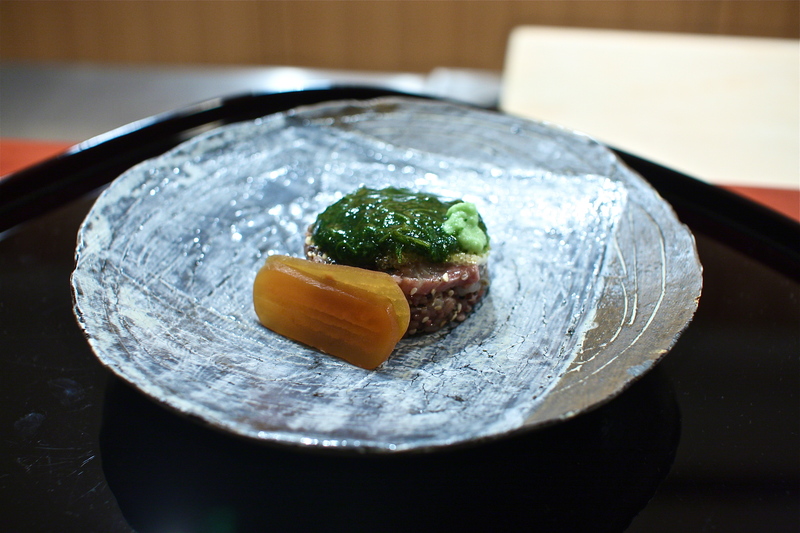 A red wine bordelaise, some sweet Japanese chijimi spinach, a palate cleanser of Japanese sake granité and a bottle of 1998 St. Emilion Denis Barraud ‘Lynsolence’ later, I find myself soaking up the energy of the natural elements through my satisfied taste buds. 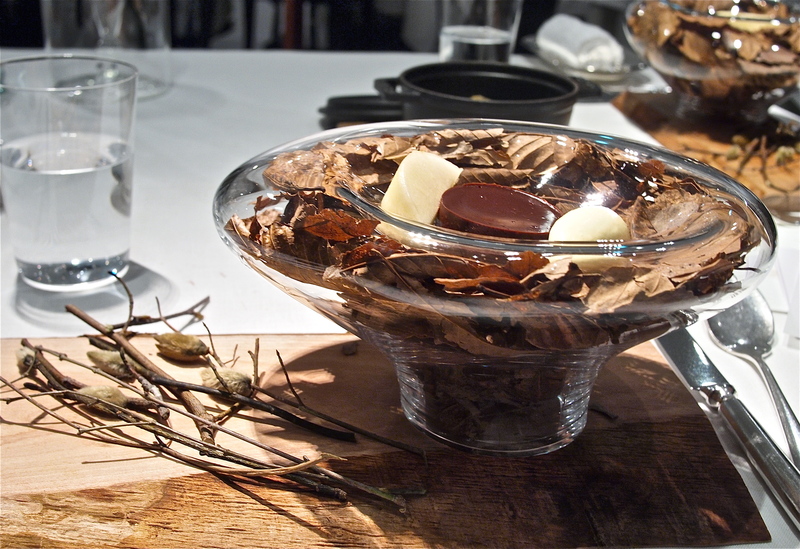 The first dessert course, served in a dramatic glass sculpture of winter landscape, features Le Lectier pear smoked with magnolia chips, magnolia flower ice cream and a chocolate fondant made from 125% Valrhona chocolate. 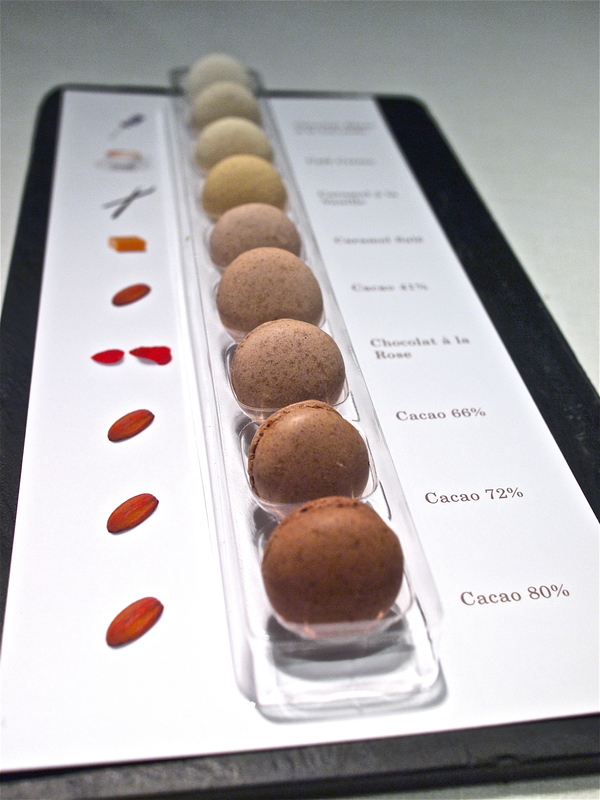 A long overwhelming explanation of how chocolate can have a cacao percentage of 125% is kindly given to us by our server, but its technicality loses my attention and my brain fails to comprehend this concept. It seems though, through swirling the thick creamy chocolate dessert in my mouth, that Valrhona has somehow devised a way to create one of the most intensely concentrated dark chocolates in a product called P125 Coeur de Guanaja chocolate, and I am happy to receive. 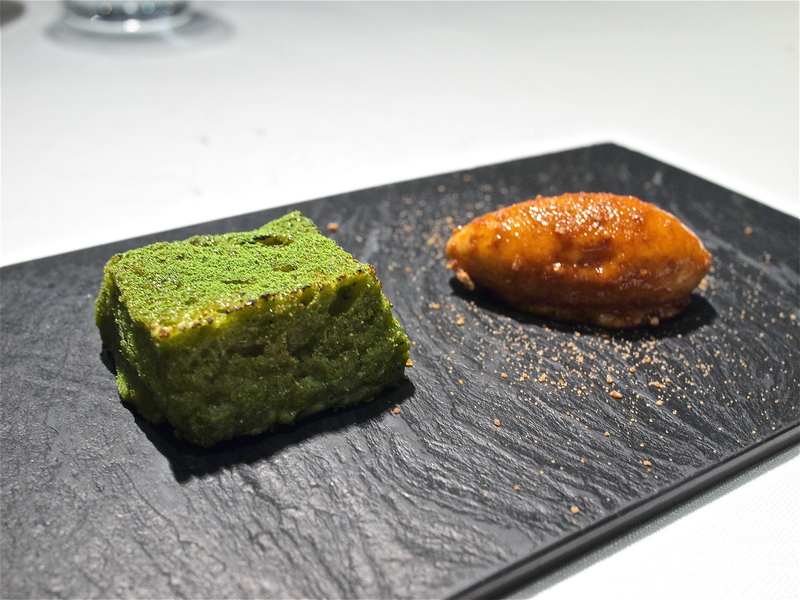 Warm and pleasantly bitter matcha green tea french toast is presented in a dessert duo with milk ice cream coated with sweet sugar cane powder, a contrast of temperatures and flavors. 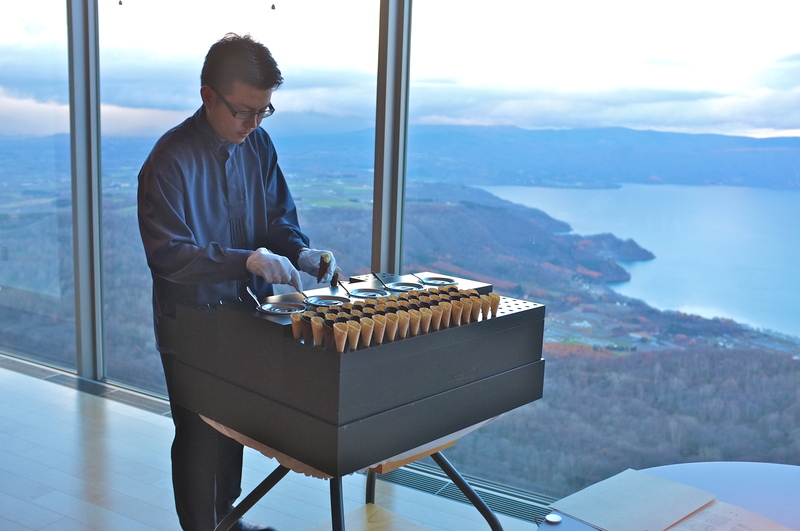 The dessert cart at Les Créations de Narisawa is quite a spectacle, its multi-tiered trays of smoothly sanded tree barks offering an irresistible array of bite sized sweets, from tarts (pear, muscat, chestnut and Satsuma), macarons (chestnut, tea), chocolate truffles and kirsch cherries to galettes, meringues and choux cream puffs. 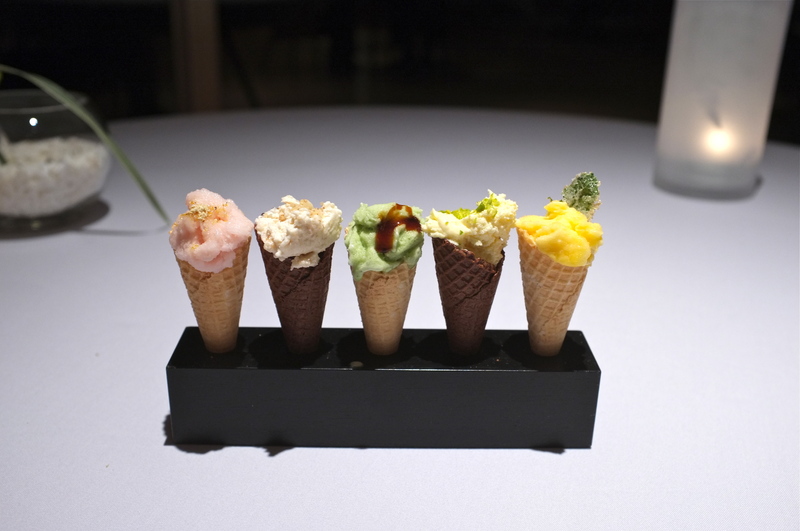 A signature Narisawa item, a colorful gradation of petit macarons completes the tasting menu, with flavors ranging from white chocolate to rose and cacao intensities ranging from 41% to 80%. 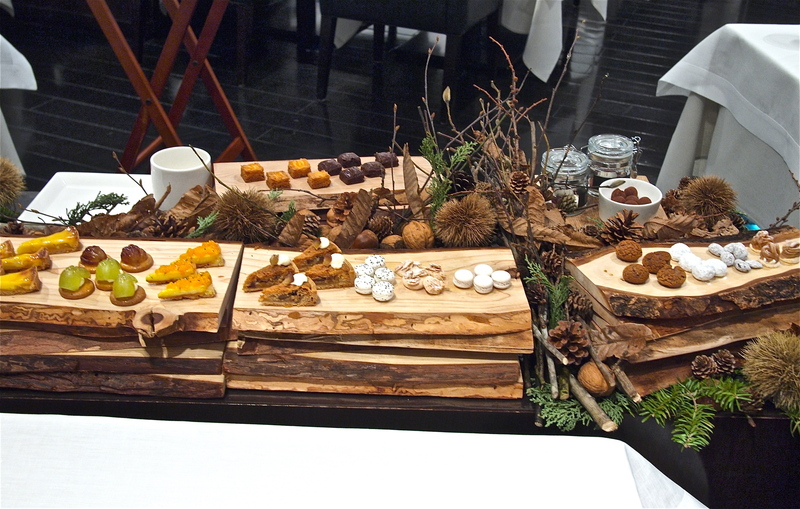 While a fun concept and a delight for the eyes, the macarons are dry, brittle and overly sweet. 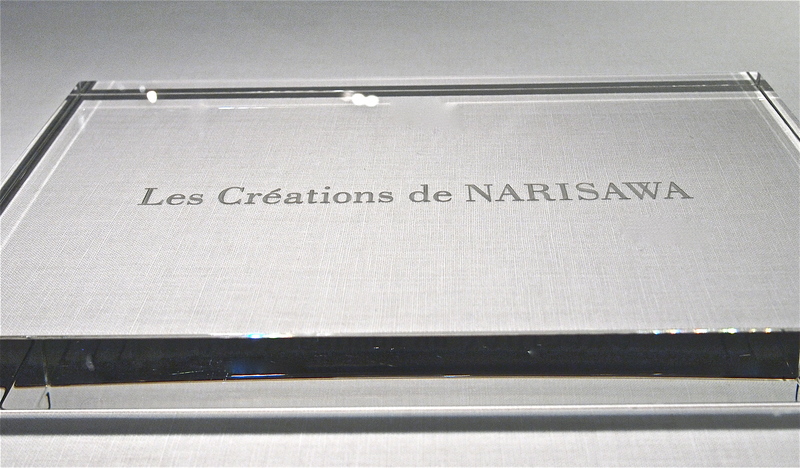 Les Créations de Narisawa’s philosophy is an admirable one, one that honors nature, respects the elements and derives inspiration from our beautiful surroundings. 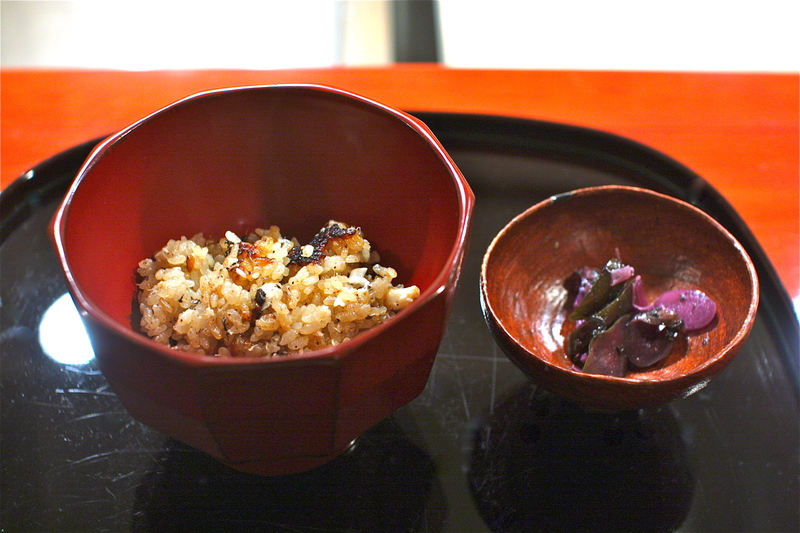 With unique concepts and new methods of preparation and cooking, my meal here proved to be a great learning experience, but somehow didn’t take my breath away as a memorable one. 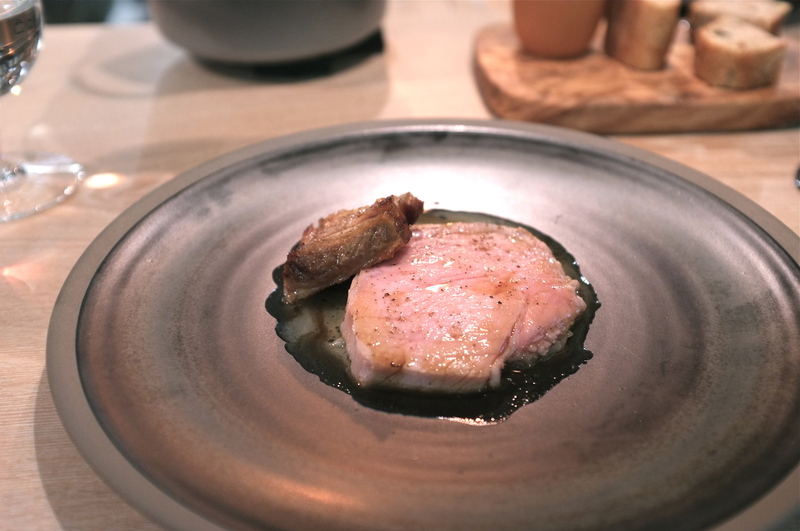 With long introductions, lengthy explanations and technically elaborate dishes, I found this tasting menu to be more cerebral and less visceral, and one that I unfortunately don’t look back at and yearn to relive again. 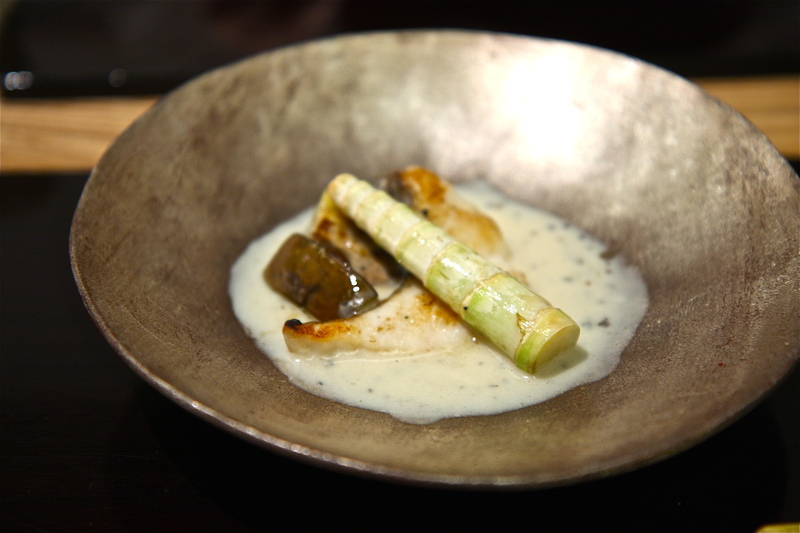 With such passionate visions to pay tribute to the forest, the sea and the earth, one would hope that these inspirations would translate more easily, but its complexity and technicality had me distracted on more than one occasion, creating within me a sensory block to receive Narisawa’s art. Nature, for me, is raw, bold and at times chaotic (and in that there is such beauty)- the very opposite of what I felt at Les Créations de Narisawa that night where the food, the service, the quiet dining room and the spotless kitchen (my utmost respect to the cleanest kitchen I have ever seen where they even wipe the light bulbs every day) were pristine, polite, sterile and almost too perfect. 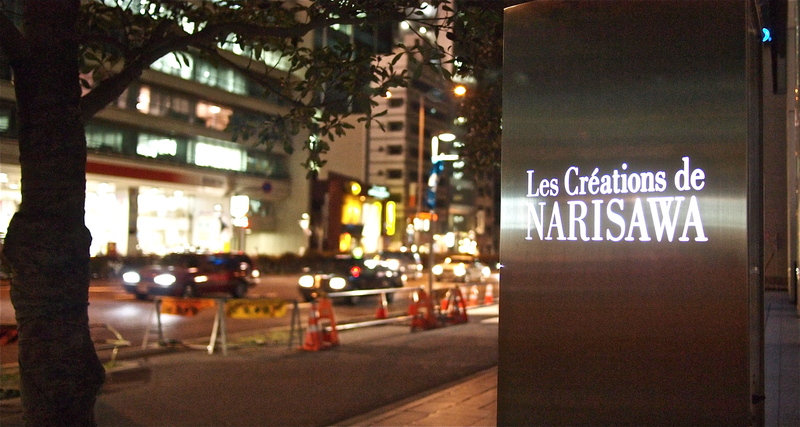 Some day I hope to return to this restaurant during a different season and with a different mind set to be able to be more vulnerable to Chef Narisawa’s artistry and completely fall under his spell. 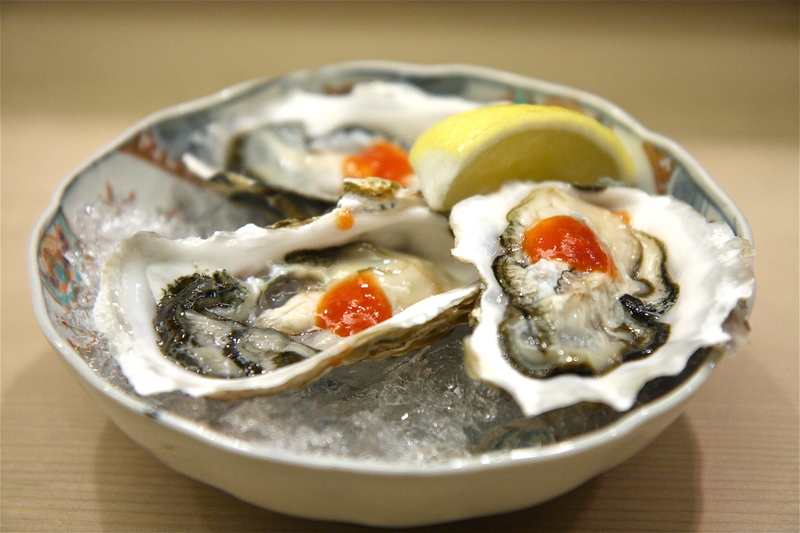 Random trivia: Oysters are considered aphrodisiacs. According to Greek mythology, Aphrodite, the Greek goddess of love, sprang forth from the sea on an oyster shell and promptly gave birth to Eros, god of love. 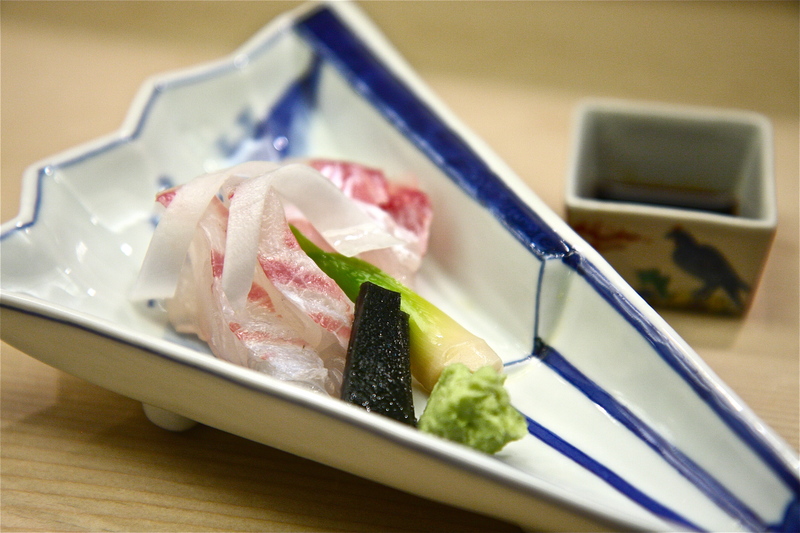 Kodawari, Kiwameru… These are 2 principle words which define Japanese artistry and culture, and is especially true of Japanese cuisine. 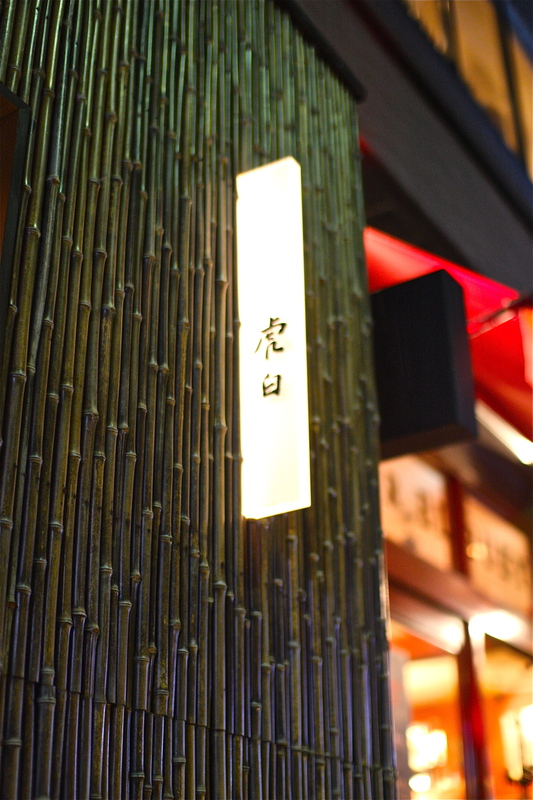 One must understand the intention behind these 2 words in order to truly appreciate the beauty of Japanese food. 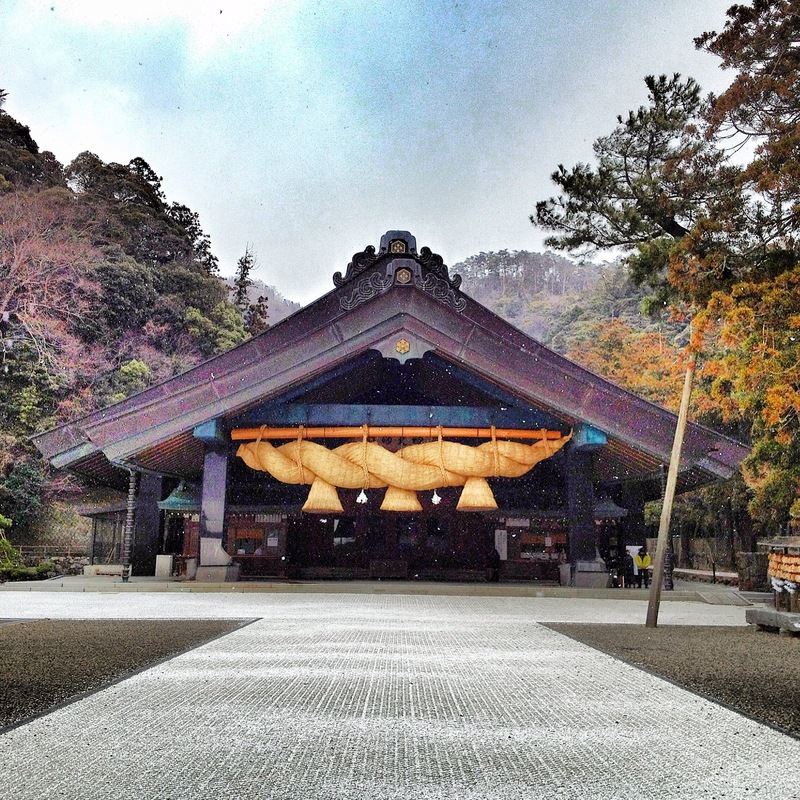 こだわりKodawari means an uncompromising and relentless devotion to pursuing something. It is when special consideration and attention is given to a particular subject matter. To some, it can even be interpreted as a serious obsession and a stubborn refusal to compromise. 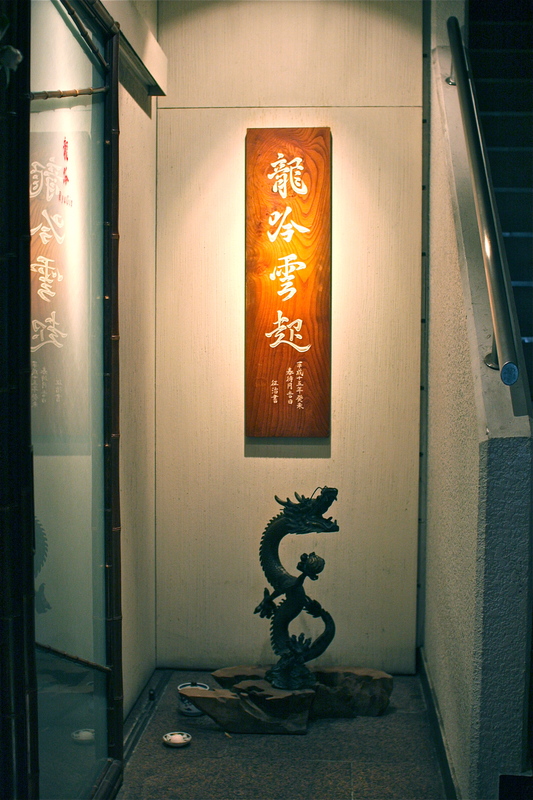 An artisan may show kodawari by continuing to carve lacquerware bowls by hand rather than by machine, by insisting on applying 50 individual layers of the lacquer rather than cutting corners by applying 30 because the resulting shine is not the same, or by etching intricate designs only with that one particular tool that a certain other artisan makes because the other tools do not have the same feel. 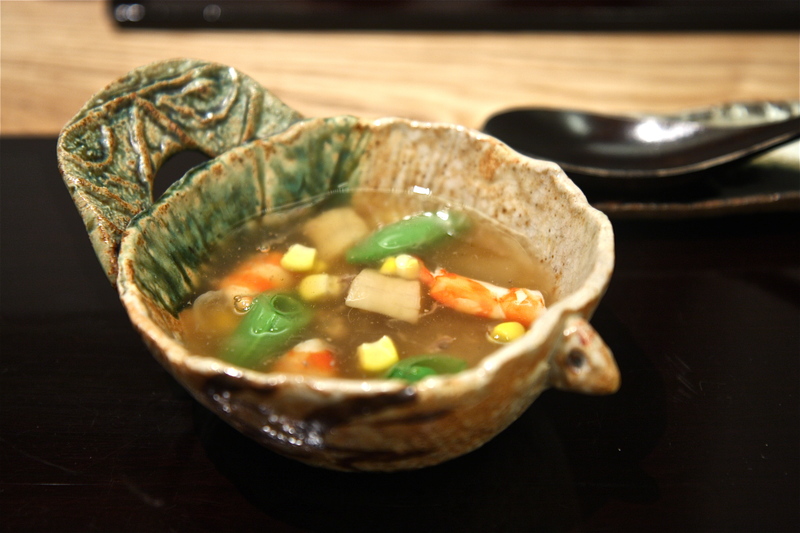 A chef’s kodawari may be that he only uses the natural spring water from a certain mountain for a soup dish because all of the 300 other types of natural spring water that he tried did not achieve the taste that he desired. 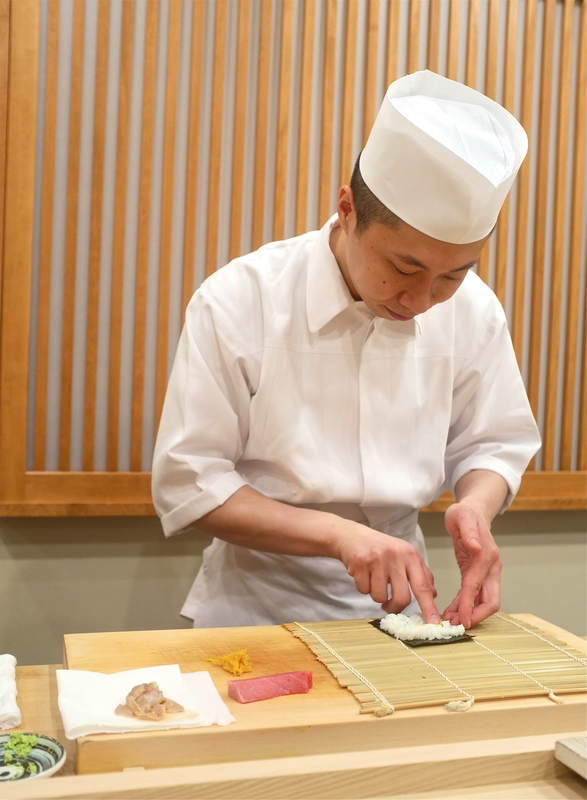 極めるKiwameru means to perfect and master a skill to the utmost extremes. It involves unyielding discipline and practice to perfect an art down to the most minute detail. 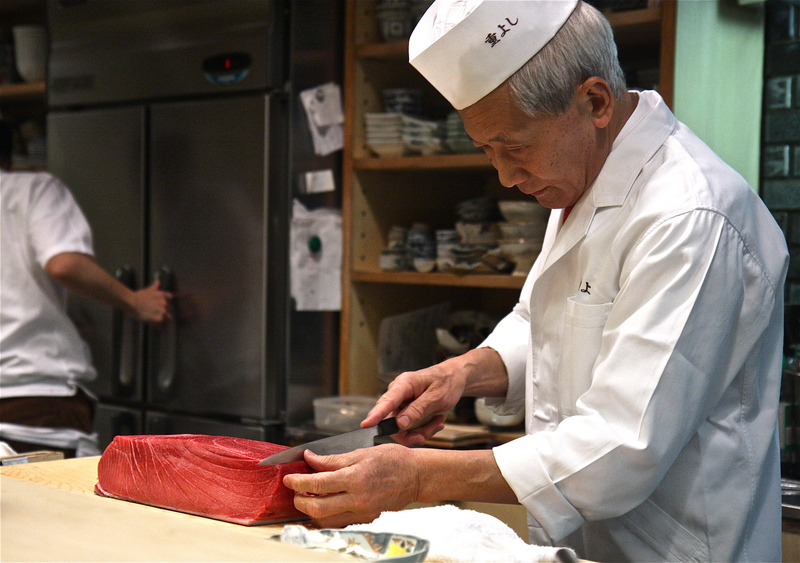 It often involves years of practicing a particular skill in order to be the best. 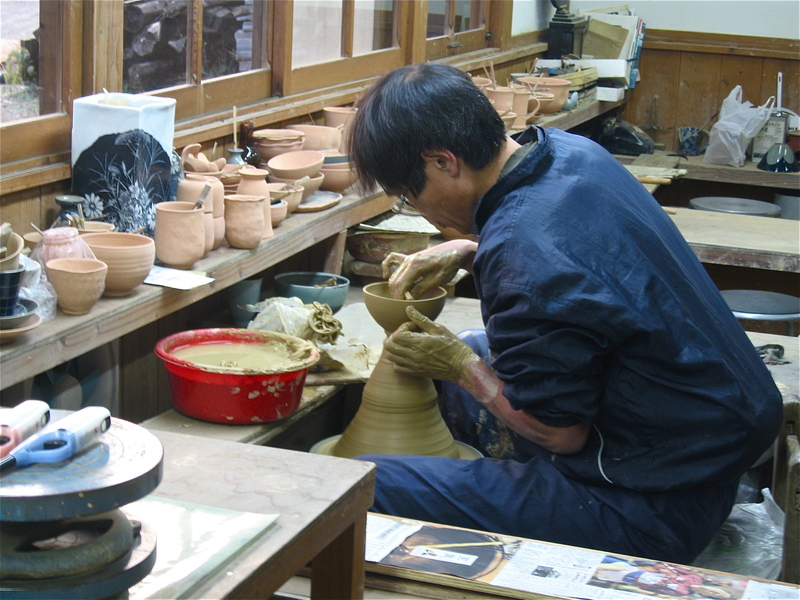 It may also involve numerous sacrifices- money, family, time, reputation- in order to perfect an art to a level that cannot be replicated by any other. 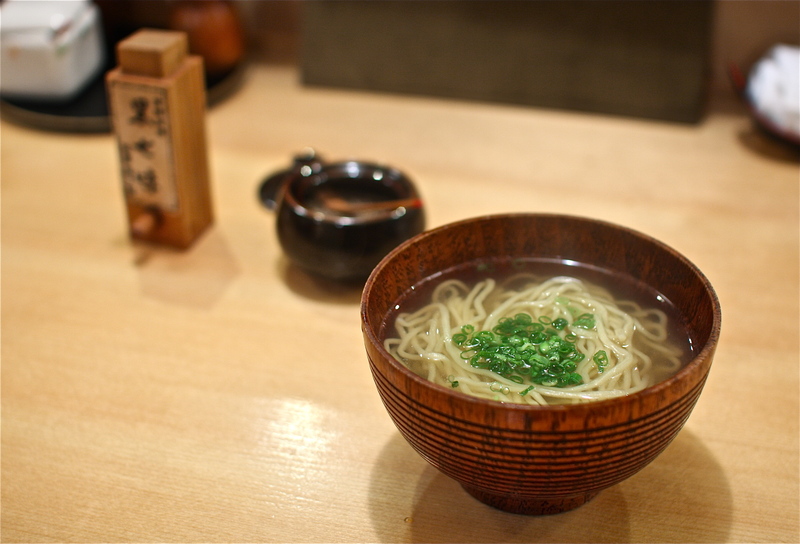 However, the end result is a product that is the finest in the world. 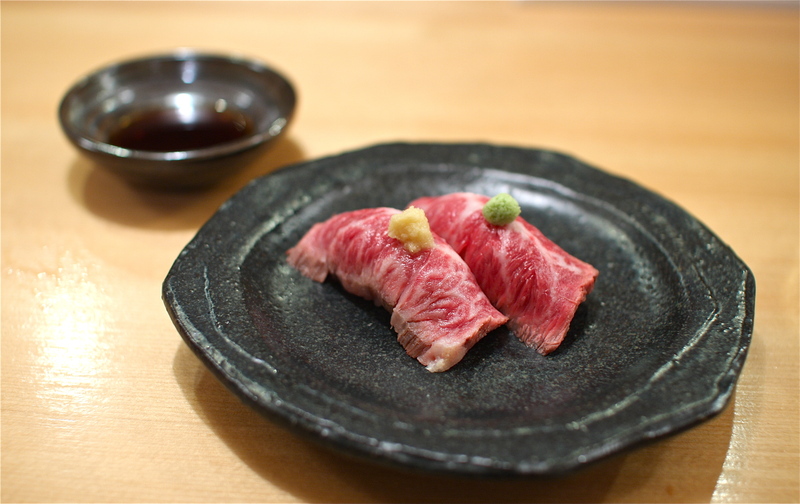 In a previous article, I described the culture of raising exquisite Japanese beef. 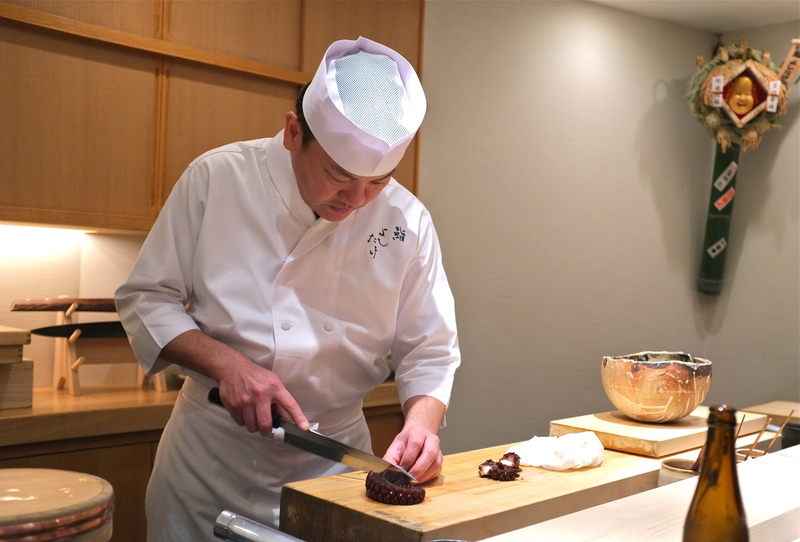 For the rest of the world, Kobe beef is regarded as the holy grail of cattle, but Japanese farmers have taken their kodawari to a whole different level. 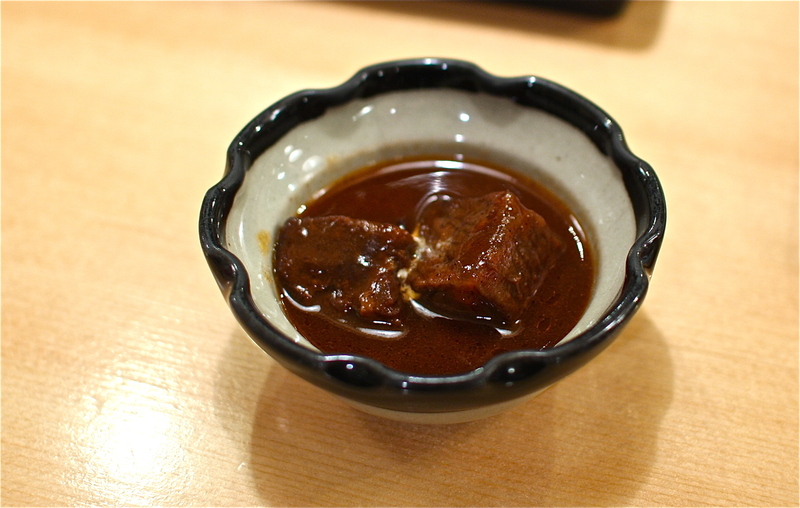 Many have dedicated their entire lives to kiwameru a certain type of brand name beef which is so ideal and perfect that it can silence any food critic. 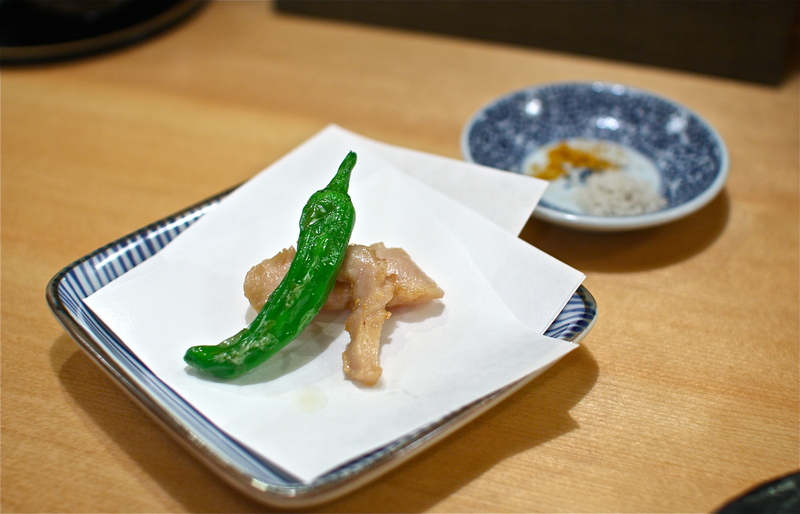 There is a similar, if not more competitive field for pork in Japan. 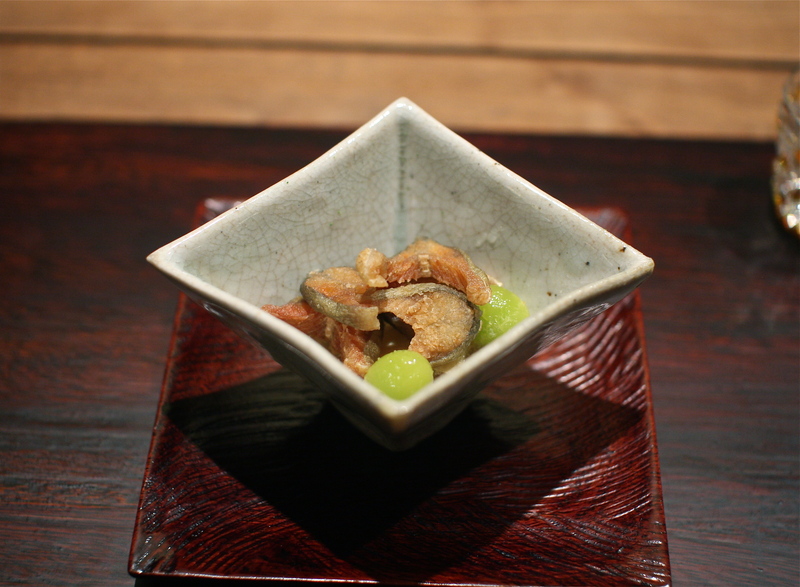 You may have heard of Kurobuta pork, as it is served in many fine dining restaurants in the US. 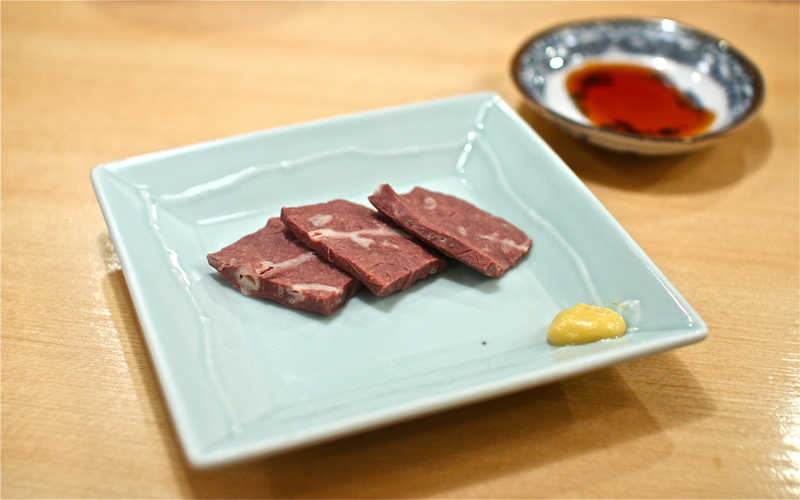 But Kurobuta pork is only the tip of the iceberg- in Japan it is common to find at least 5-10 different brands being offered at any time in a supermarket. 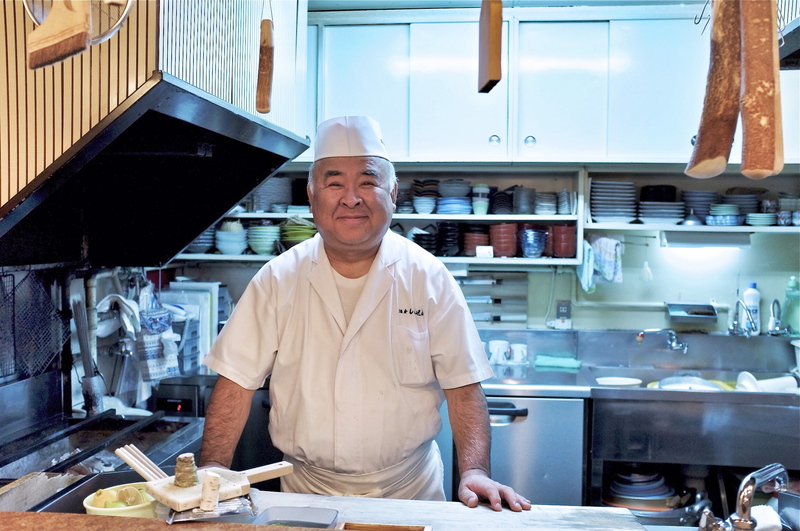 Chef Oishi is a man with a particular kodawari for fine pork, and he has dedicated his life to kiwameru the quintessential Japanese pork dish- tonkatsu. 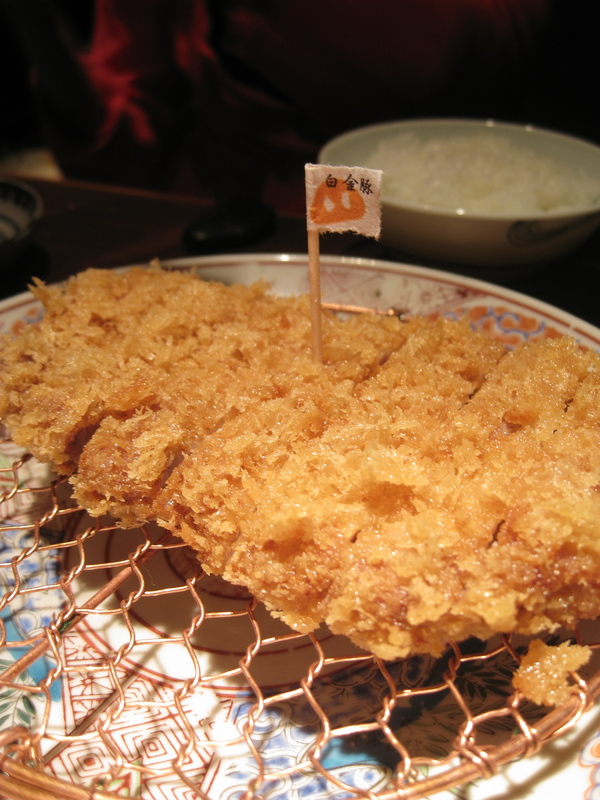 Tonkatsu, or deep fried breaded pork cutlet, is the ultimate comfort food. 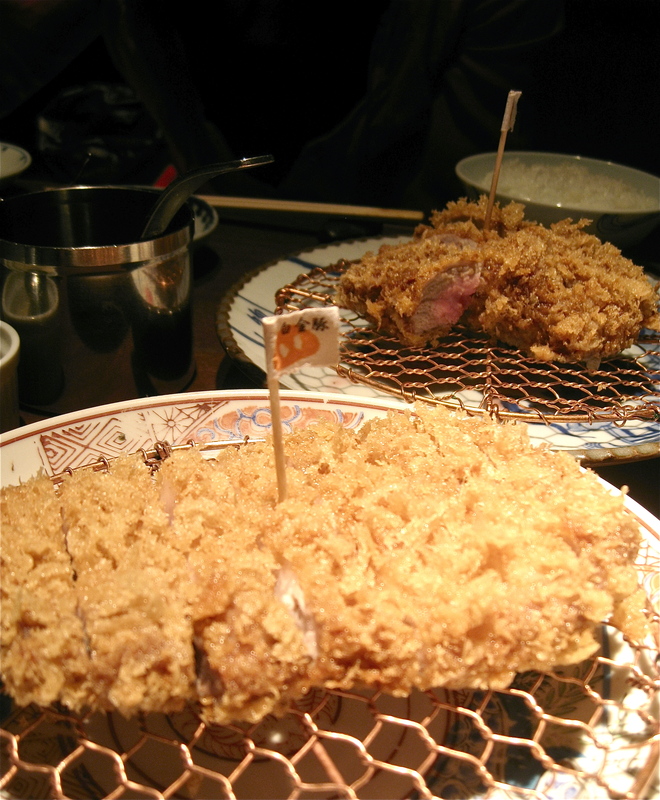 Hearty cuts of juicy pork meat with a crispy panko crust, drizzled with tonkatsu sauce, are loved by kids, housewives and businessmen alike. 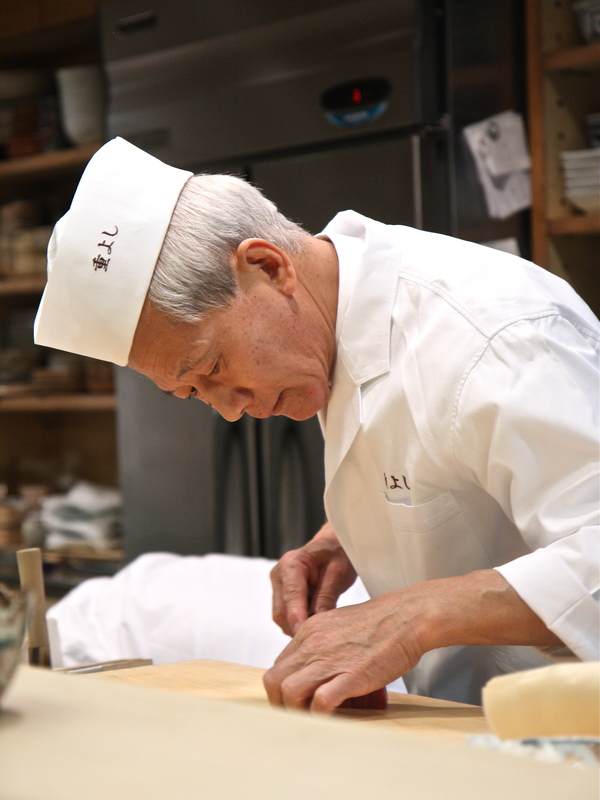 Chef Oishi got his first start in the culinary world in a tonkatsu restaurant, after which he went on to pursue French cuisine. However, in 2005, he came back to his roots. 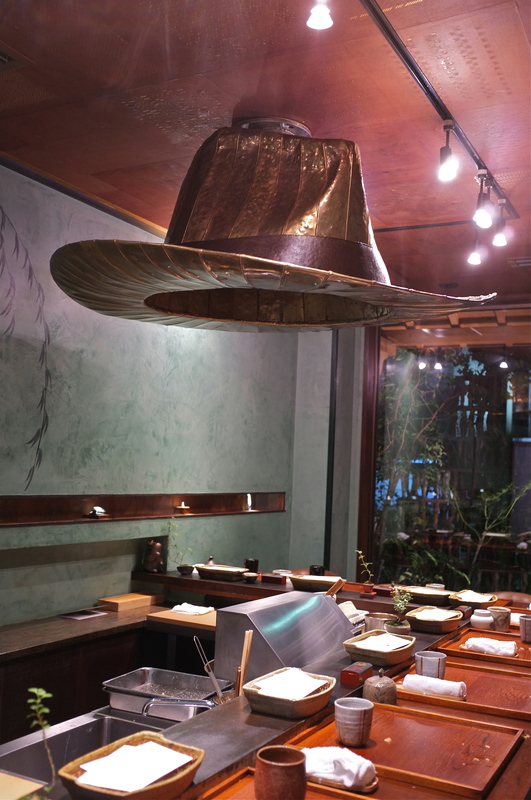 After traveling around the world in pursuit of the finest pork and the equally fine ingredients with which to make tonkatsu, he opened a tonkatsu restaurant called Butagumi (which means ‘pig clan’). 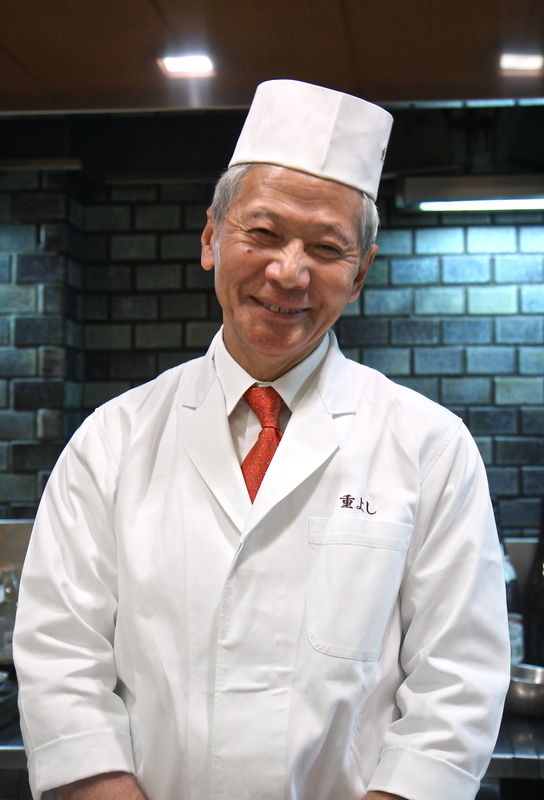 In his restaurant, he proudly serves what he calls the 究極のトンカツ, or the ‘ultimate tonkatsu’. 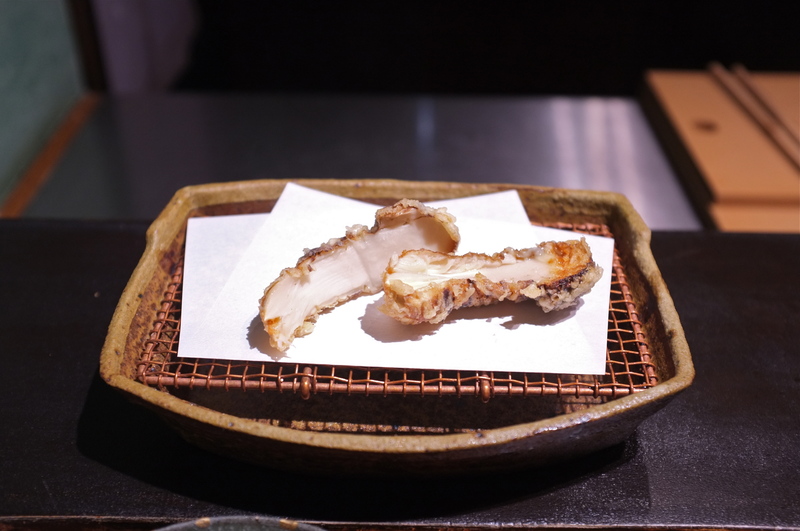 If you were impressed with Maisen and their selection of 5-6 types of pork on their tonkatsu menu, then you’ll be blown away with the 57 brands of pork that Butagumi may offer at any time on their ever changing menu. 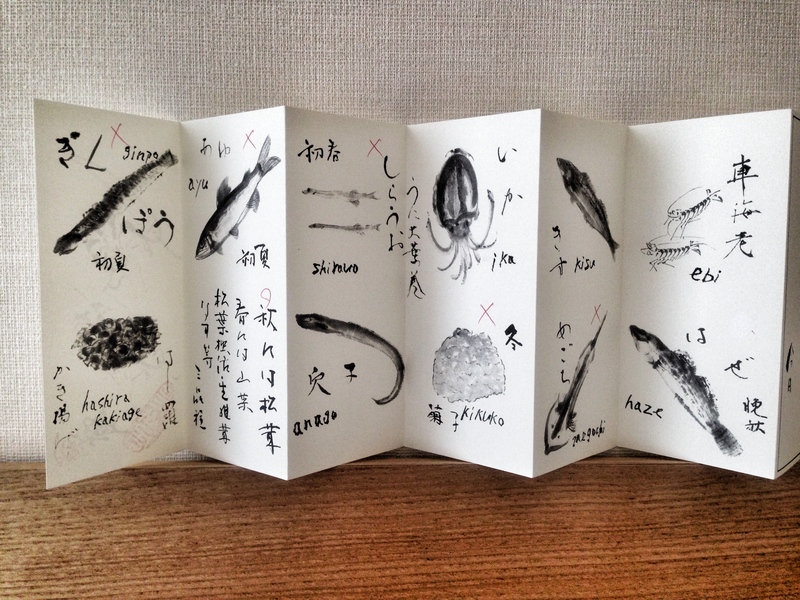 Butagumi’s menu reads like an encyclopedia of pork with detailed descriptions of their breed, diet, farming techniques, living space, evolutionary history and reputation. 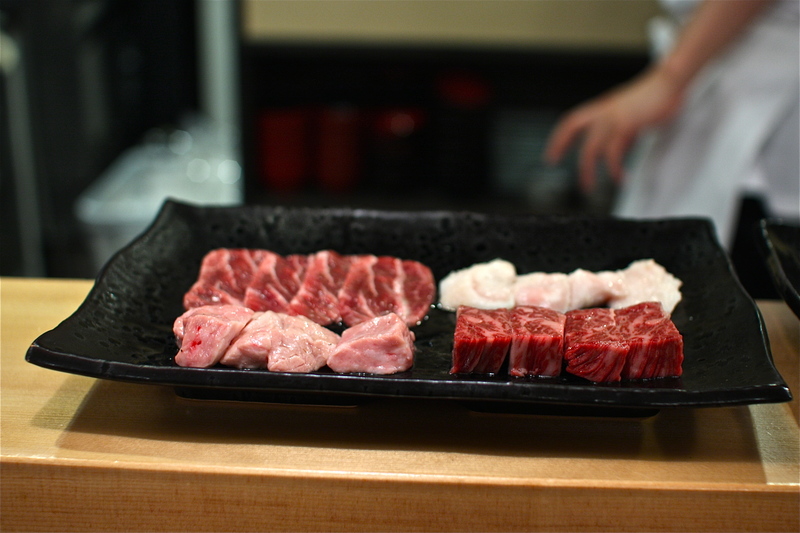 Each caption also describes the quality of the meat and the flavor of the fat. The general breeds of pork are Yorkshire, Duroc, Hampshire, Landrace, Berkshire, Spotted, Chester White and Poland China. 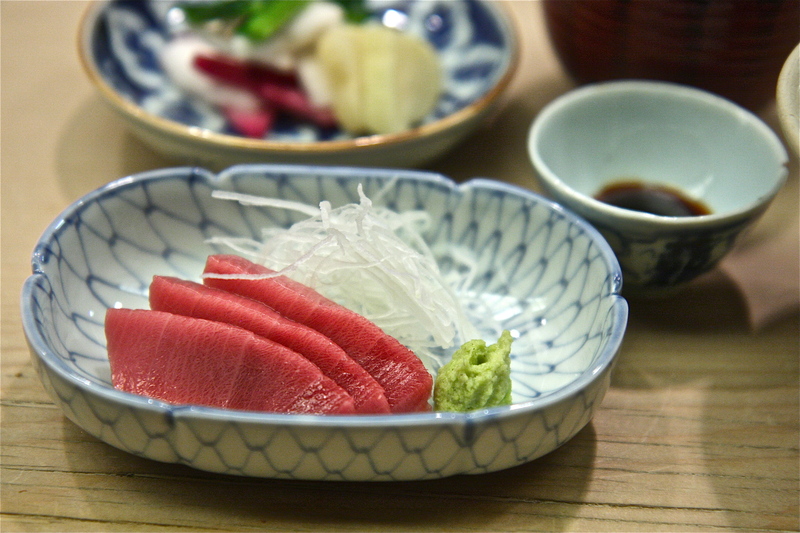 Other rarer breeds like the Okinawan Agu, Spanish Iberico and Chinese Meishanton also exist. 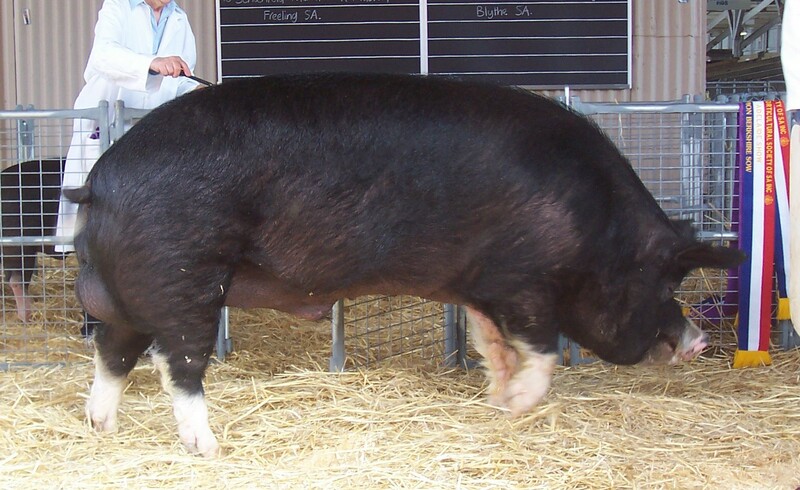 Most market pigs are crossbreeds of 2 or more of these main purebred stocks. 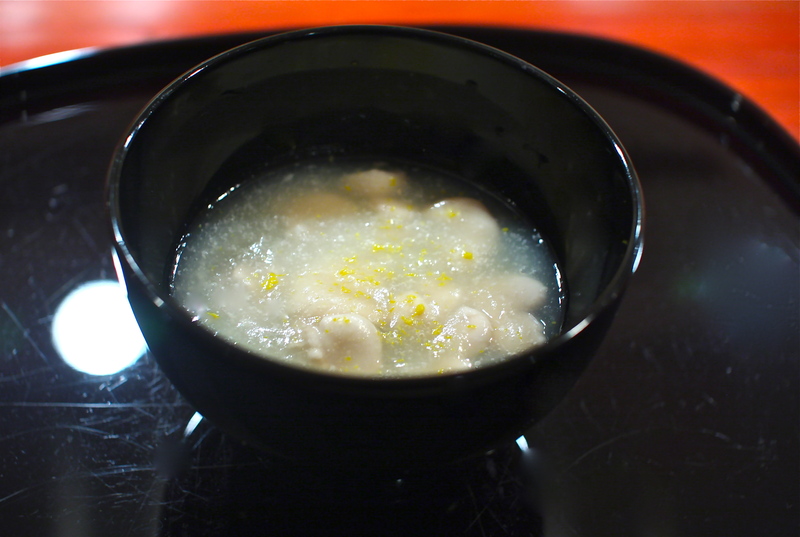 When was the last time that you ate pork? Do you know where that pork came from and what kind of breed it is? Probably not. 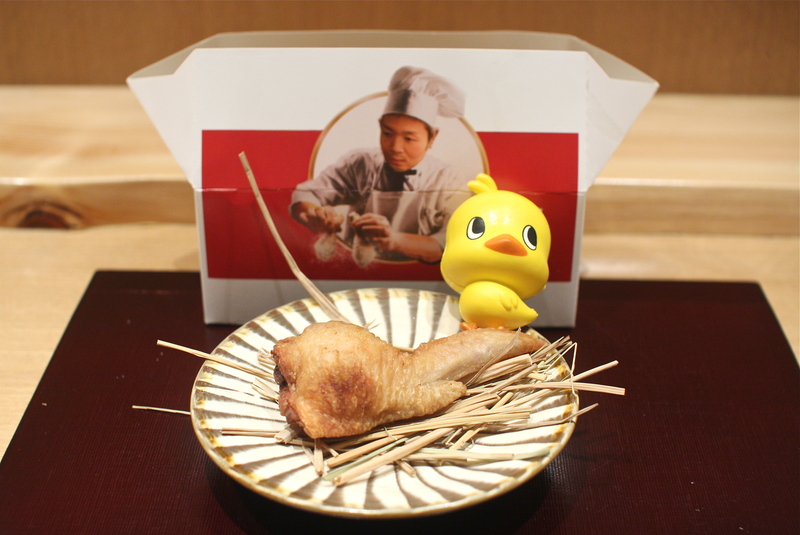 Butagumi believes in ‘traceability’ of food. 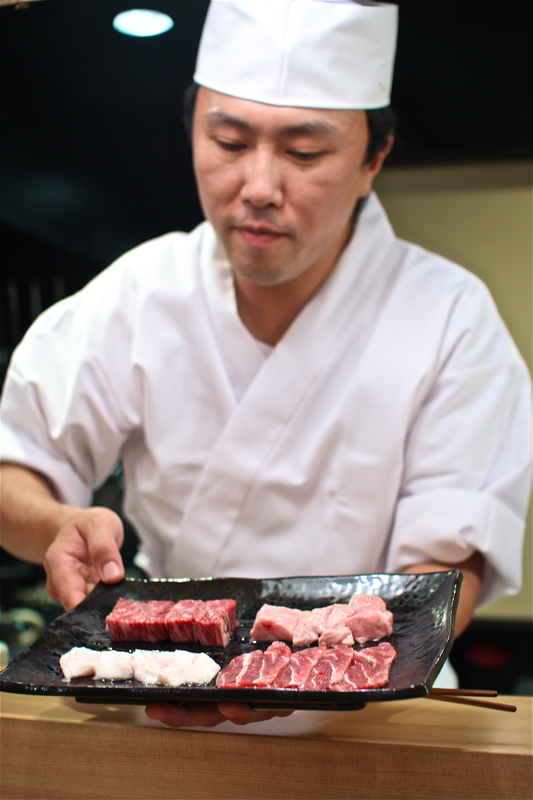 The majority of the pork brands featured on the Butagumi menu are Japanese and come from select farms. 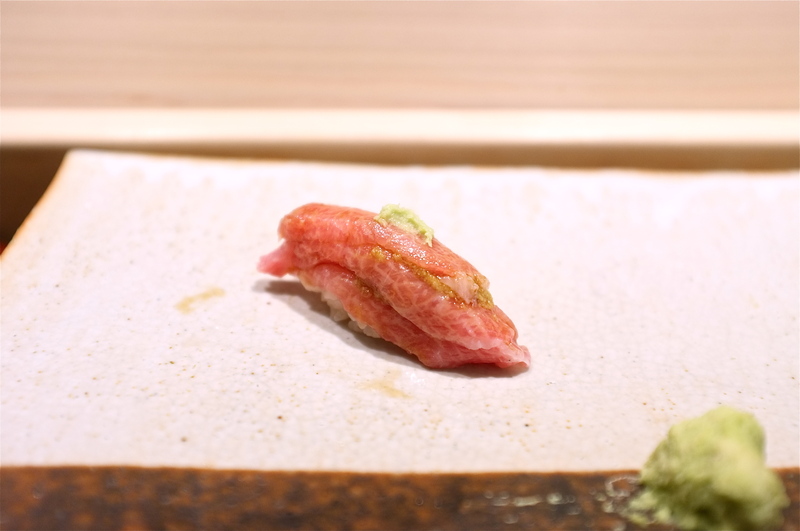 Farmers raise their pigs in a very specific way to achieve perfect texture and flavor, reflecting the Japanese kodawari philosophy to kiwameru their craft. 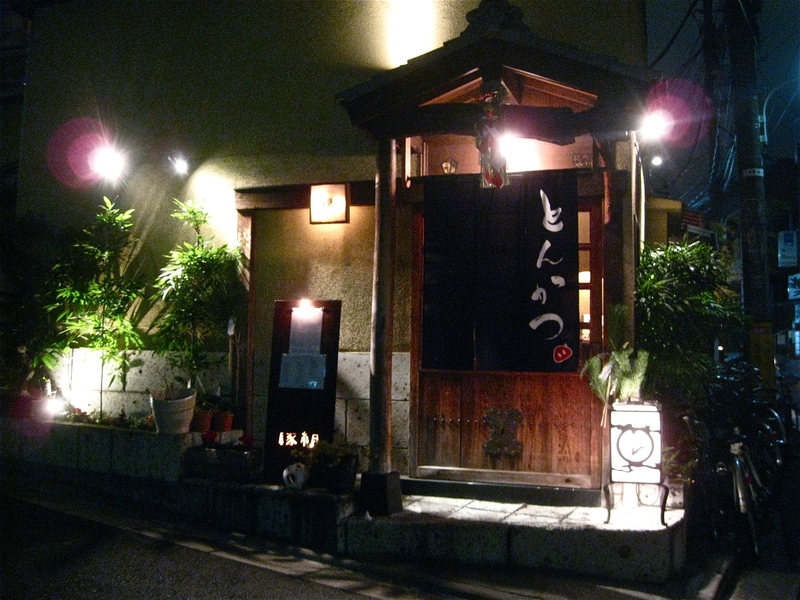 Butagumi is a restaurant in a quaint 2 story timber frame house in the middle of posh Nishi-Azabu that looks like a secret hideaway. This house has remained standing since 1958 even though all of its surrounding structures have been replaced by modern buildings and high rises. 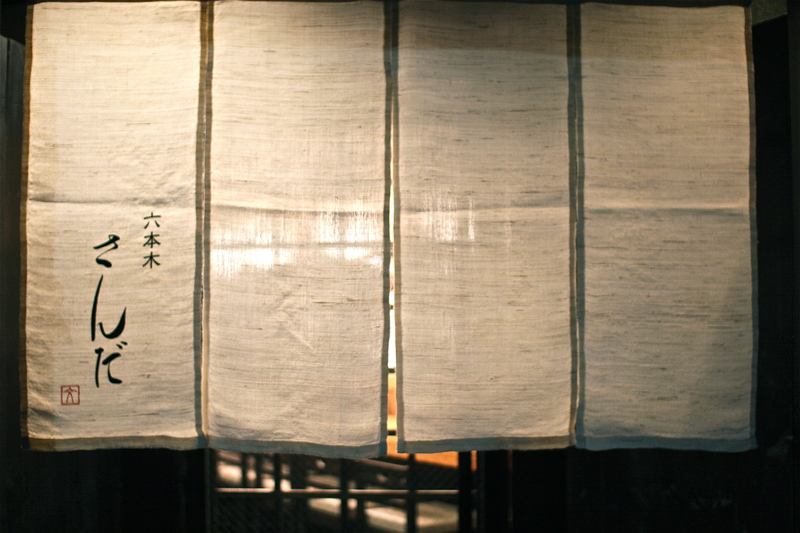 There are inviting lanterns and a white noren sign at the front entrance inscribed with とんかつ ‘tonkatsu’ to welcome you into this metropolitan museum of fine pork. 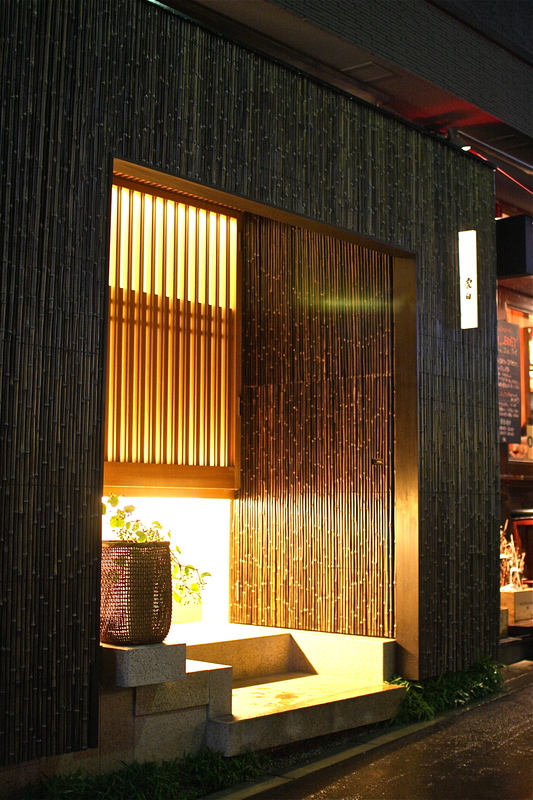 There are tables on both floors, but upstairs in the semi-private horigotatsu rooms is the place to be. 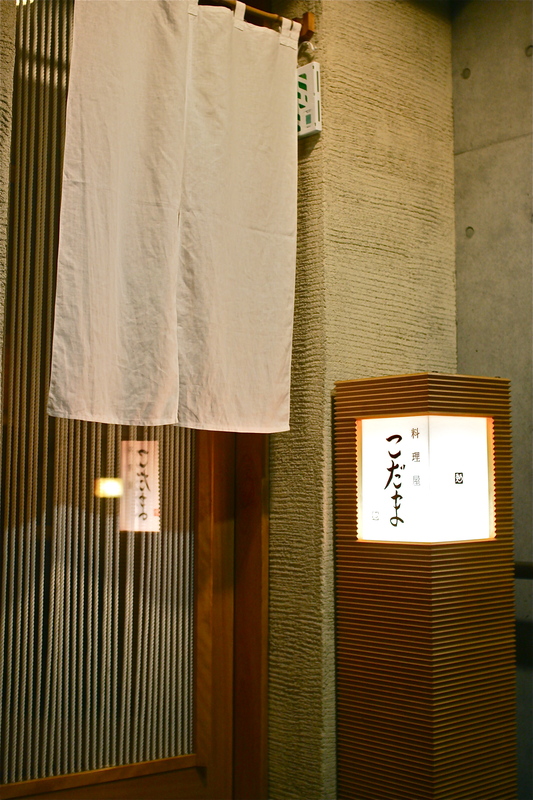 Butagumi is a purist restaurant, unlike Maisen which also offers deep fried shrimp, pan fried pork dishes and curries. 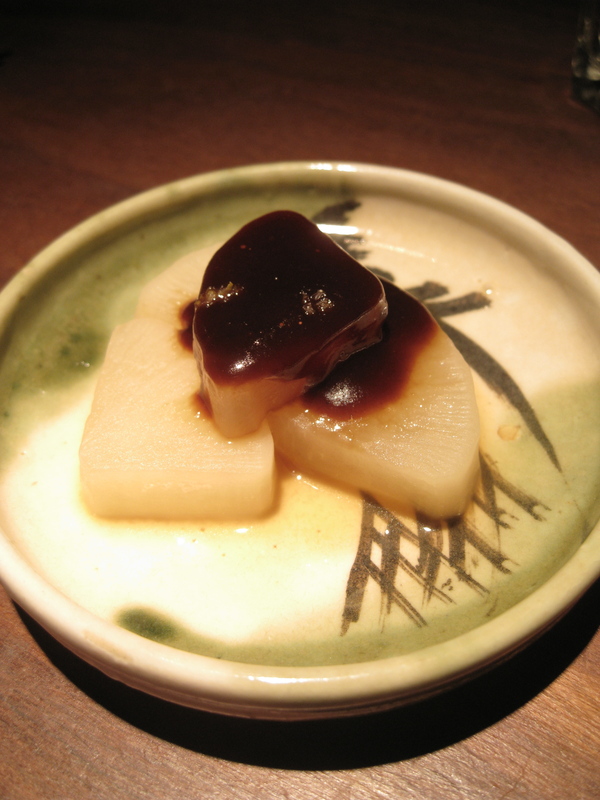 However, there are a few non-tonkatsu items on their menu such as braised daikon radish with miso dengaku sauce. 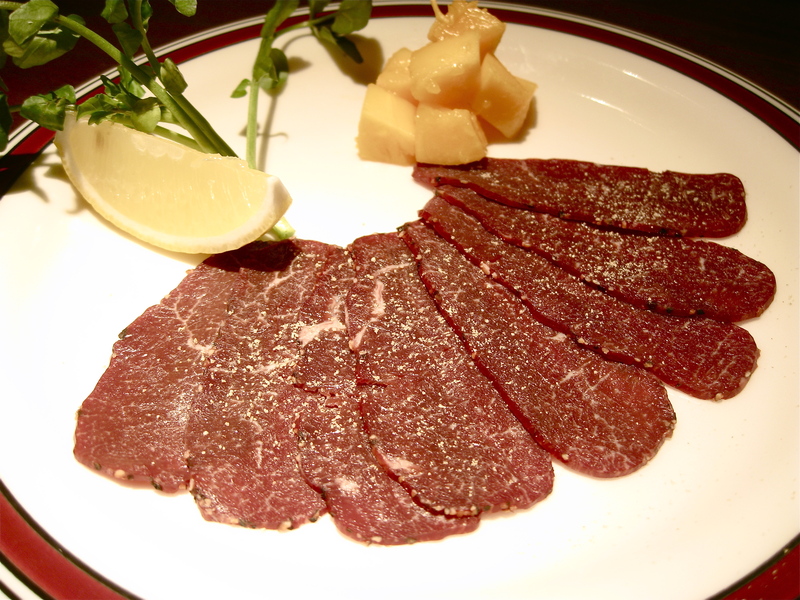 蝦夷鹿の生ハム, or Hokkaido venison carpaccio, seasoned with ground white pepper and garnished with cubes of sweet mango, was tender, light and smokey. 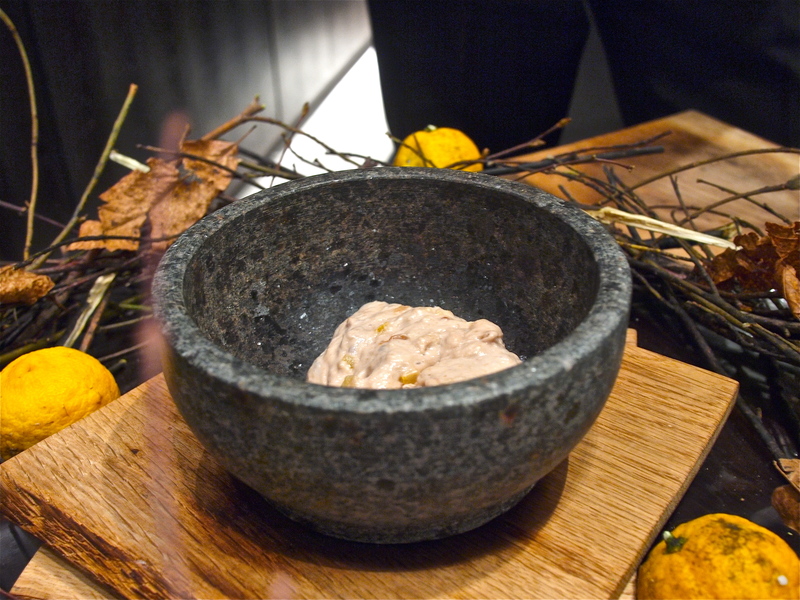 Iberian pork rillettes with a sprinkle of pink peppercorns was the perfect complement to our bottle of 2007 Vincent Gaudry Sancerre with its fresh and fruity flavors and silky tannins. 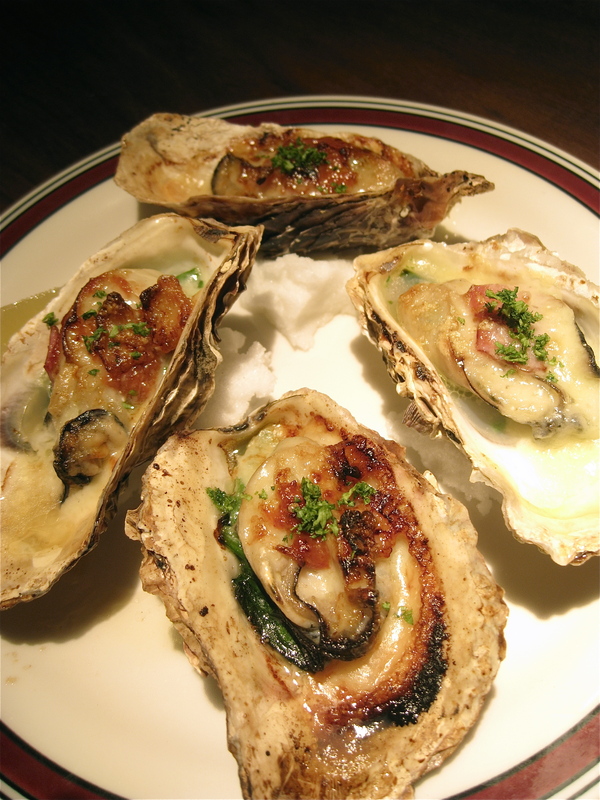 Mie Oysters gratinée was the daily special, and the plump oysters, nestled in their little beds with a blanket of toasted cheese and cream, were delicious. 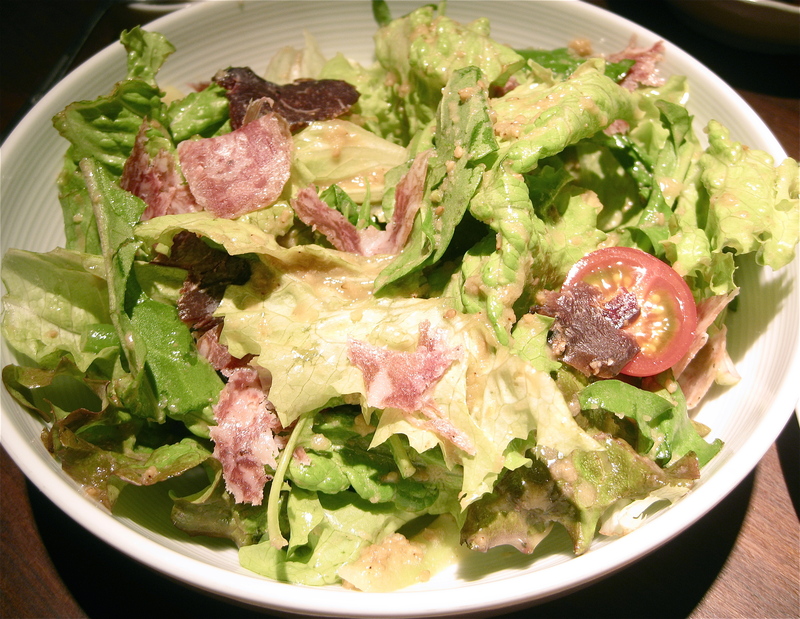 Of the several salad and vegetable dishes on their menu, the most popular is their Melimelo salad, a bouquet of fresh salad greens, cherry tomatoes and pork salami in a citrus miso dressing. 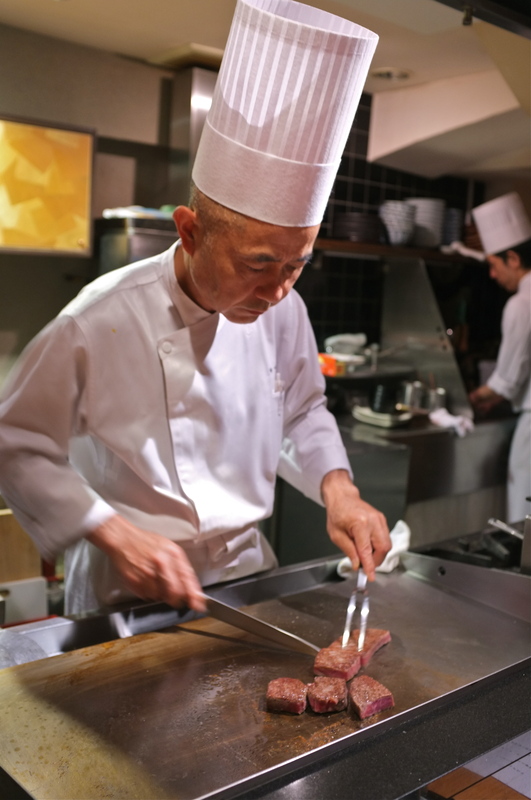 In Japan, tonkatsu is served in 2 cuts: ロース ‘rosu’, which is pork loin, and ヒレ’hire’, the leaner fillet. People choose the cut depending on their personal preference or their mood. 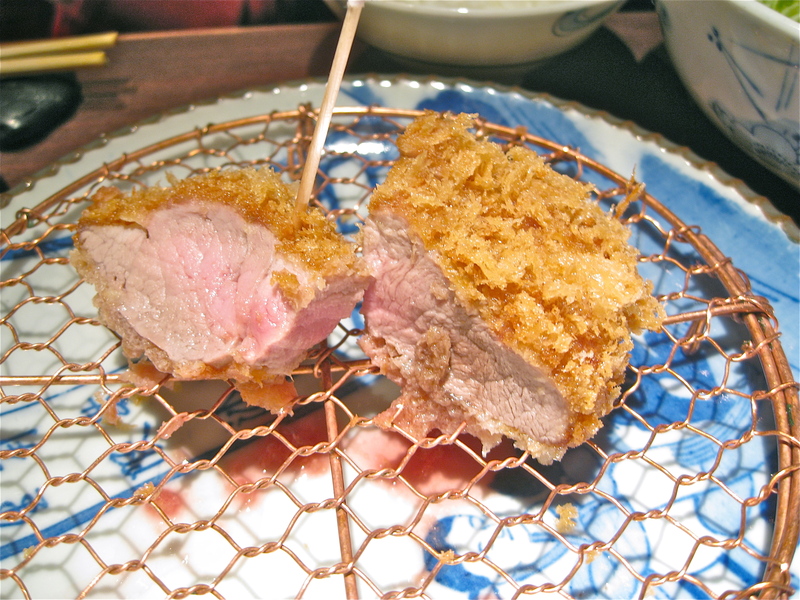 The pork is then dredged in flour, dipped in egg and coated with panko bread crumbs before being deep fried in oil. 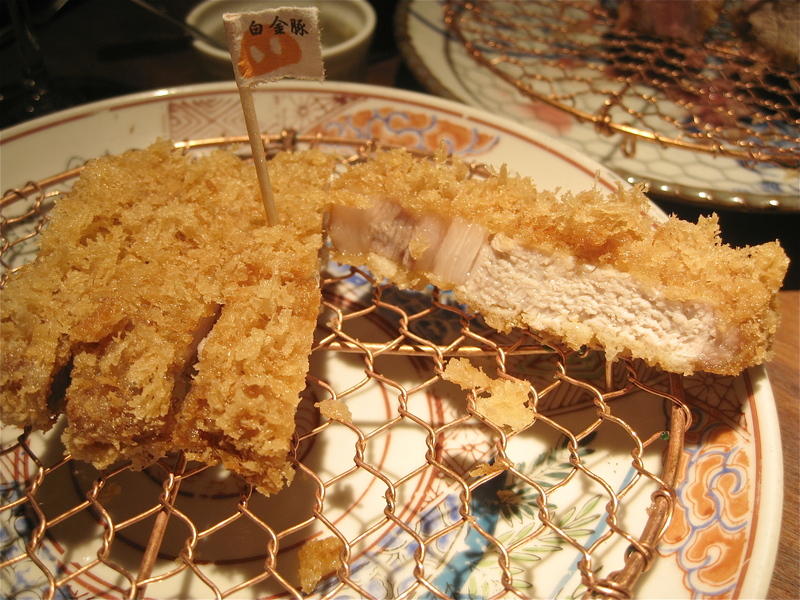 The finished product is served on a copper mesh which keeps the tonkatsu shell nice and crisp. 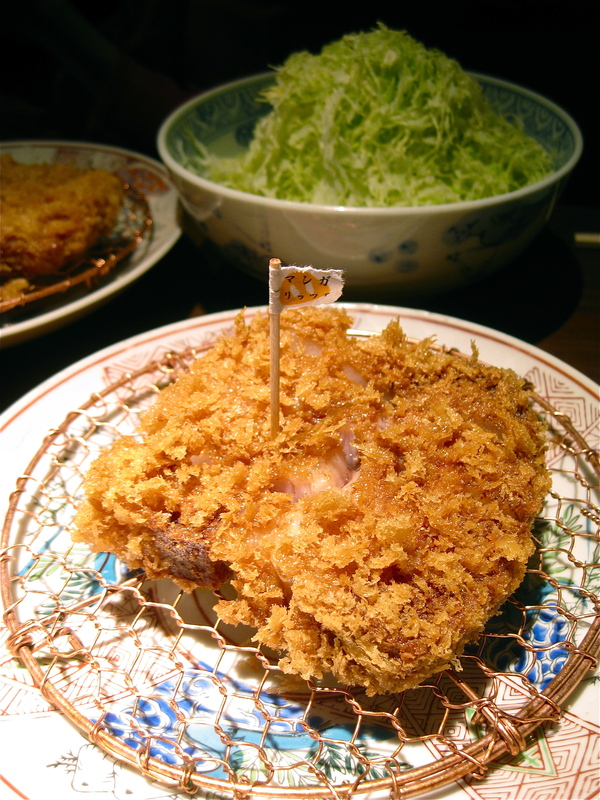 Tonkatsu is traditionally dipped in tonkatsu sauce, a thick vegetable based brown sauce that resembles Worcestershire sauce, and enjoyed with shredded cabbage, rice and miso soup. 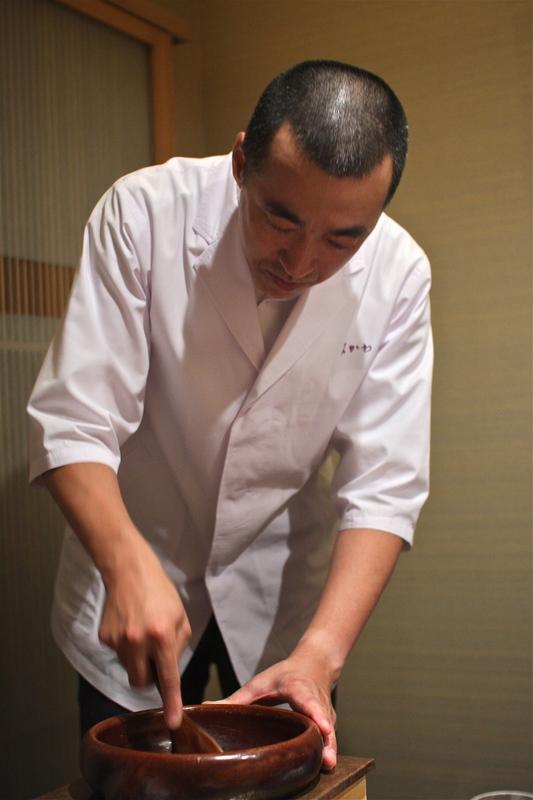 Chef Oishi takes his kodawari to the max in all of these ingredients for his ‘ultimate tonkatsu’. 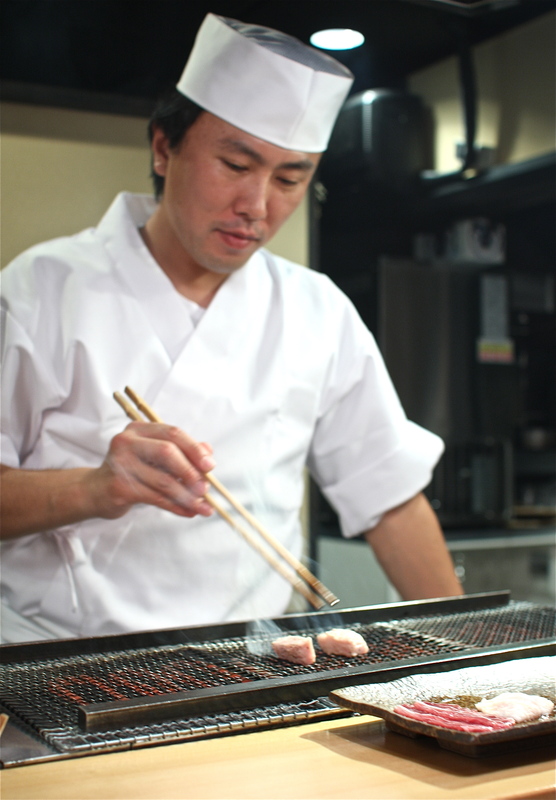 He uses a special blend of Taiyu sesame oil and cottonseed oil to achieve that perfect light and crisp exterior. 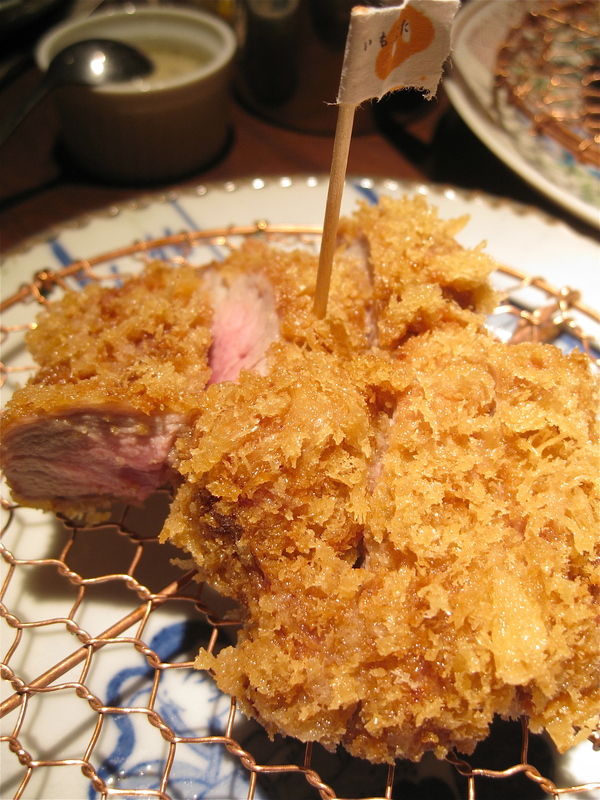 The panko bread crumbs are made from a special kind of bread that has a subtle sweetness to complement the pork. 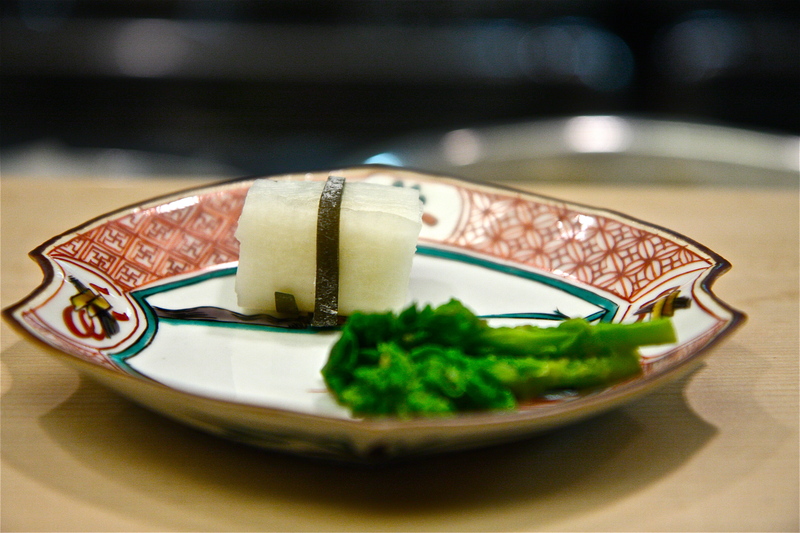 Succulent organic cabbage is sliced to order to maintain its freshness. 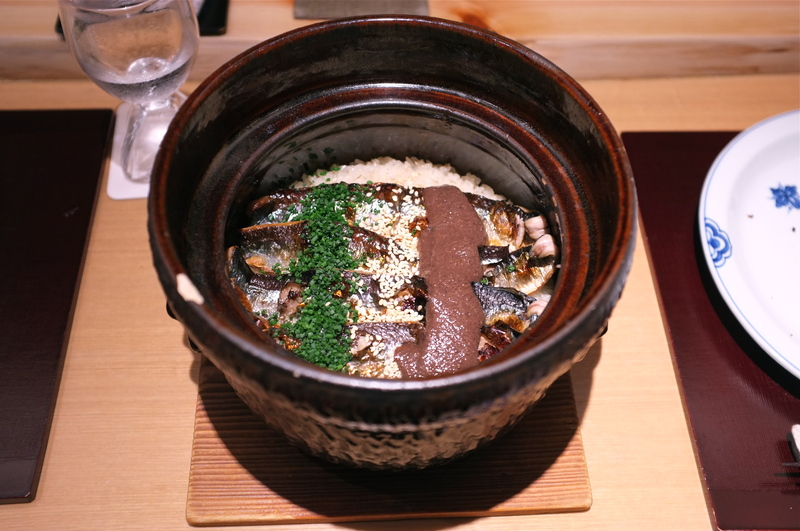 The koshihikari rice from Ibaragi prefecture is certified organic and steamed in a special rice pot. 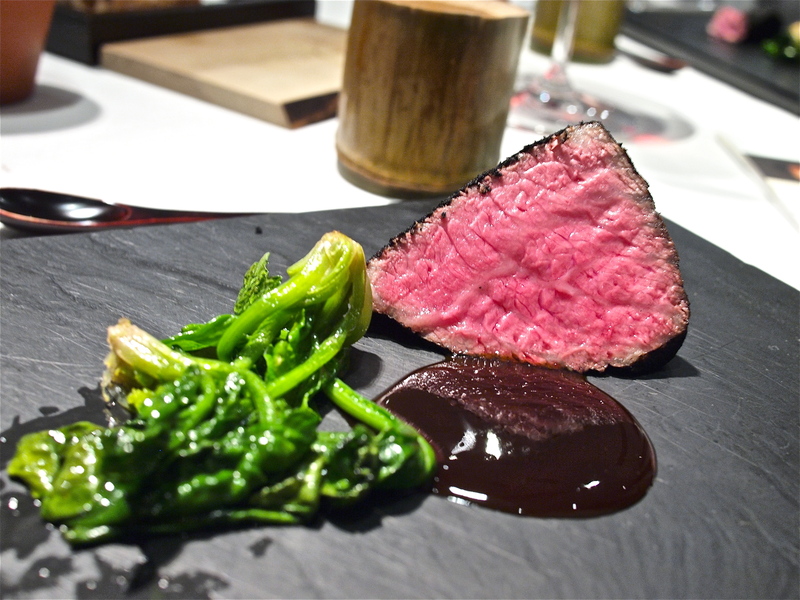 The meat is seasoned with Andes rock salt and organic white pepper from Ponape island in Micronesia. 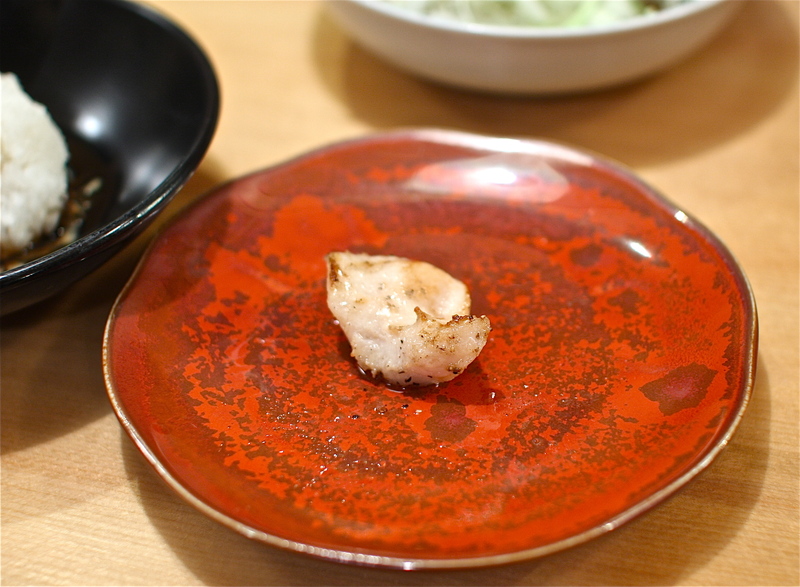 The tonkatsu sauce is made in-house, and it is recommended to dip the meat in a little bit of sauce with each bite rather than to drizzle the sauce over the meat. 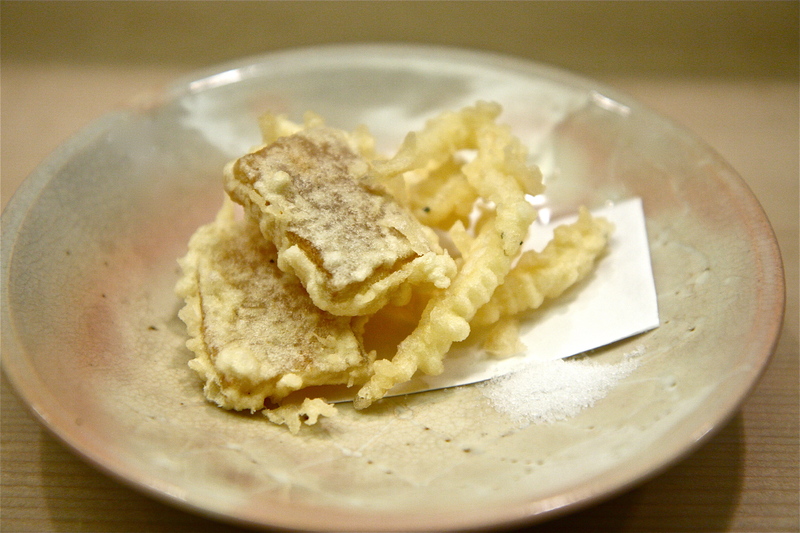 This way the deep fried exterior remains light and crisp during the entire meal. 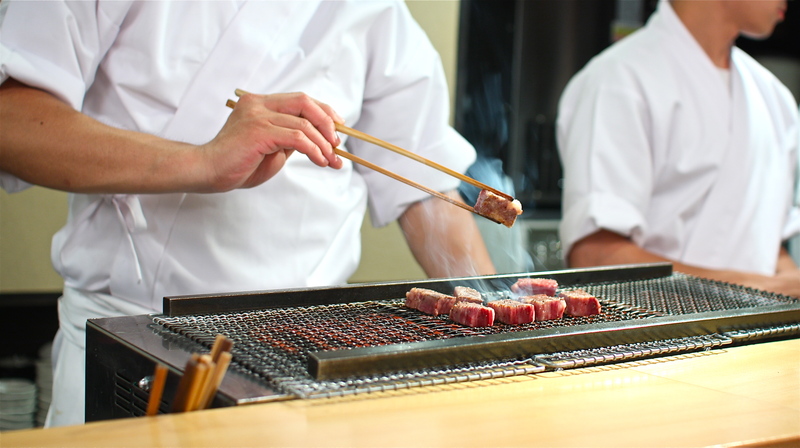 Chef Oishi also recommends enjoying some of the meat with a little bit of salt to enjoy the true inherent flavors of the pork. All of these rules are just a part of the chef’s kodawari which he wants to share with everyone. One would be a fool not to take this pork master’s wise advice. A lot of the pork that was being offered that night was new to me. 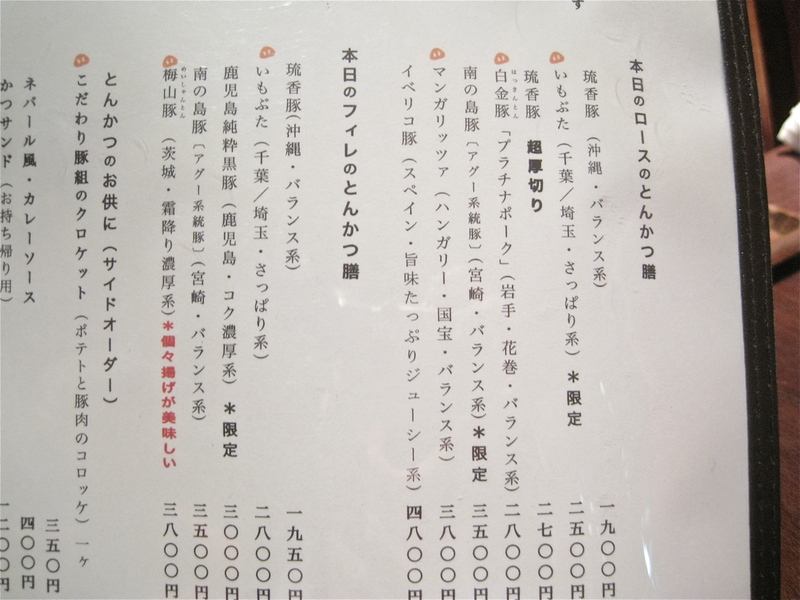 I was familiar with Tokyo X, SGP (Super Golden Pork), Meishanton, and Kenton, but I had never heard of Golden Boar Pork, Amami no Shima pork, Yonezawa Sangen, or Ryukaton. 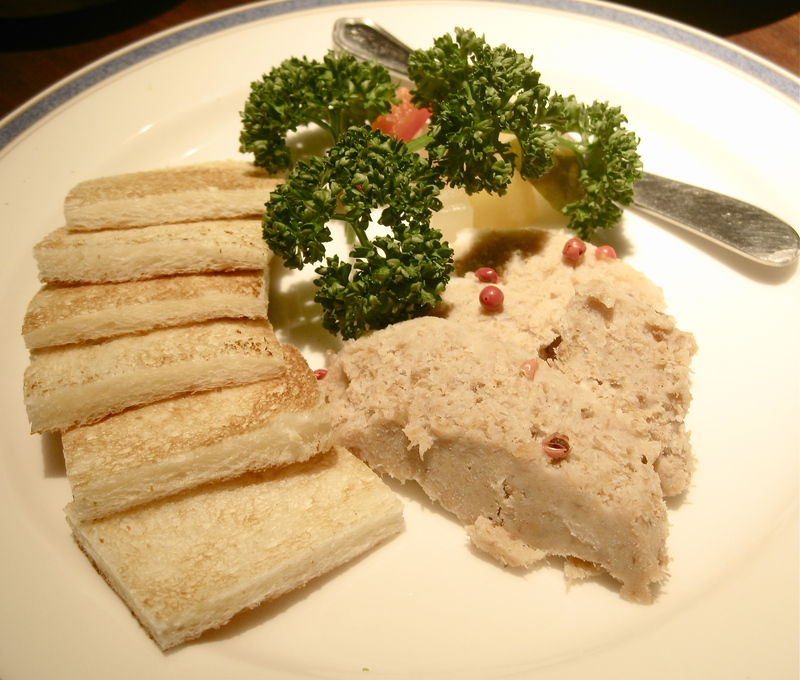 We started with a loin cut of 白金豚 hakkinton, also known as Platinum Pork, which is a crossbreed of Berkshire, Yorkshire and Landrace. 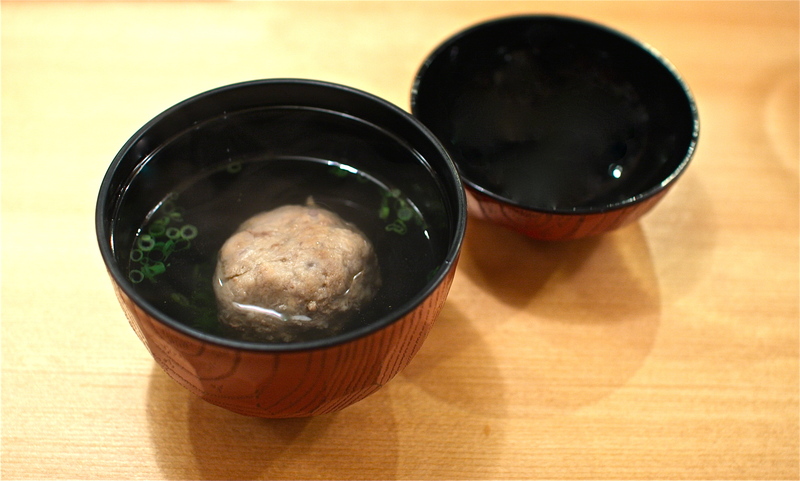 They are raised in Iwate prefecture, and are exclusively given natural spring water from the local Okubane mountains for drinking. 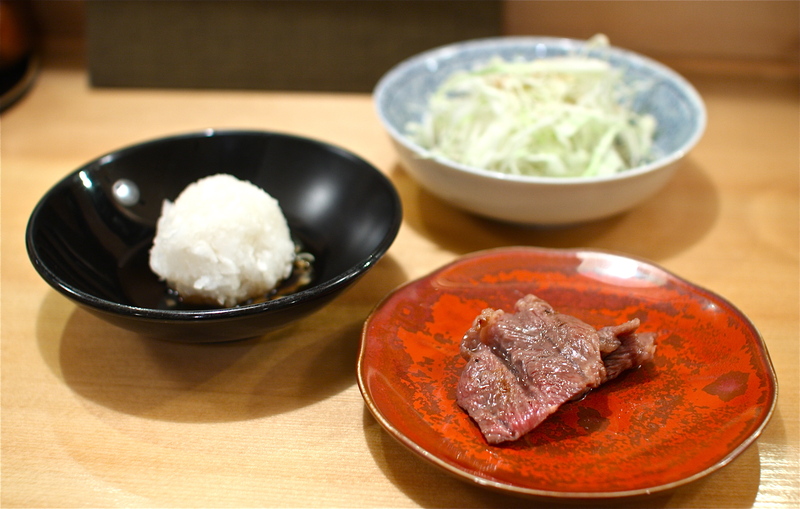 The meat was superbly sweet, and its fattiness was well balanced. 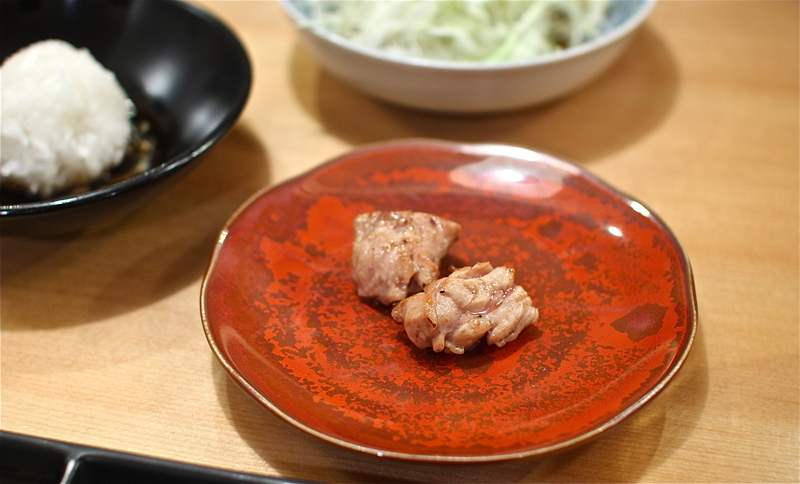 I was excited to try the loin cut of Mangalitsa pork. I’ve been hearing about this prized Hungarian pork all year, and how it’s all the rage in fine dining restaurants around the world. 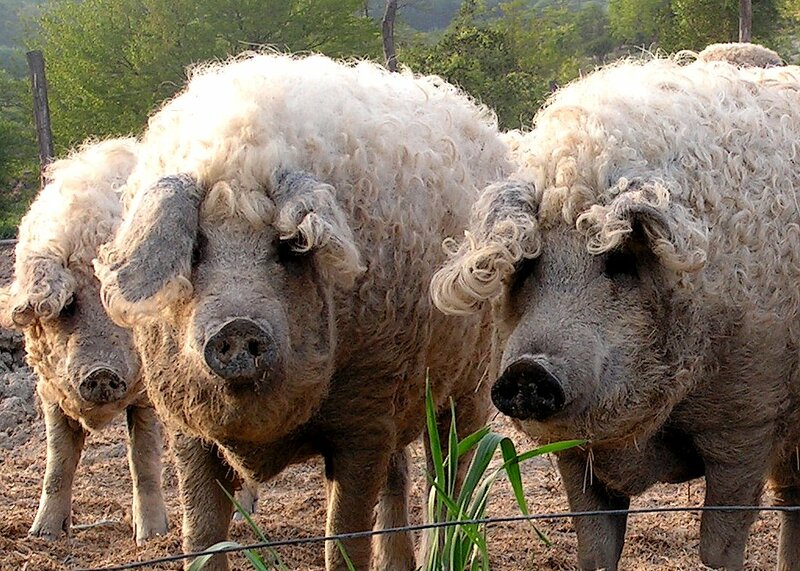 Unlike traditional pigs, these wooly pigs have thick curly hair which can be yellow, red, grey or black depending on its type. Although most breeds of pigs are ‘meat-type’ and produce lean meat, the Mangalitsa is an extreme ‘lard-type’ breed which produces marbled juicy meat that is dense in flavorful fat. They’re primarily raised on pumpkins and acorns. The Mangalitsa (spelled Mangalica in Hungarian), was first bred in the 1830’s by the Hungarian Royal Archduke Jozsef. However, after the collapse of the Austro-Hungarian Empire in WWI, coupled with the higher demand for cheaper meat-type pigs, the Mangalitsa almost went into extinction. 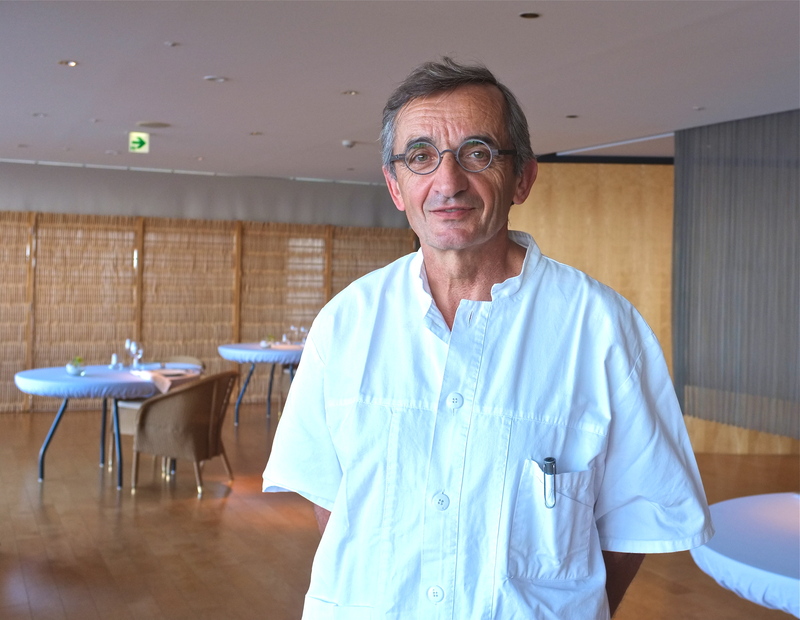 Now Mangalitsa production is back on track due to dedicated farmers, and its demand is rising from pork aficionados who have fallen in love with its unique flavor. Although Mangalitsa pork has more than double the marbling of average pork, it tastes lighter and cleaner due to the fact that the fat is more unsaturated and melts at a lower temperature. 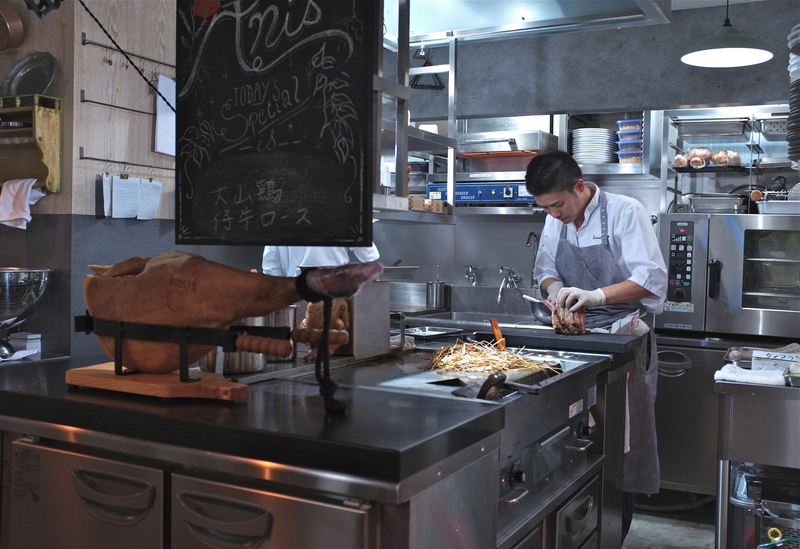 Did you know that the first Mangalitsa pig ever exported to the US was sold to The French Laundry in 2006? 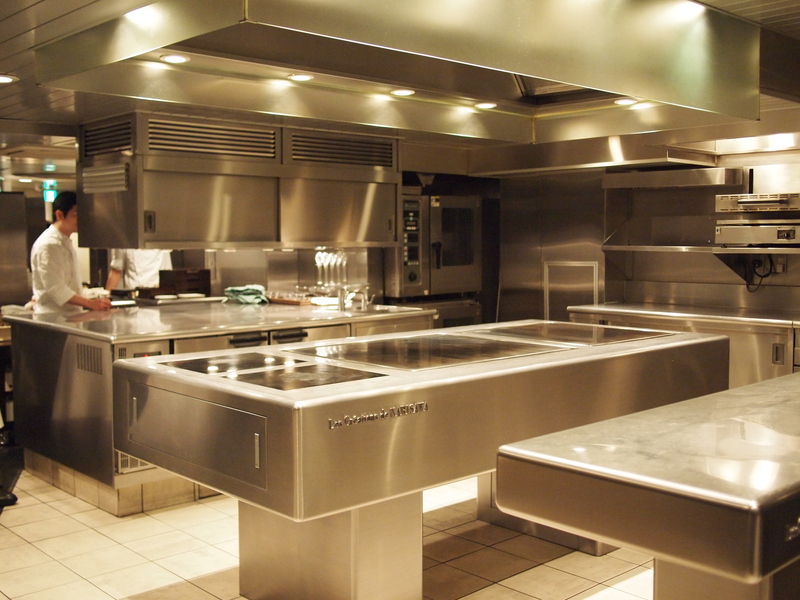 Way to go Chef Keller. 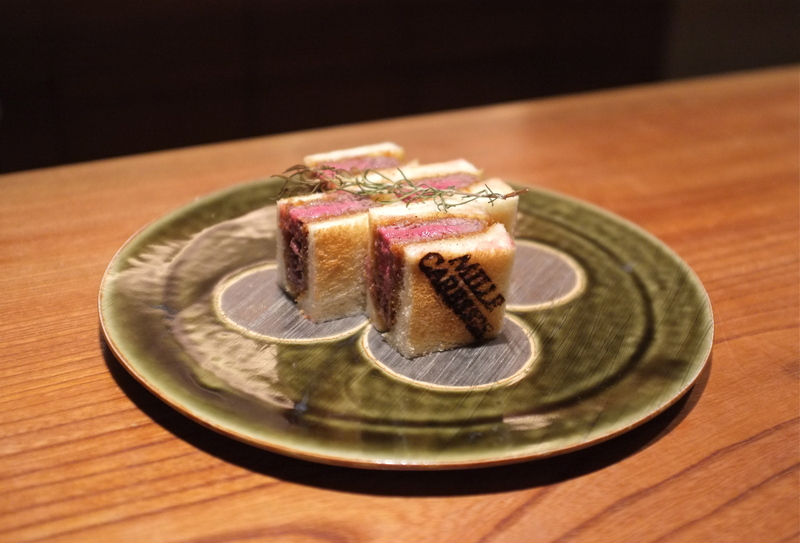 As you can see on the cross section of the Mangalitsa tonkatsu, there’s an overwhelming presence of fat with occasional sections of meat injected within to make a barcode pattern. Surprisingly, this famed Hungarian treasure, which shares the same DNA as Jamón Ibérico, was light, refreshing and delicate with no heavy aftertaste. 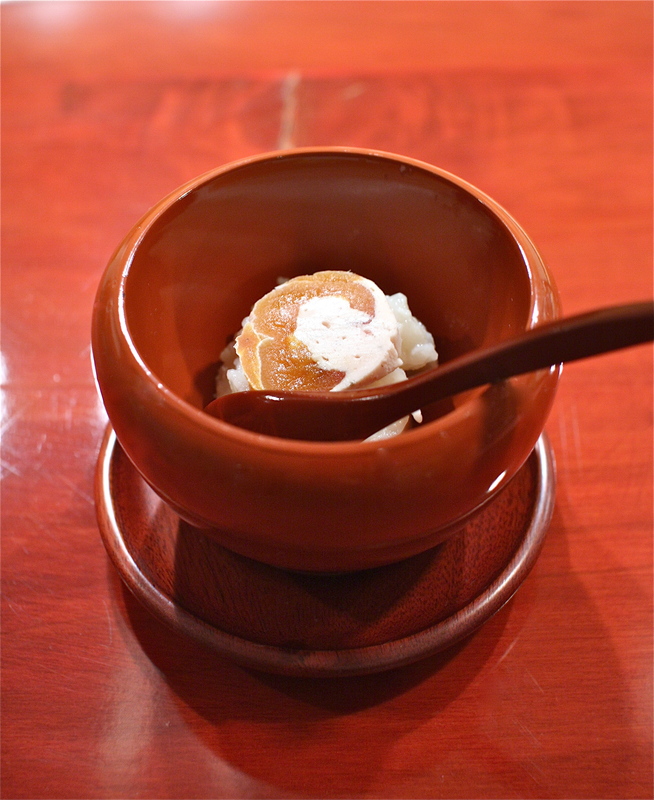 いも豚 imobuta, which literally means ‘potato pork’, is named so because this breed is predominantly raised on starchy vegetables like sweet potatoes, tapioca and sugarcane. 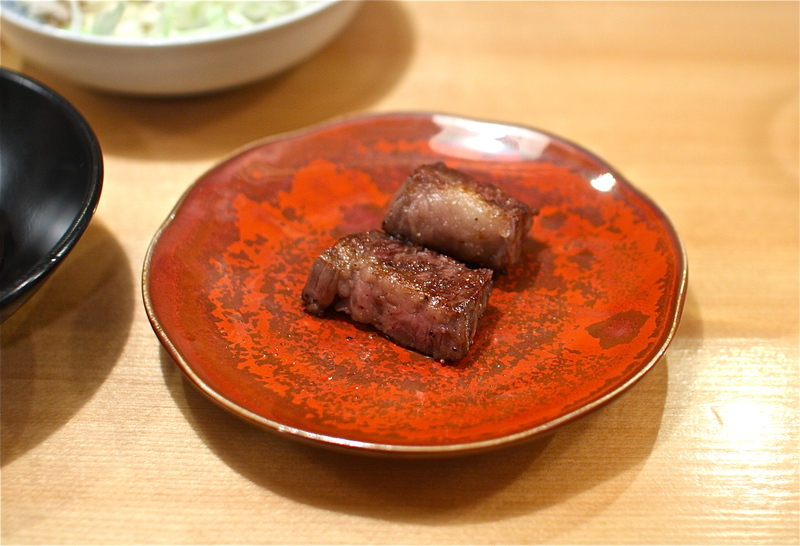 Imobuta is a crossbreed of Landlace, Yorkshire and Duroc, and is prized for its light flavor and minimal gaminess. 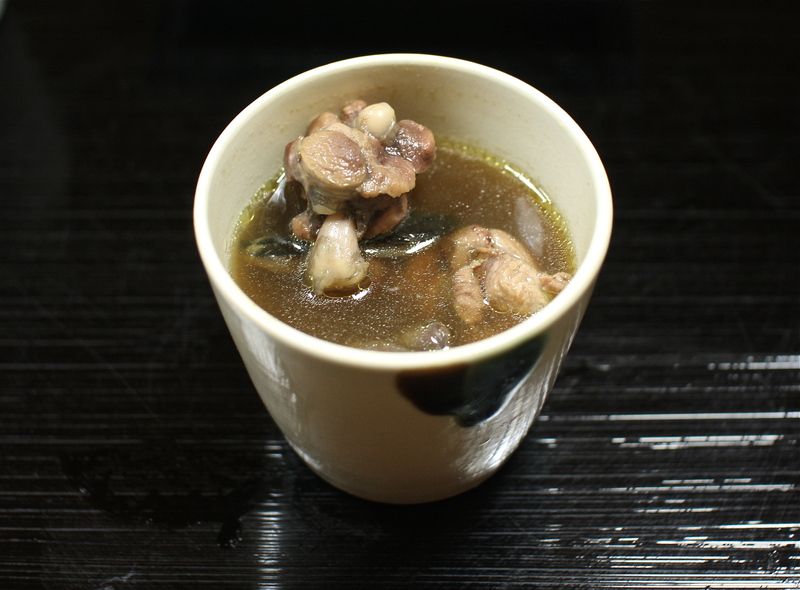 It is believed that the potato starches, in addition to glutamine and asparagine from the other components of its diet, produce a unique level of umami that renders this lean meat sweet and delicate. 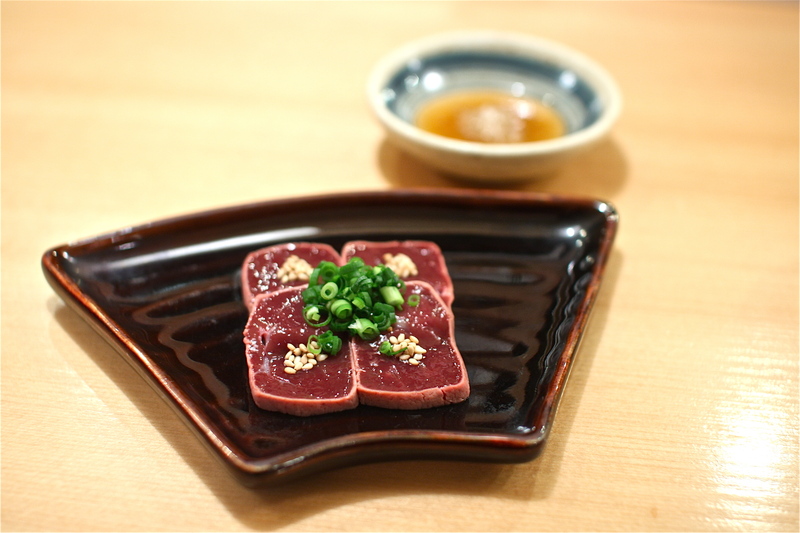 These fillet cuts of imobuta were lean and light, and cooked to maintain a rosy pink color in the center. 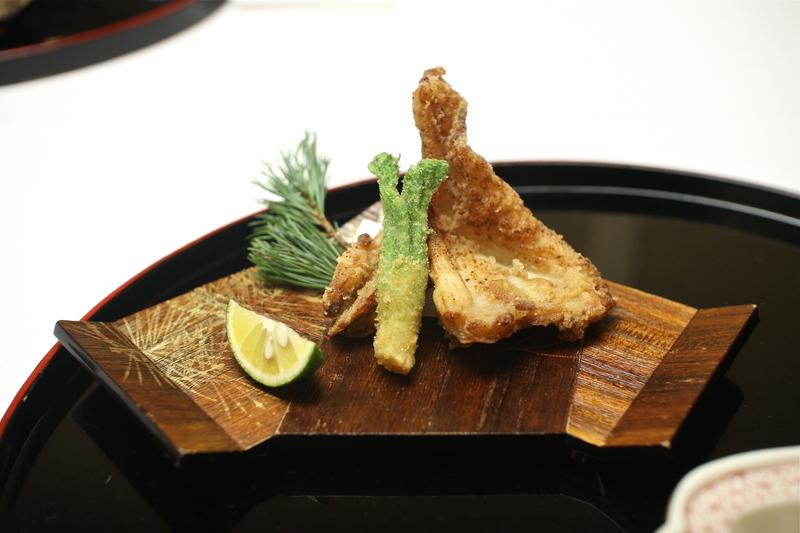 With a high protein to fat ratio, these delightful pieces of imobuta tonkatsu almost tasted like veal. 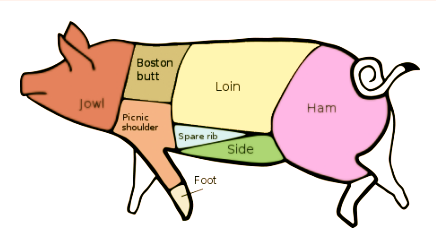 With the extensive list of pork breeds that you can choose from, it’s easy to get lost. 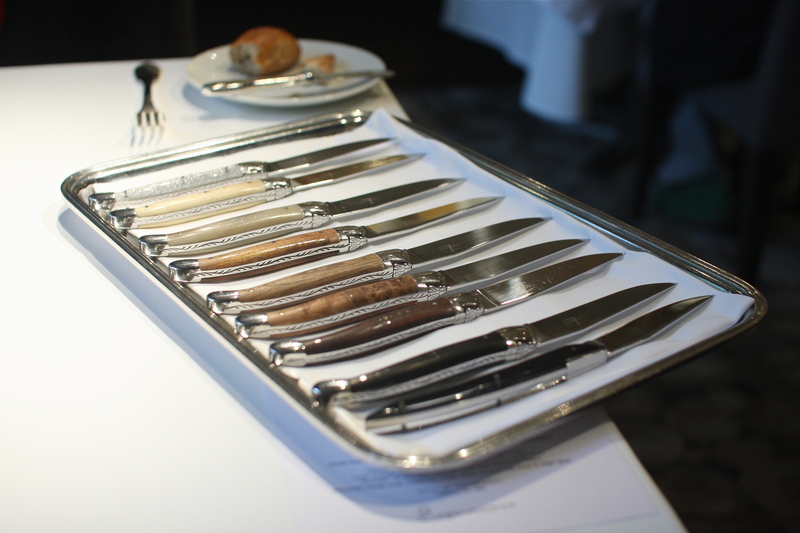 How do you go about choosing what to have for your meal? 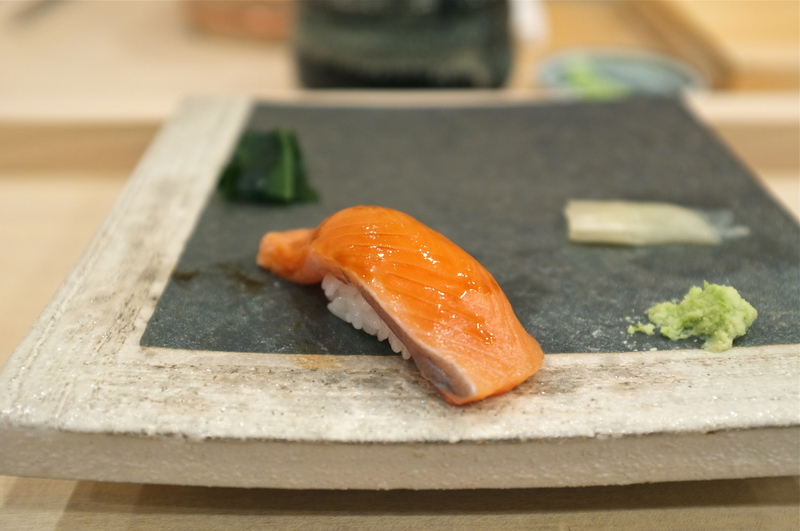 The servers can usually guide you depending on whether you’re looking for something light and lean, fatty and dense, or juicy and full of umami. 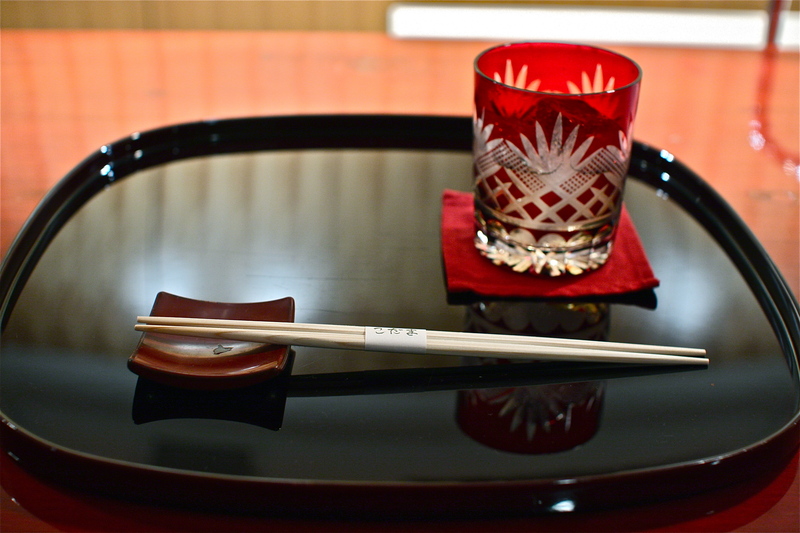 If you’re still torn, you can order the Butagumi-zen set which will bring you a sampler of small tonkatsu morsels, each made with a different cut of pork. 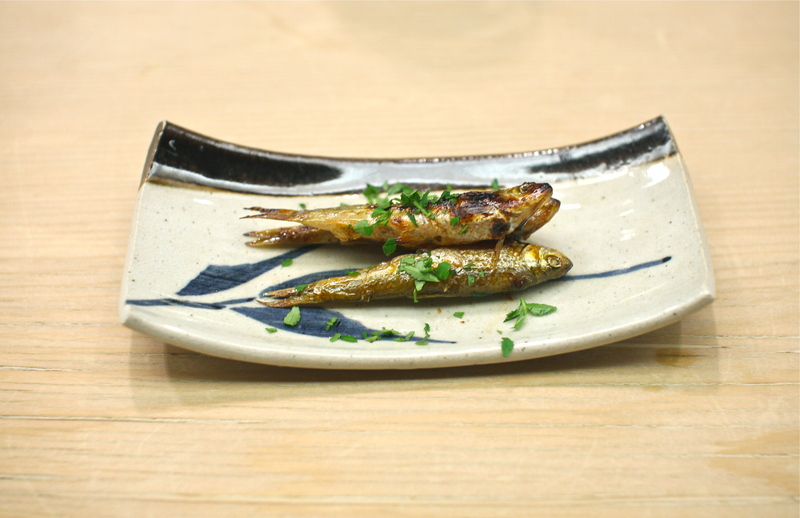 These end up being more like hitokuchi katsu, small morsels of ‘one-bite cutlets’, which won’t give you the same satisfaction as finishing a whole thick cut of juicy tonkatsu. 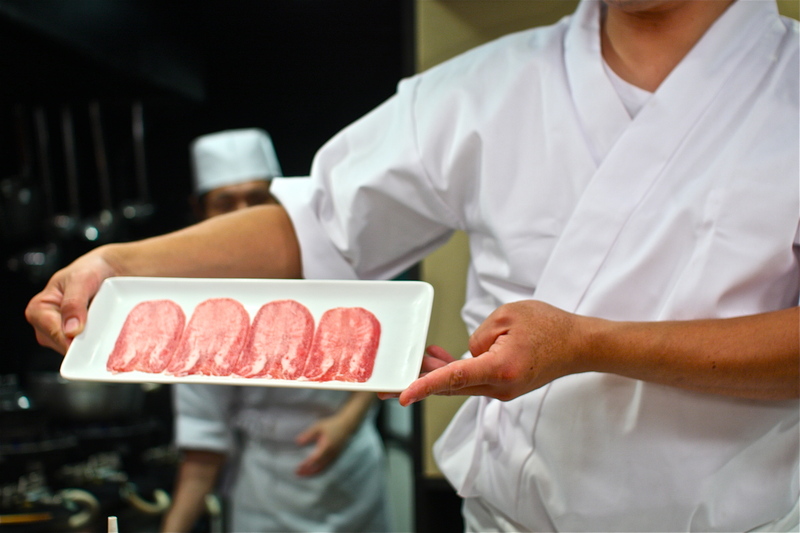 Whatever you end up ordering, a visit to the Butagumi pork museum is sure to open your eyes to a whole new world of pigs and the artisans who love them. Random trivia: Did you know that pig’s ears are notched so that farmers can identify what month they were born and which sow they were born from?